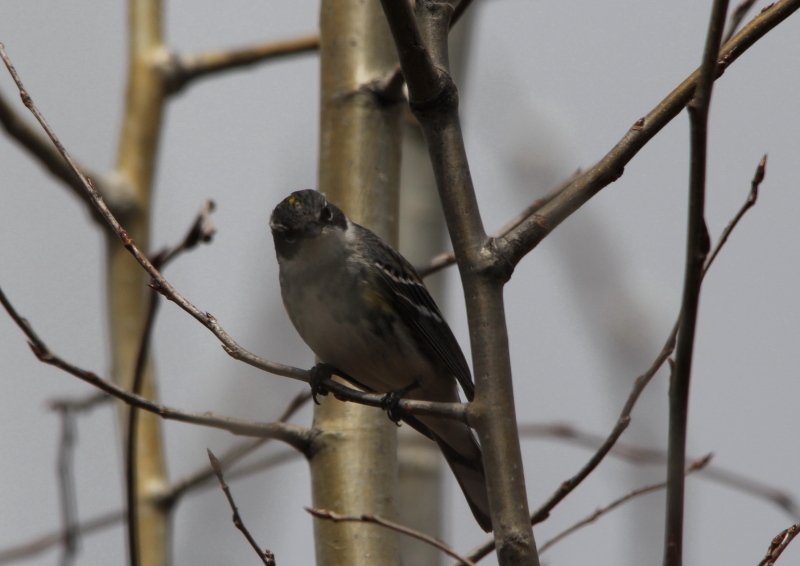 The Yellow-bellied Flycatcher is a small insect-eating bird of the tyrant flycatcher family. 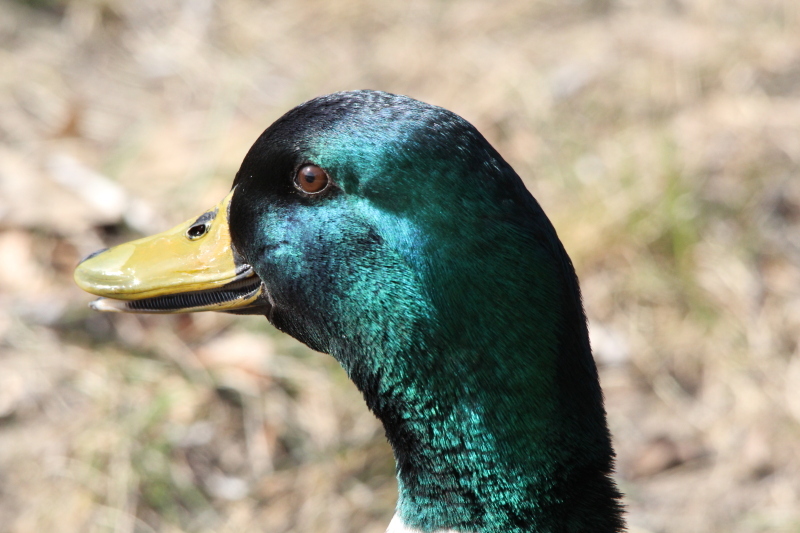 Adults have greenish upper parts and yellowish underparts (especially on the throat), with a dusky wash on the chest. 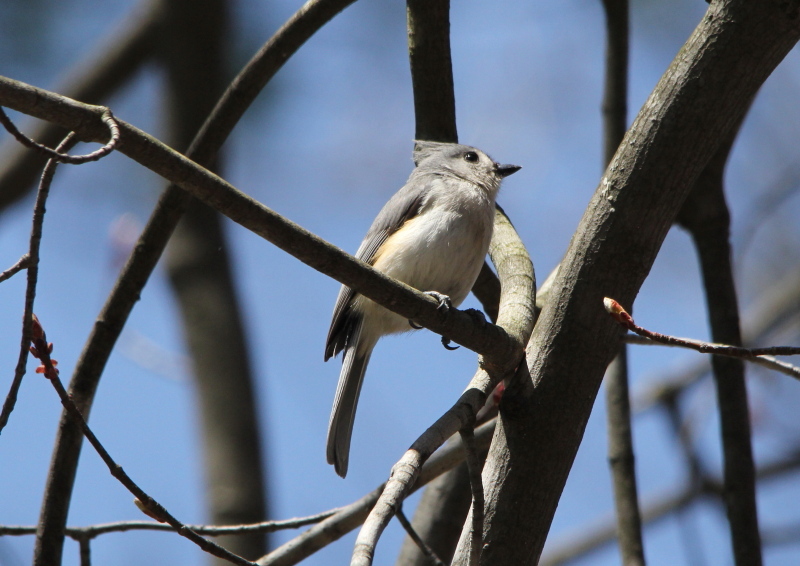 They have a white or yellow eye ring that lacks the teardrop projection of Pacific-slope or Cordilleran Flycatchers, white or yellowish wing bars that contrast strongly against the black wings, a broad, flat bill, and a relatively short tail when compared to other members of the genus. The upper mandible of the bill is dark, while the lower mandible is orange-pink. 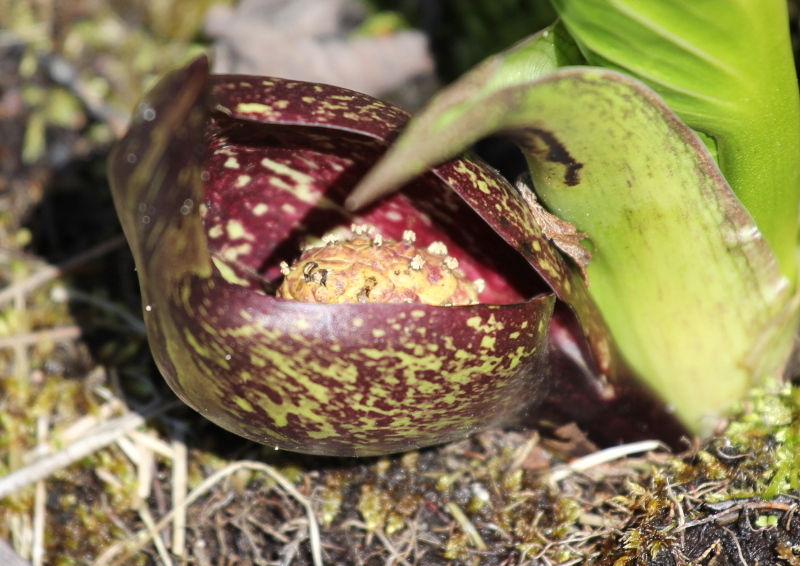 Their breeding habitat is wet northern woods, especially spruce bogs, across Canada and the northeastern United States. 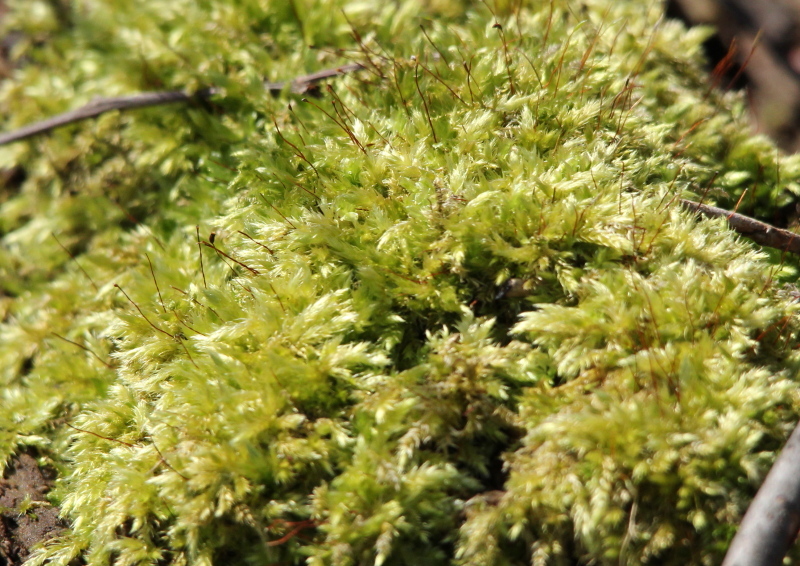 They make a cup nest in sphagnum moss on or near the ground. 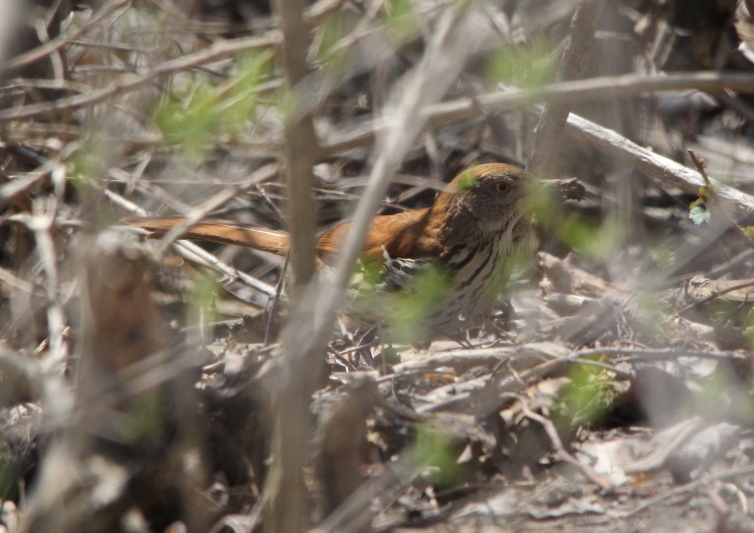 These birds migrate to southern Mexico and Central America. 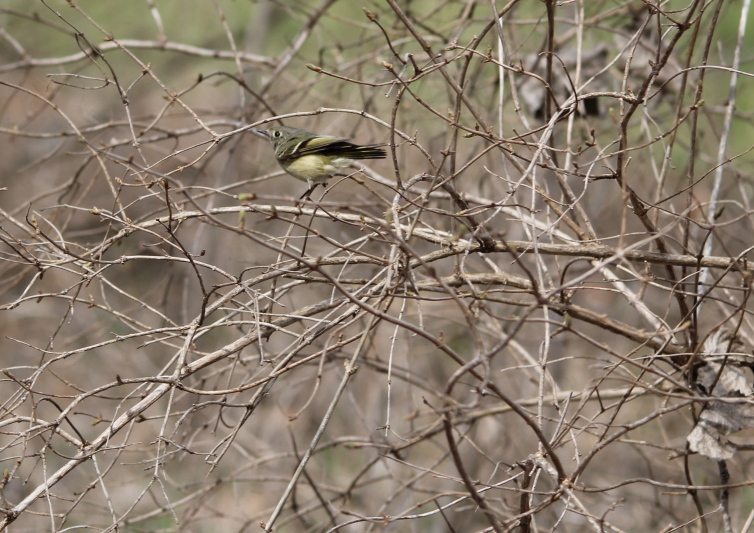 Yellow-bellied Flycatchers wait on a perch low or in the middle of a tree and fly out to catch insects in flight, sometimes hovering over foliage. 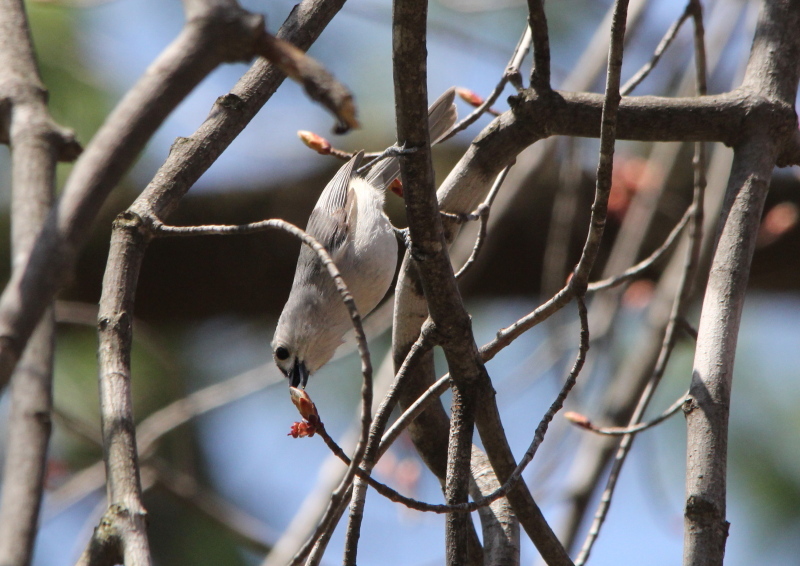 They sometimes eat berries or seeds. This is number 91 in my photo life list, only 259 to go! On Sunday I went to Aman Park, I have done a couple of posts about it already, and I think that I have it listed on my Hiking Places page. 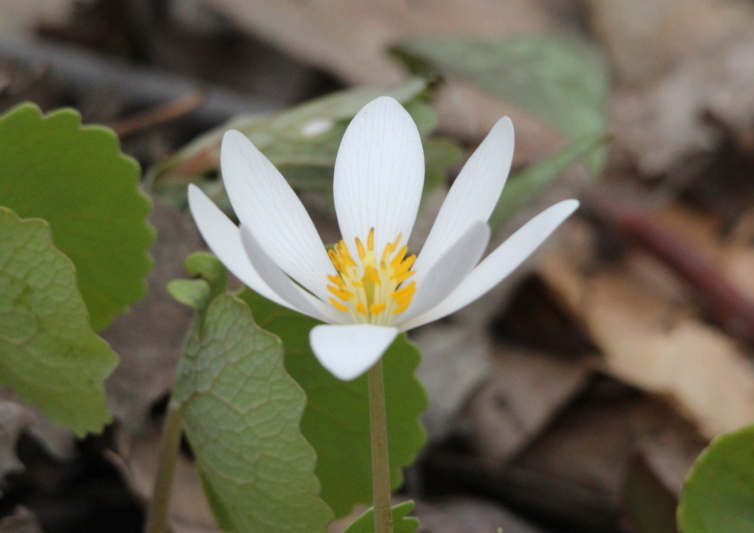 To me, the biggest attraction of Aman Park is the huge numbers of wildflowers that bloom there in the spring, including acres of trillium. 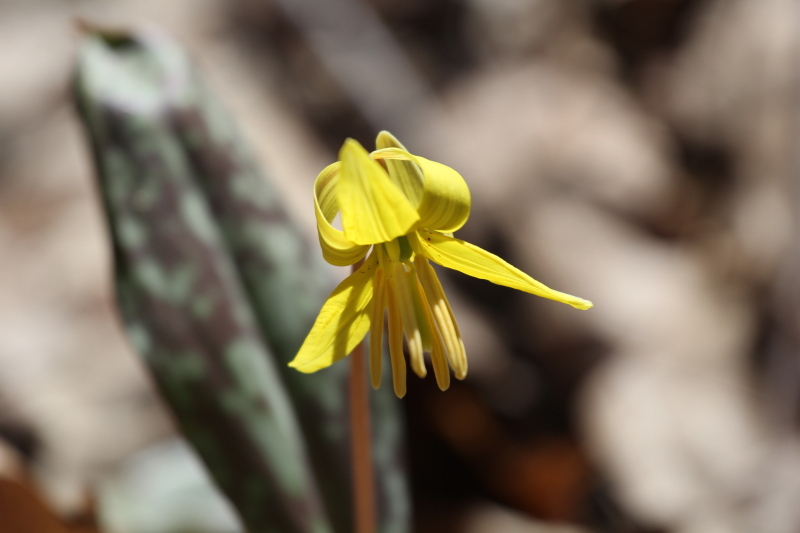 This will be a short post, as although there were many of the wildflowers starting to bloom, not included among them were the trillium. 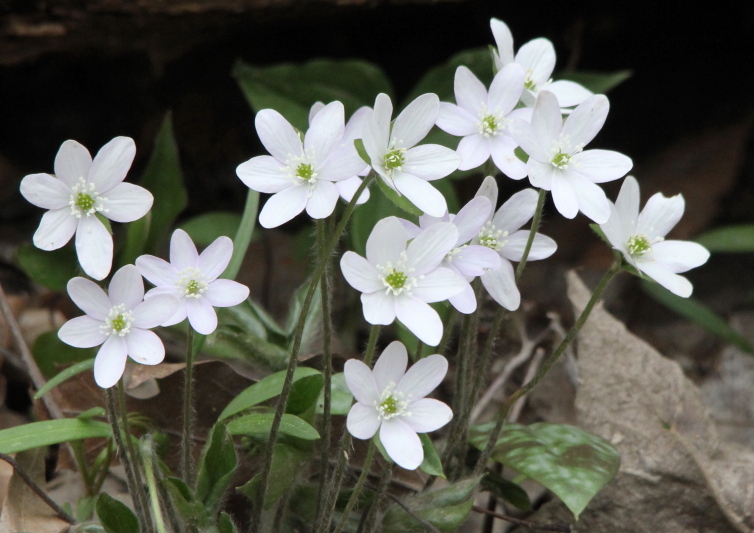 This is mostly an update for Allen (New Hampshire Garden Solutions) and others who have asked about the trillium. The weather wasn’t the greatest either, and I could do an entire post on how poor the forecasts have been of late, but I won’t. Since the trillium weren’t blooming, and most of my shots were taken under a very heavy overcast sky, I’ll just have to go back later and do this park justice, I’ll even get to play with my new 15-85 mm lens to get the seas of trillium blooming in the frame! I knew that I was probably early, but with the flooding, I was worried that this year’s blooms would be destroyed, but it’s looking good! 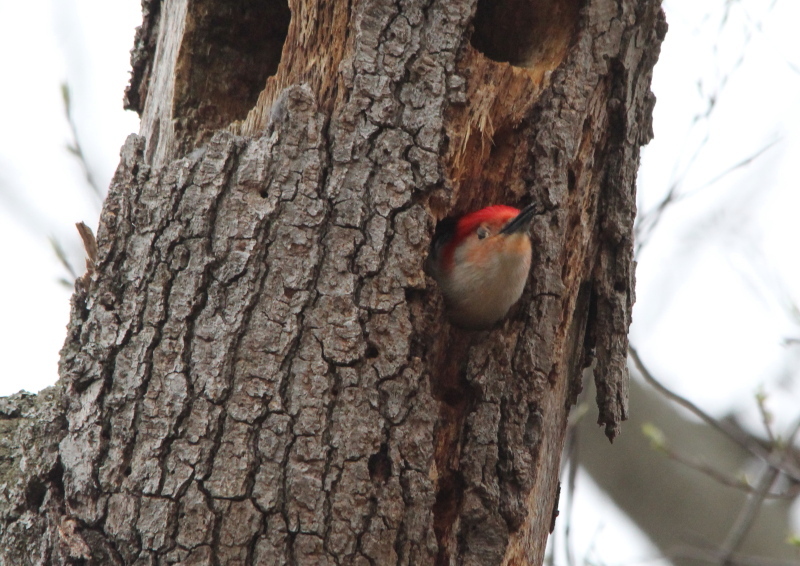 So, on to the photos, starting with a red-bellied woodpecker playing peek-a-boo with passing walkers. The bird was nice enough to continue its game long enough for me to adjust the exposure to make up for the horrible lighting, +2/3 stop worked best. 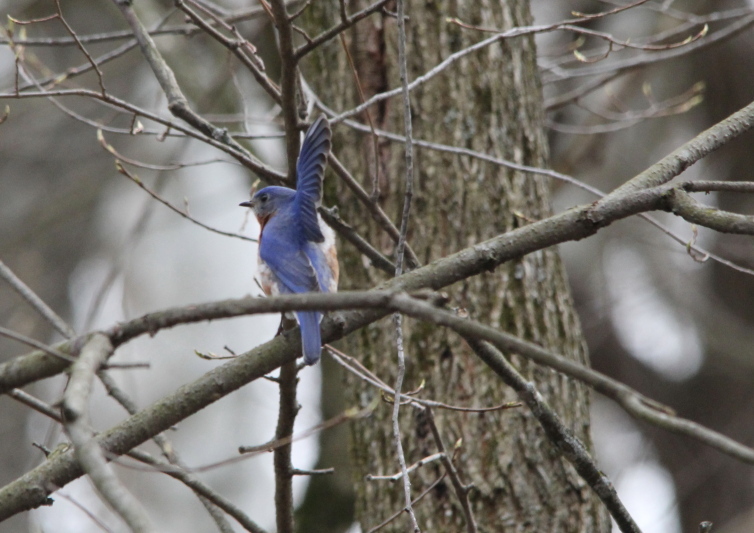 Later, a bluebird waved to me after it spotted me sneaking up behind it. 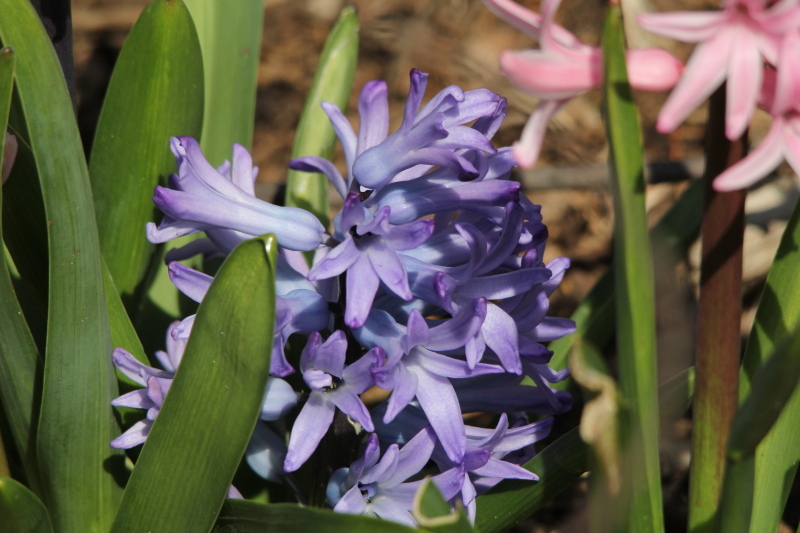 Now then, a sampling of the flowers, since I will be going back soon. No need to bore you all with what would be a double post. I must be getting old, I know I knew all of these before, but for the life of me, I can’t recall them when I need to. 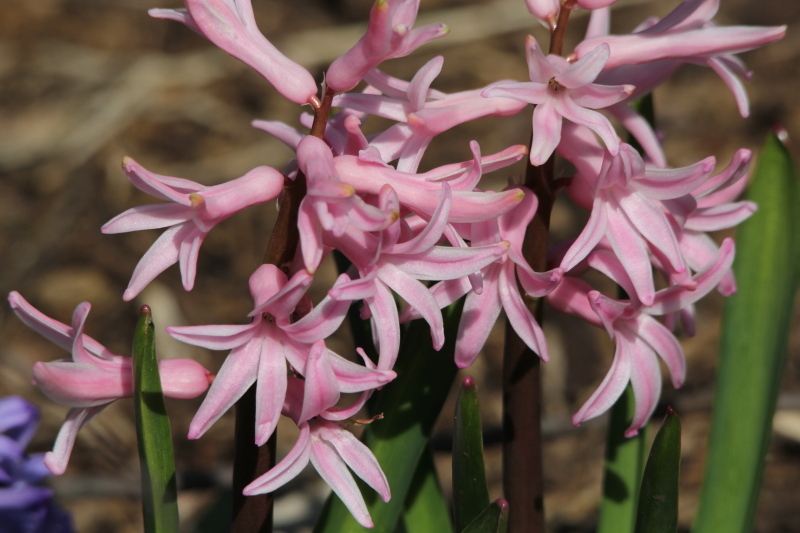 I see that I also missed all the spring beauties that were blooming as well, I won’t forget them in the next one! 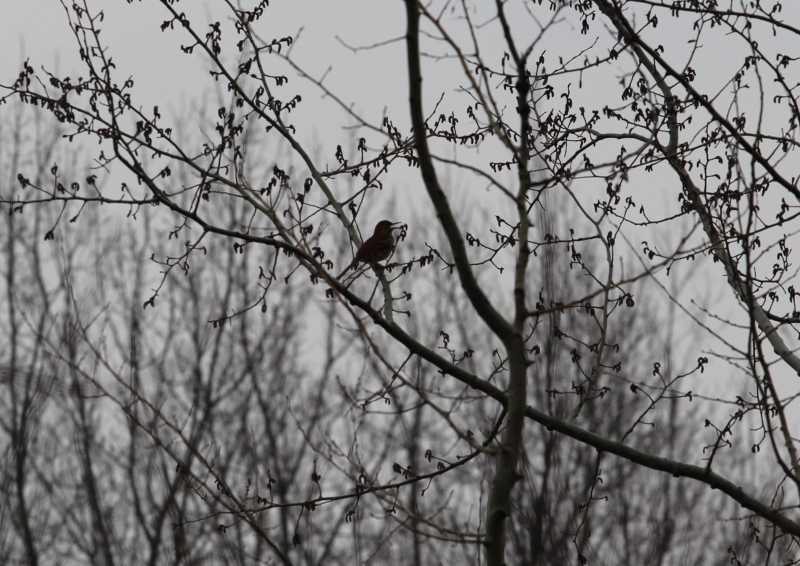 At one point I sat down to take a break, and to watch and listen to the birds. 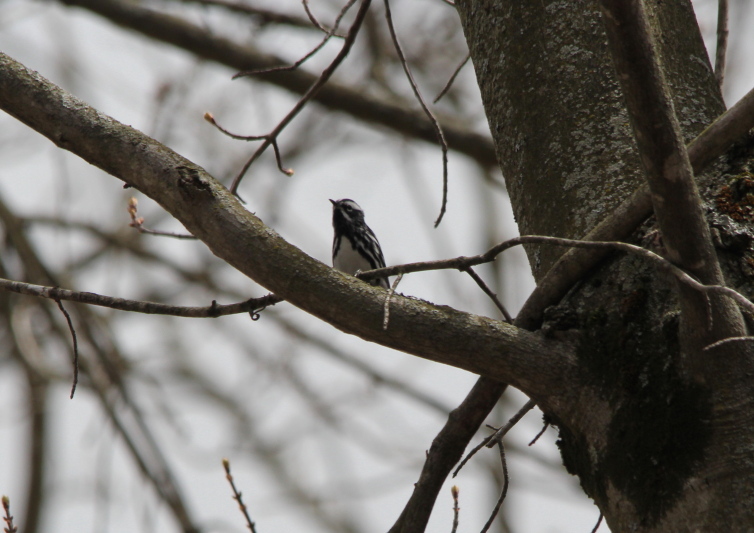 This guy came along, another to add to my life list, a black and white warbler. 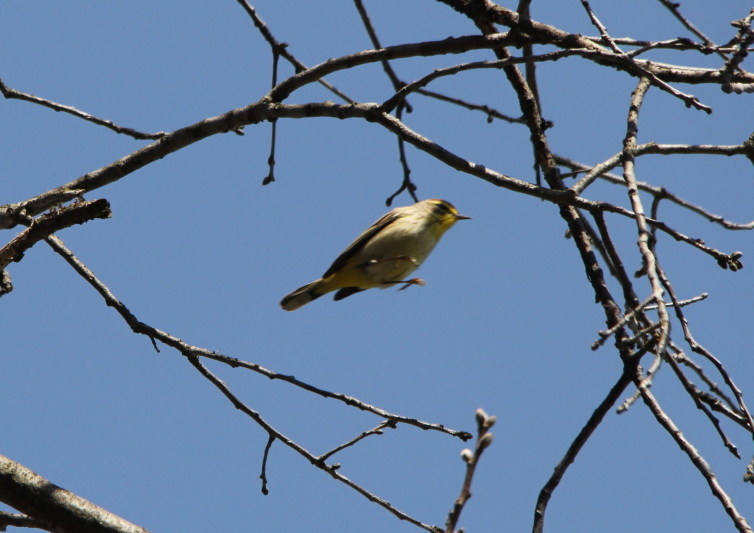 There were dozens of other warblers up in the treetops, but getting good photos of them was out of the question, so I just sat there and enjoyed the music they were making. 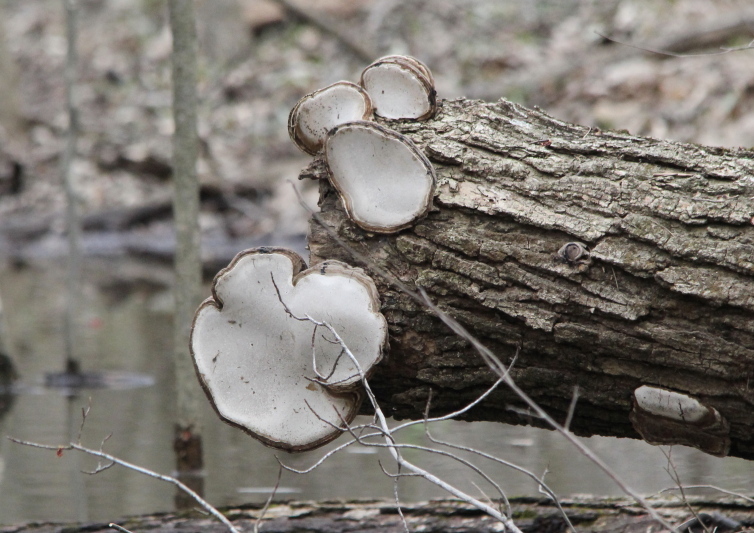 The only other thing of note was this rather strange looking fungi growing on a log that had fallen over. I think that it’s the bottom of the fungi you can see now that the log fell over, I was going to get a different angle on it, but got distracted by all the flowers and birds. Anyway, like I said, a short one this time, I have a bunch of photos of birds saved up for the My Photo Life List project to put into drafts, and the next post I do on Aman Park should be spectacular! 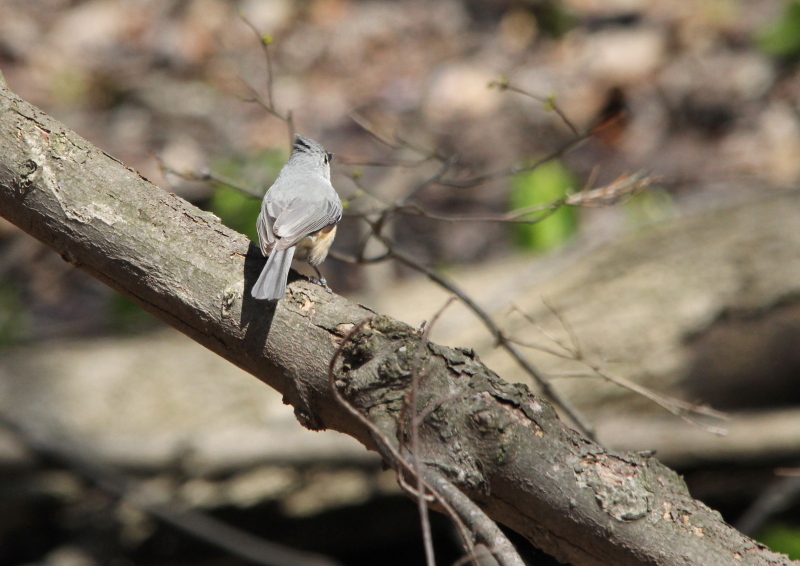 On Saturday, I went walking in Palmer Park, as it’s only a few miles from my home, and has often surprised me with the numbers of birds and other critters there. My day started off on the wrong foot, I overslept, and got to the park much later than what I would have liked to. Right off the bat I had one of those good news, bad news moments. 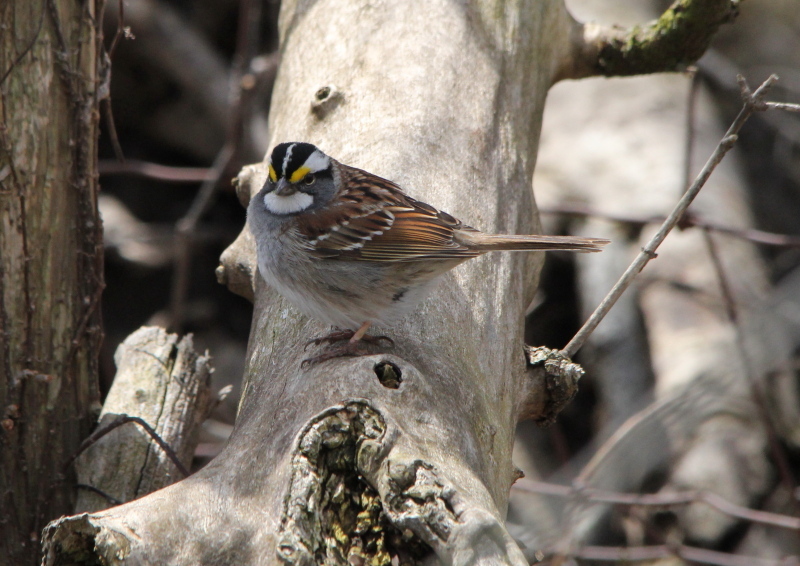 I spotted a new to me species of bird, but had one heck of a time getting even fair photos of it. 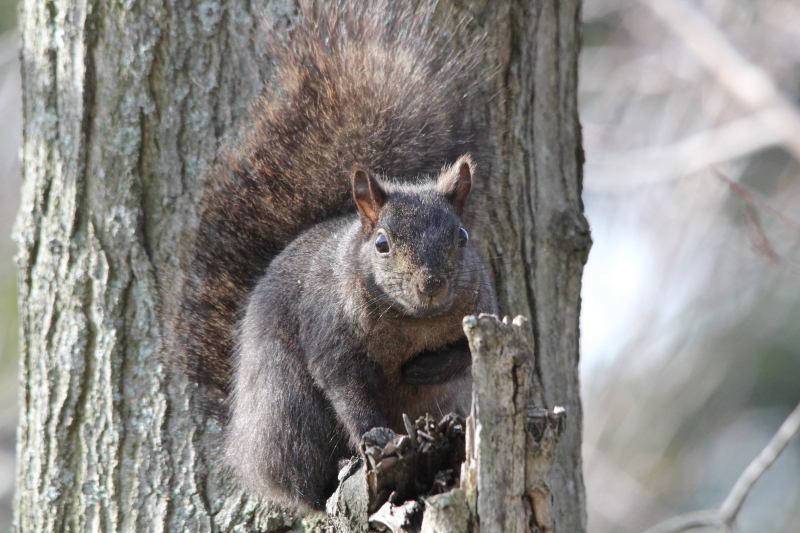 The only time it stopped moving was when it was behind branches, or in deep shade. To show you how tough this little bugger was to photograph, in two of my better photos of it, both of its feet are off the ground, so to speak. 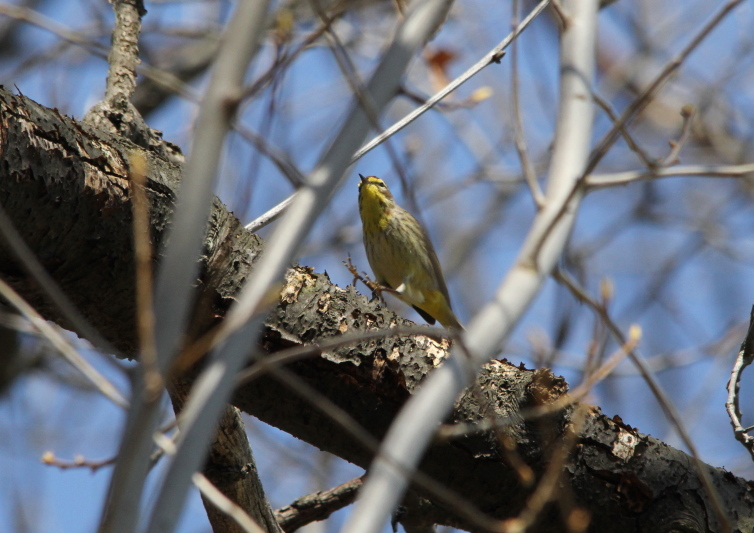 A palm warbler is what it looks like to me, another species to add to my life list! 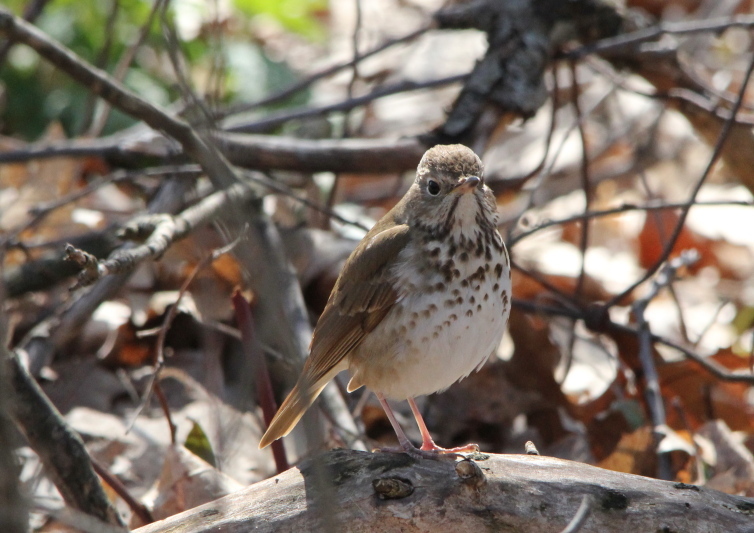 After the high energy warbler, this hermit thrush was a piece of cake. 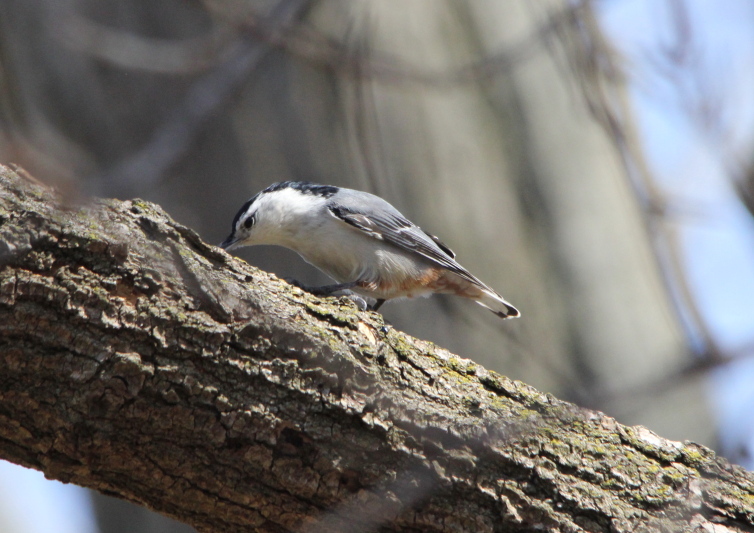 And, this white-breasted nuthatch was too busy looking for lunch to pay very much attention to me. 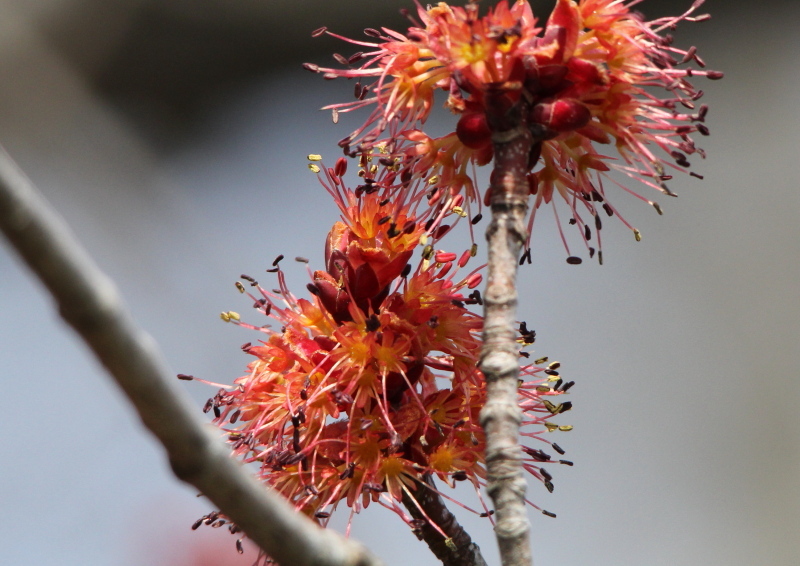 I found a few tree flowers, a field sparrow, and a chickadee. 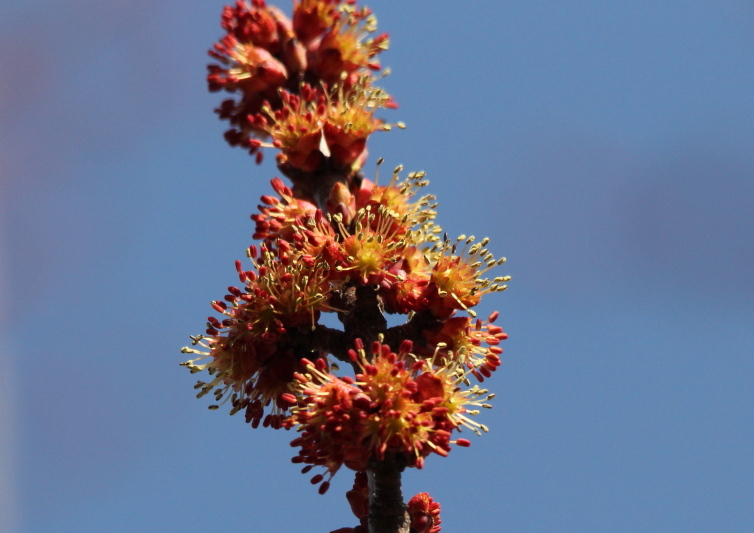 Seeing the red maple flowers in front of an evergreen gave me an idea, I don’t know if it was a good one or not. 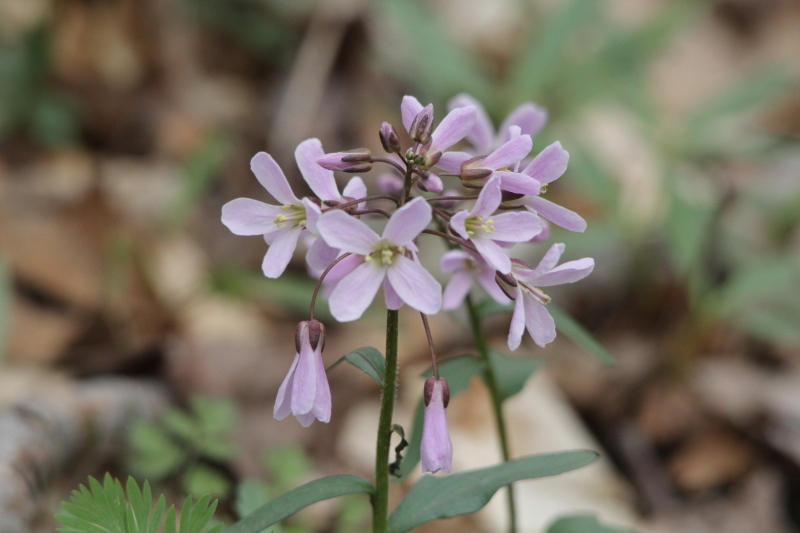 At several points up until this time I had thought about switching lenses to shoot a few of the sparse wildflowers I had seen, but each time the thought crossed my mind, I would be instantly surrounded by birds. 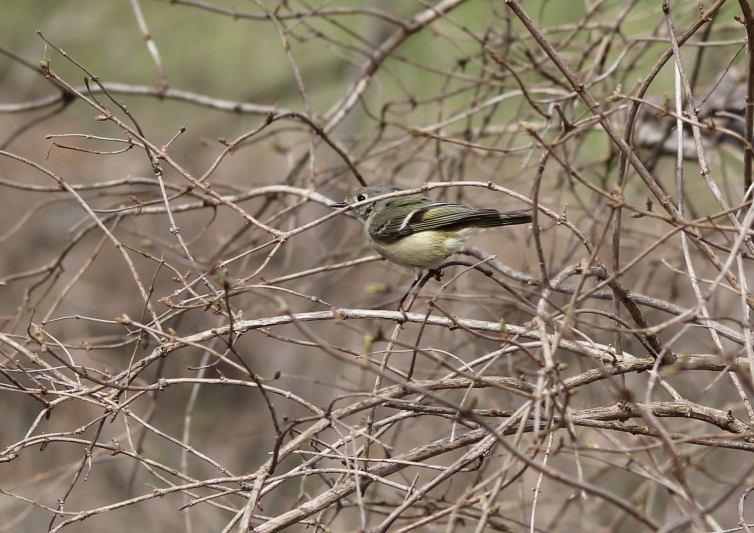 Of course most of those times, the birds were very adroit at staying just out of camera range, or hidden in brush. I may be slow on the uptake, but I did eventually figure out that the birds were showing up only to distract me from the flowers. 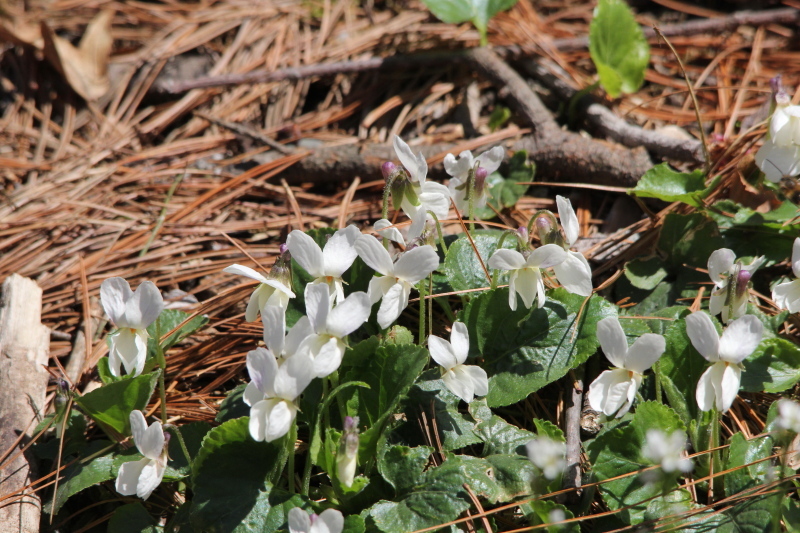 Here’s an example, I spotted a small cluster of white violets and was about to change lenses, but then a pair of tufted titmouse arrived on the scene. 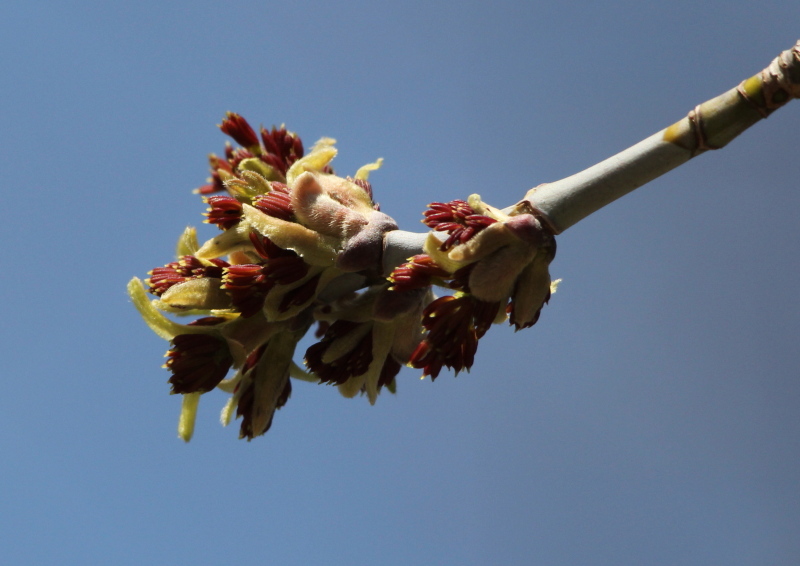 To make sure that my attention was focused on them rather than the violets, they began to pluck the leaf shoots of a maple tree off the tree to eat. I have seen squirrels doing that, but never birds. Maple leaves must be very tasty! 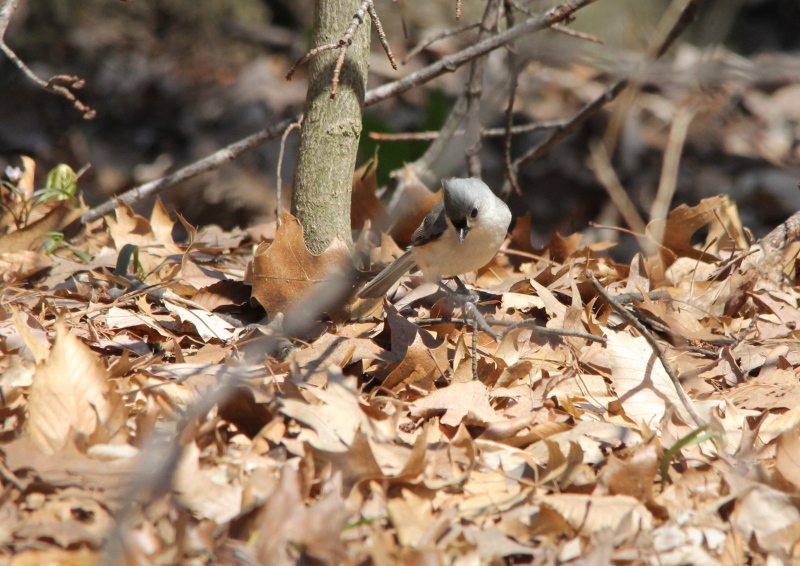 One more of the titmouse. 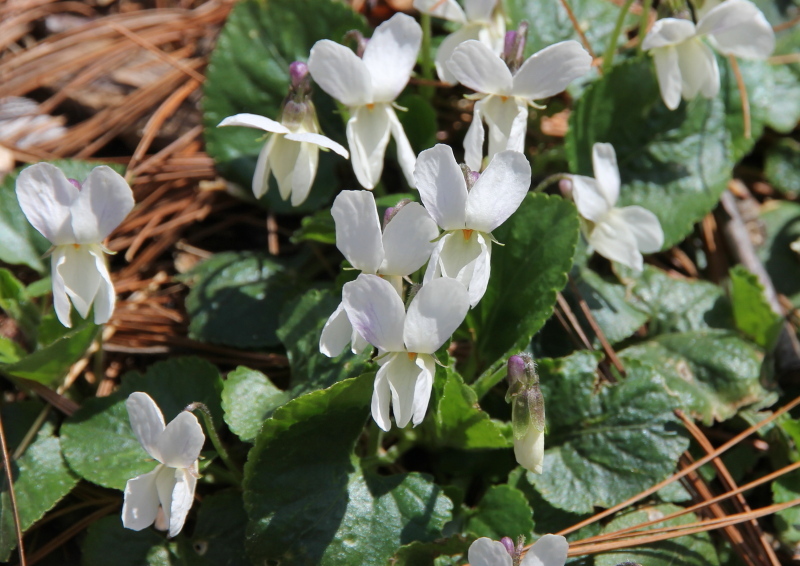 But, this time I remembered the violets, and rather than chasing the birds any longer, I paused to switch lenses. 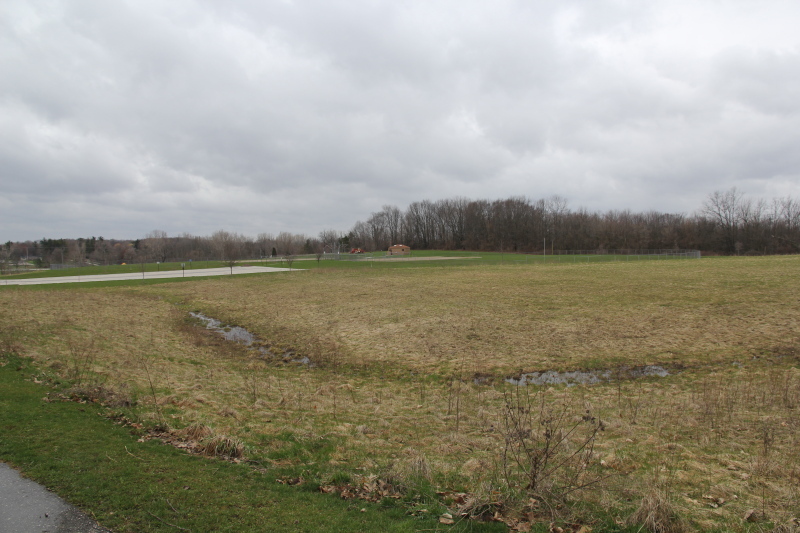 And, since I had the EF S 15-85 mm on the camera, I shot a wide view of the area of the park where I was standing. 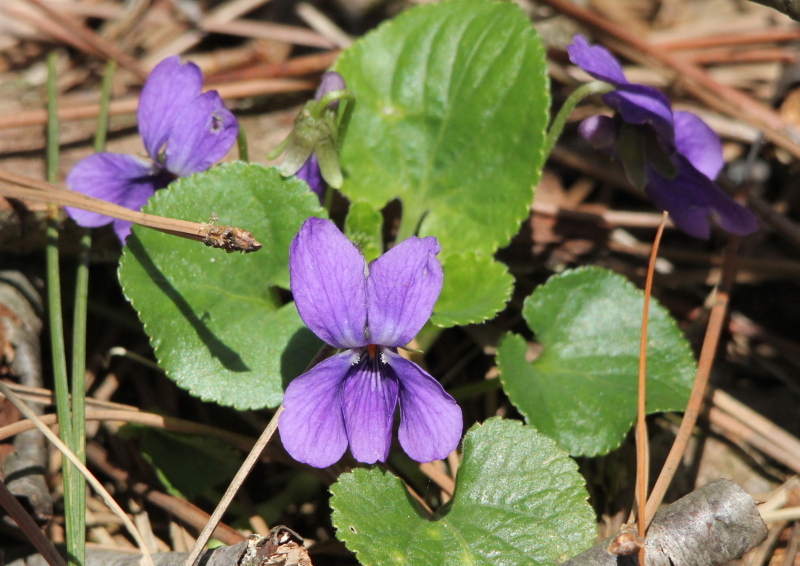 A short time later, a young turkey tried to distract me from violet violets. Having figured out that I was no longer going to allow the birds to distract me from shooting wildflowers, Mother Nature tried upping the cuteness factor of the distractions. But, I wouldn’t allow myself to be distracted any more. Not that the birds weren’t still at it. Now comes the boring section of this post, a few of my ramblings. First, I haven’t written a lot about the Canon EF S 15-85 mm lens yet, even though I’ve had it for a couple of weeks now. 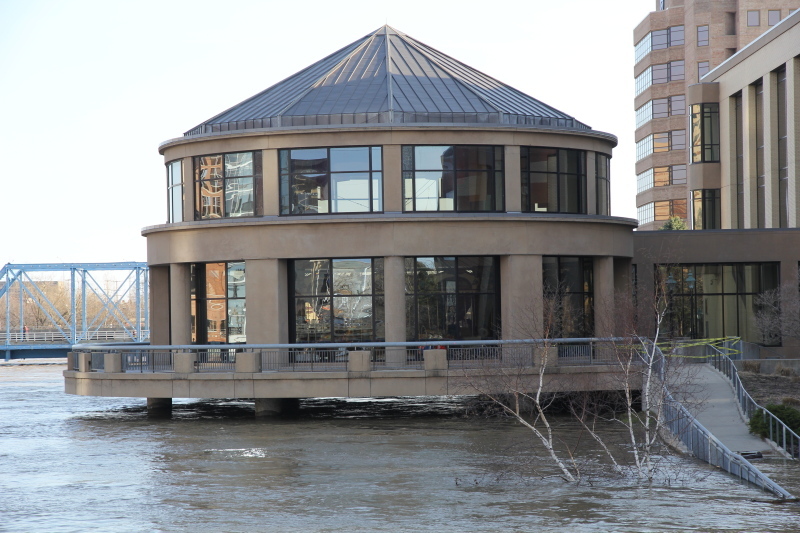 All the photos in my post about the flood in downtown Grand Rapids were taken with that lens, along with a few from today. What a fantastic little lens! 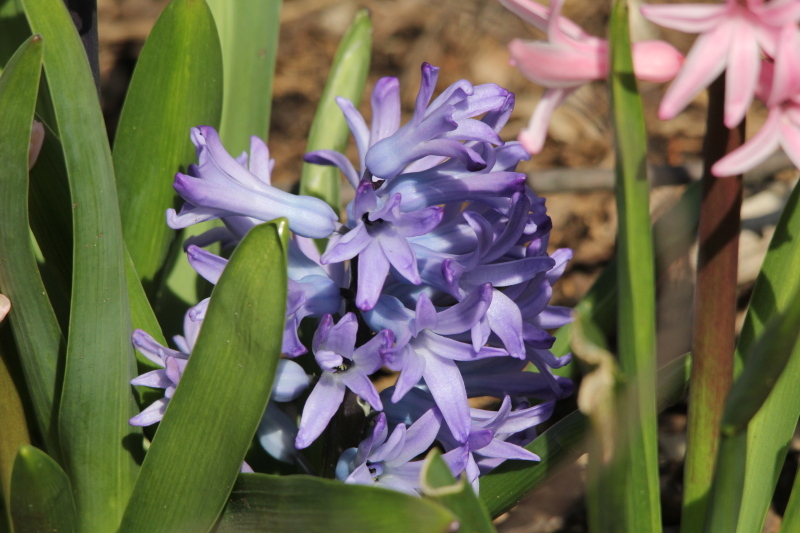 It is very sharp, and the color rendition, saturation, and contrast is the best of the three lenses I have. It’s designed for crop sensor cameras, so if you have one of the Canon crop sensor bodies and are looking for a wide-angle zoom lens, the 15-85 mm is superb! You owe it to yourself to at least consider this lens if you are thinking of a wide-angle zoom lens. Now I just have to learn how to use it more often. It’s been so long since I’ve had a wide-angle lens that I have forgotten how to use them effectively, I can see that it is going to change now that I have an excellent one. Since I haven’t had multiple lenses for a while, I also have to come up with a better way to carry my camera gear. For this walk, I had my daypack to hold essentials that I always carry with me, such as water, food, and extra clothing. It also carries my tripod very nicely. In addition, I had my medium size camera bag which held the 15-85 mm and 70-200 mm lenses while walking. I also had the case that came with the Sigma 150-500 mm lens to hold it while I had one of the other lenses on the camera. I was also wearing a safari vest from Cabela’s. Too much stuff! To change lenses, I would have to find a safe spot to set the camera and Sigma lens down, set the camera cases down, then drop my pack. Then reverse the entire process when I would begin moving again. Too much hassle! But, what do I do without? Just after starting out, I had to shed a shirt, as the weather was much warmer than predicted, and the daypack is essential for that, along with holding all the water I drank, plus my lunch. Oh well, I’ll come up with something, no reason to bore people to death. 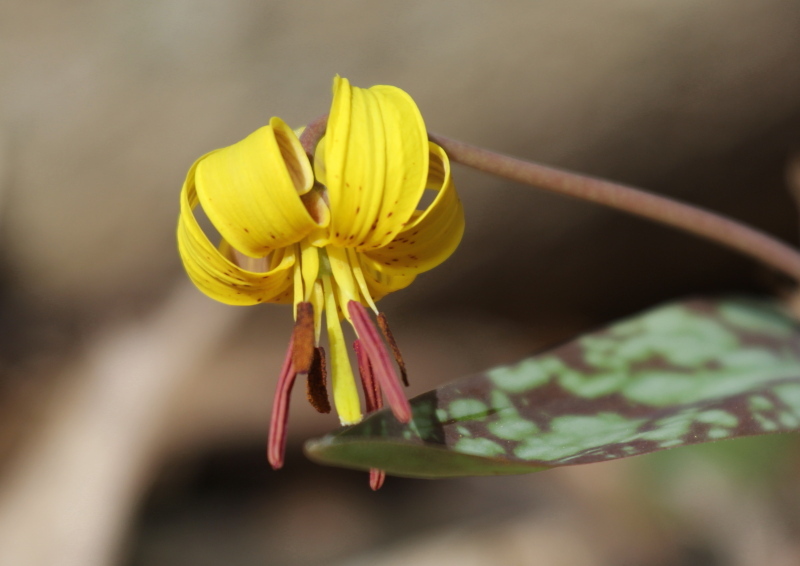 I found a few trout lilies in bloom, and I’m just going to dump the entire lot in here now, as some were taken with each of my three lenses, and I defy any one to pick which lens shot which photo. It is so nice having three quality lenses! 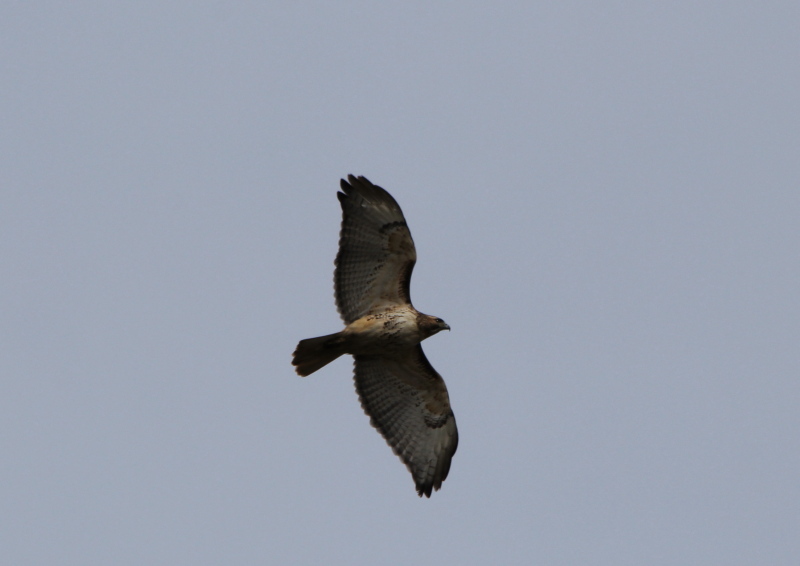 As good as the two shorter lenses are, they can’t beat the Sigma for birding though, the extra reach is indispensible! 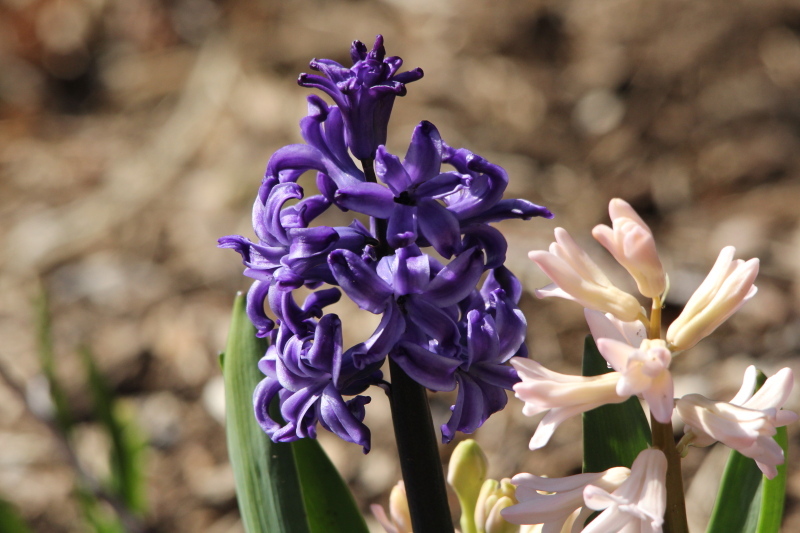 I am going to end this one with a few photos of hyacinths that I found near the parking lot, just because I can! If you live in the northern part of the country, you know what I mean when I say that it is so great to see colors again! That’s it for a very pleasant day spent in the park. 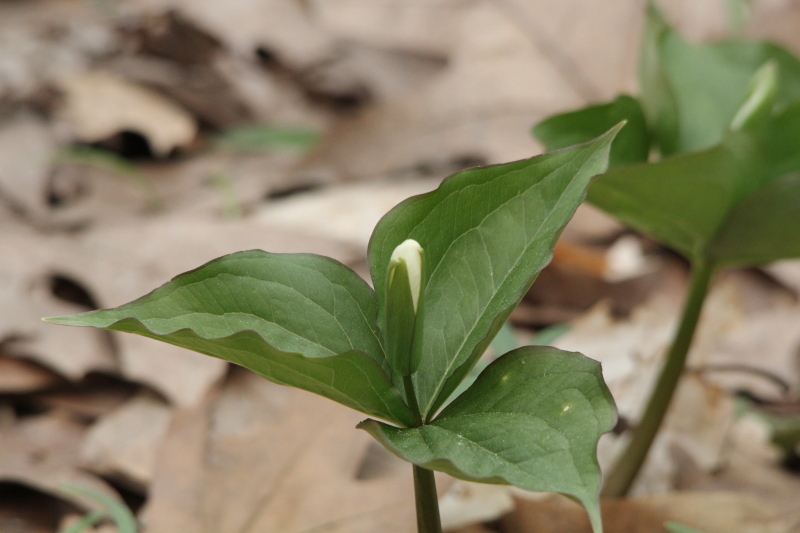 I’m going to load up my stuff and head to Aman Park today, to see if any trillium have begun to bloom, thanks for stopping by! 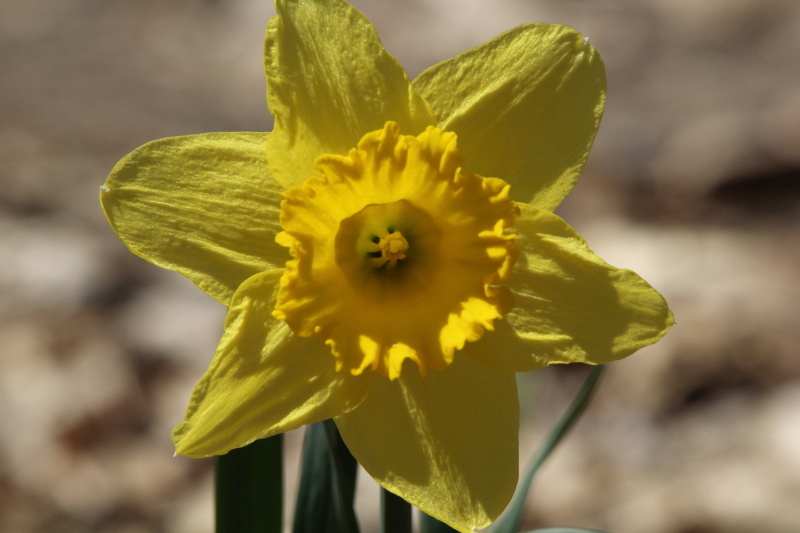 A beautiful day, maybe the nicest we’ve had this spring! 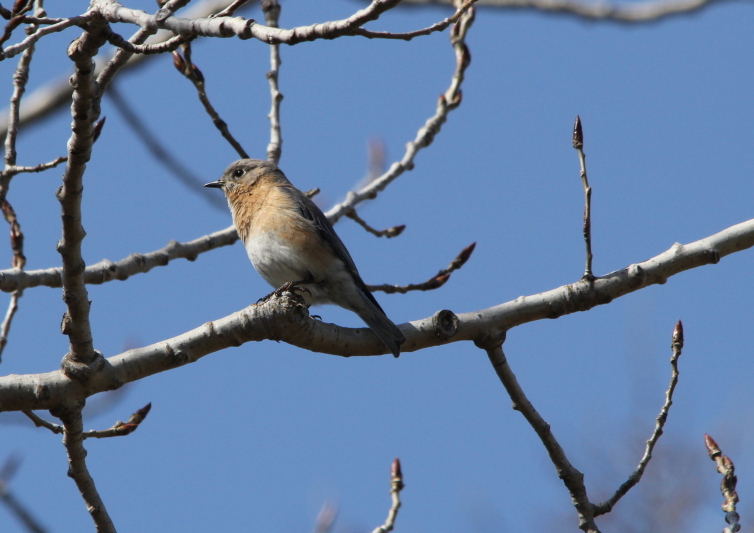 It was warm and sunny, not quite male bluebird skies, but definitely female bluebird skies! 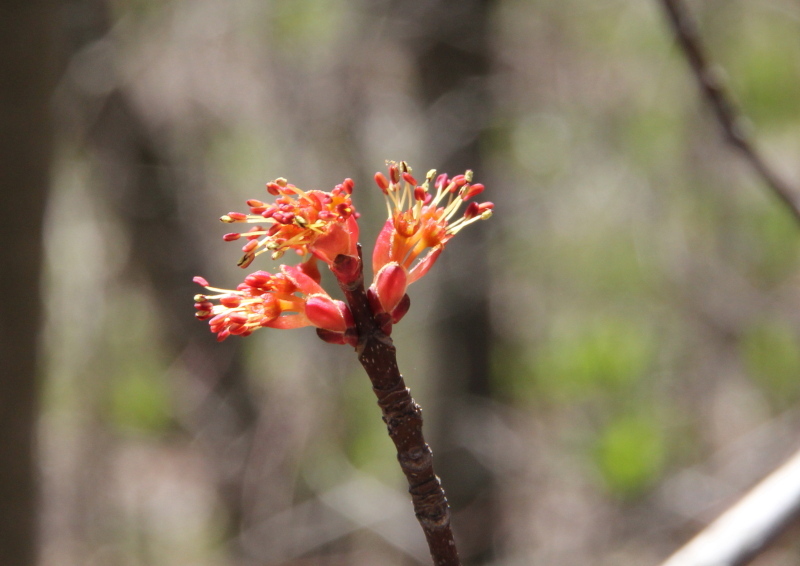 There are flowers beginning to appear! 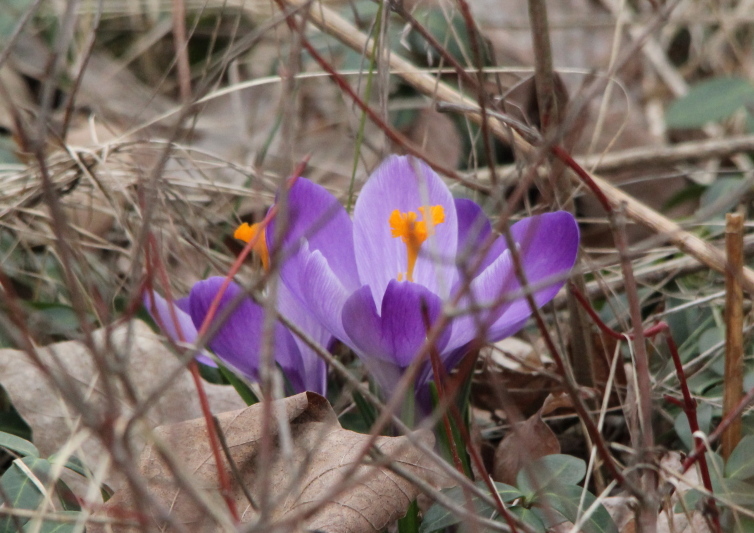 The crocus had just begun to bloom when the flooding rains hit, and destroyed the flowers before I got any good photos of them. 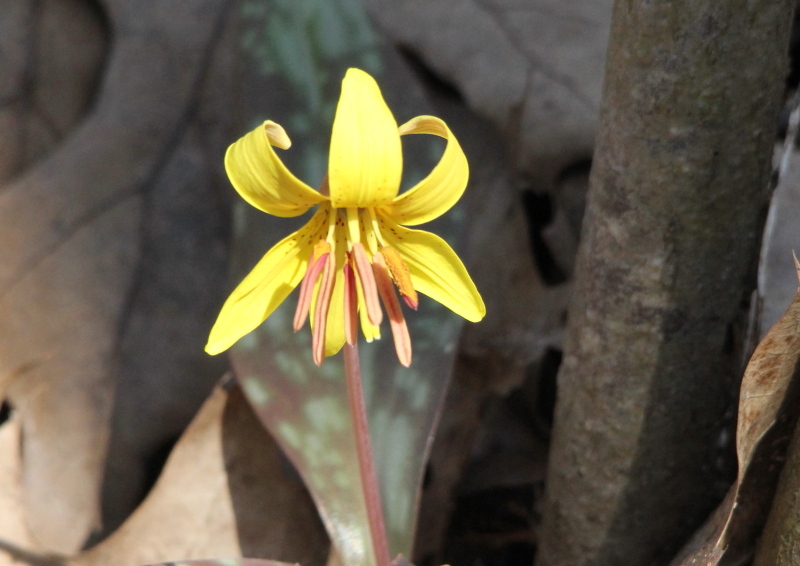 I’m hoping for a lot more flowers soon, but it is also prime birding time here in Michigan. 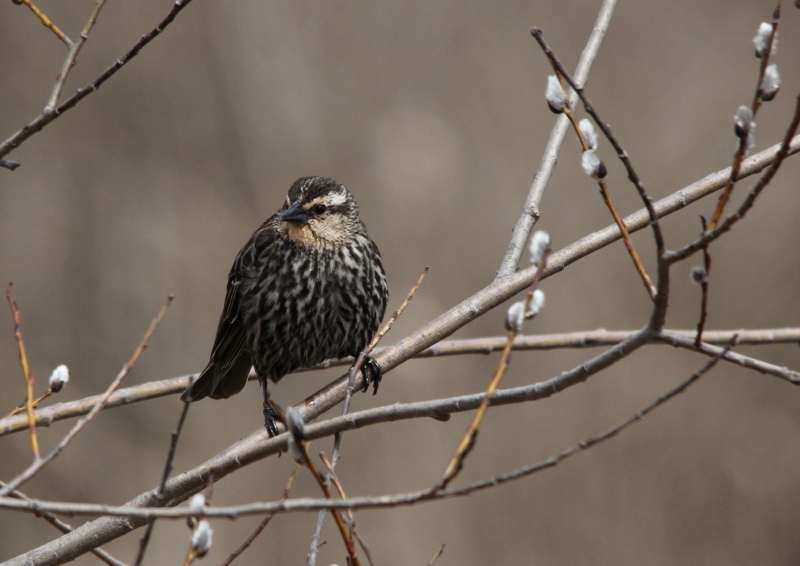 With the many migrant species passing through, the birds in their breeding plumage, and no leaves on the trees, now is the best time of year to get photos of the birds. 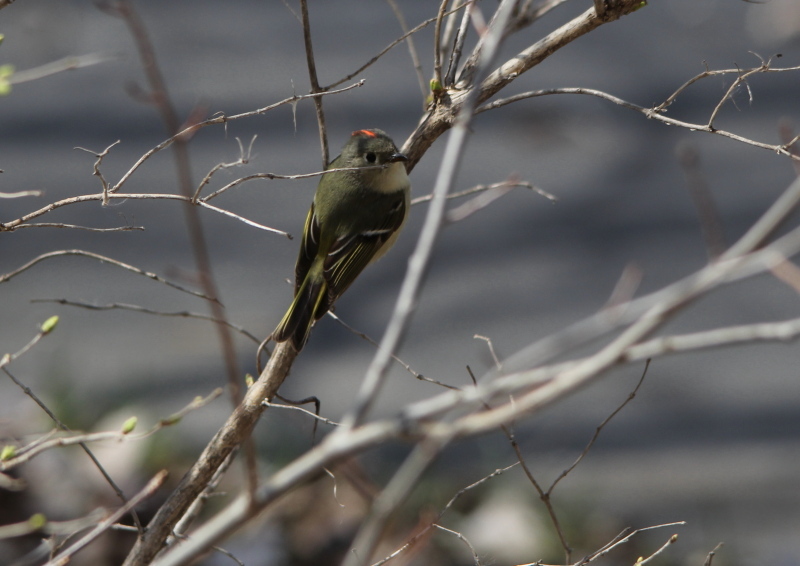 I learned that the ruby-crested kinglets have a beautiful, cheery song, but they don’t even sit still while singing. I was tempted once or twice to shoot one that seemed to be following along with me, but I was enjoying his singing so much that I overcame the temptation of trying for a photo, just so I could continue to watch and listen. 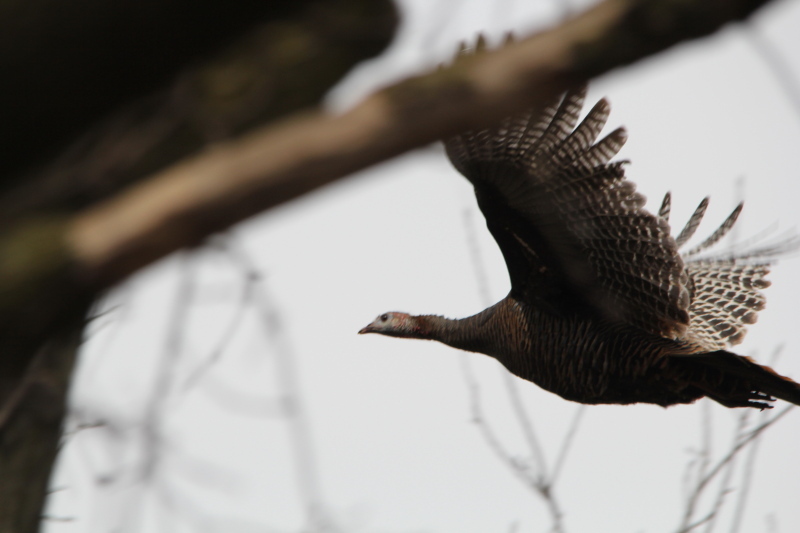 With the help of a jogger who frightened a turkey, I was able to get some more practice photographing turkeys in flight, and from the looks of these photos, I need a lot more practice. I am not responsible for how awkward the turkey looks in the first photo, she did that all by herself. 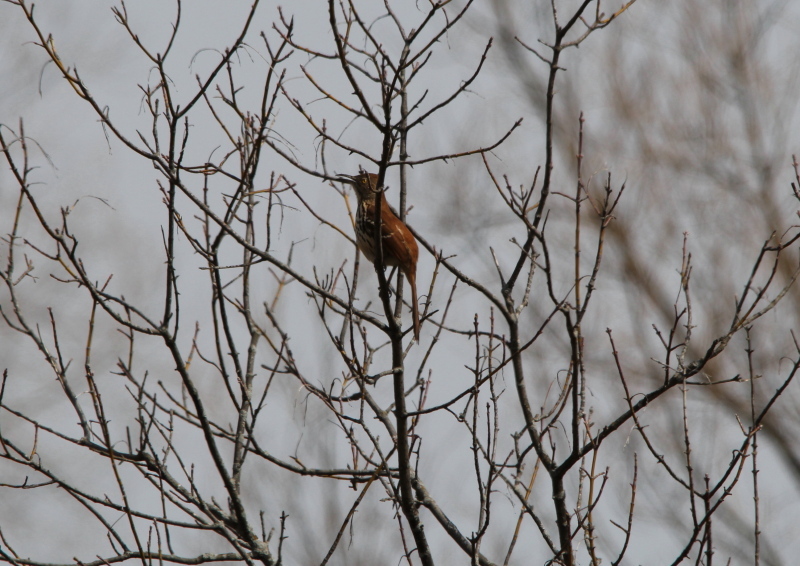 The meadowlark and the brown thrashers both seemed to have moved on, darn, their songs would add so much to my daily walks that I was hoping a few of each would stick around, maybe the next batch passing through will stay longer. 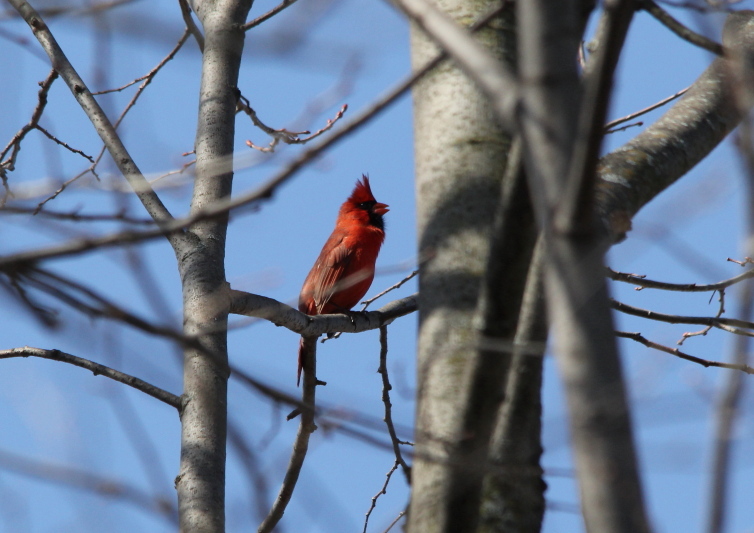 Most of the shots that I attempted today were of singing birds, like this cardinal. 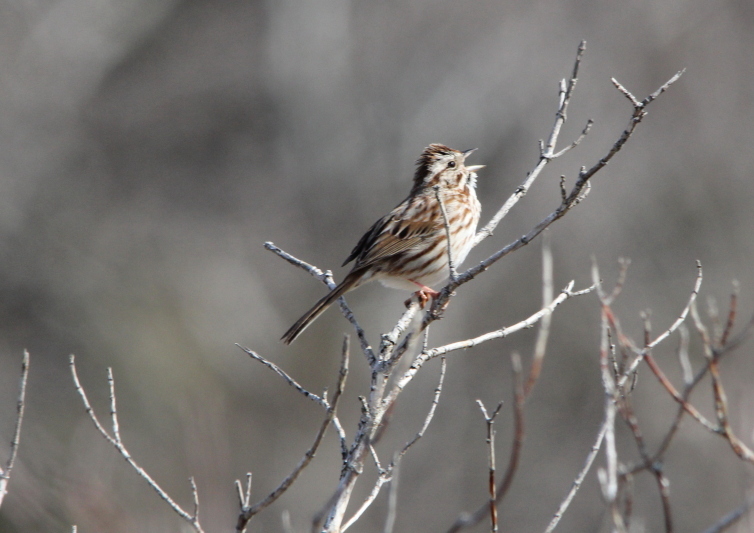 I had this song sparrow all lined up, ready to click the shutter when he broke into song, but he fooled me. 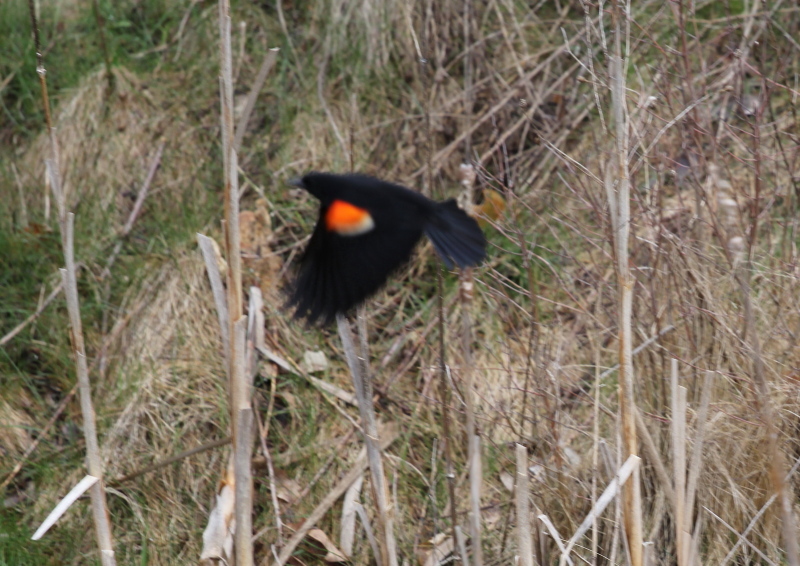 A red-winged blackbird pulled the same trick on me. 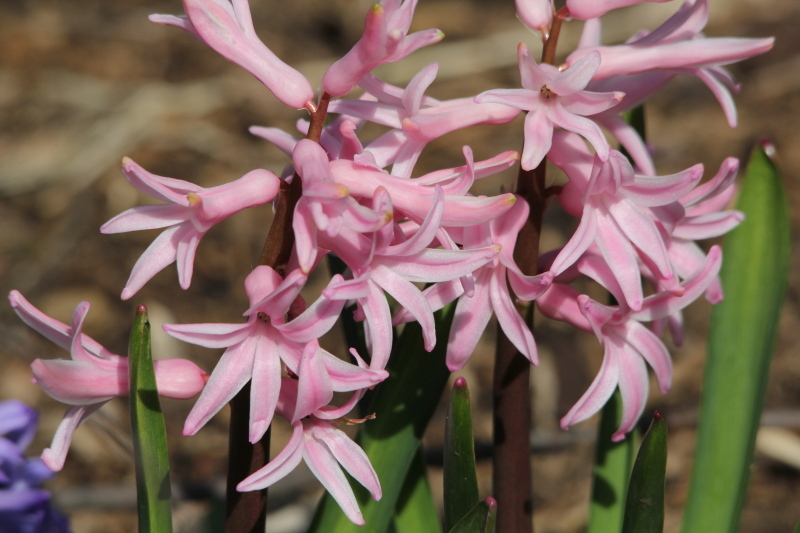 Sorry, but that’s it for Monday, I still have a lot of work to do on my post about my trip to Muskegon, and I did spend most of my time today listening to the birds, and enjoying a fine spring day. Unfortunately, the fine weather won’t last long, it is supposed to rain on Tuesday, not a lot, but rain is rain. It shouldn’t make the flooding any worse, but it sure won’t help either. The clouds were back, with a little rain now and then in the morning, the heavier rain is forecast for this afternoon. Since I wasn’t sure if I would get wet or not, I took the 70-200 mm lens today, and it was one of the few days lately when I didn’t get close enough to very much for chances for photos. 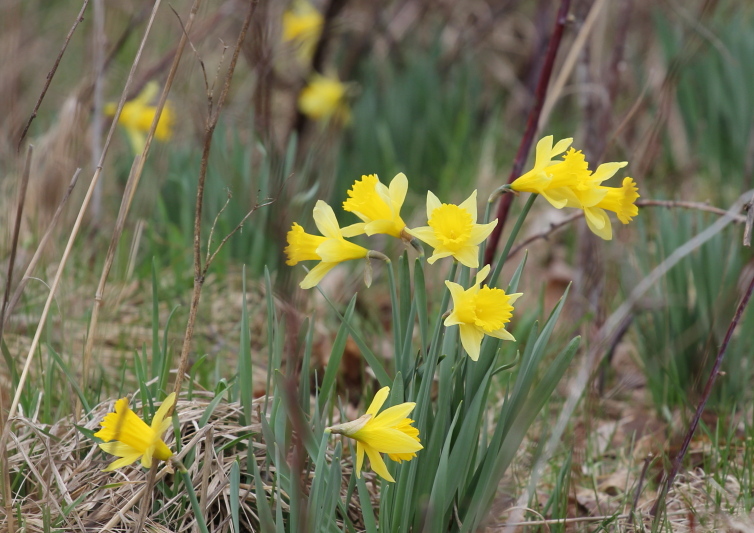 Other than a few daffodils, that is. 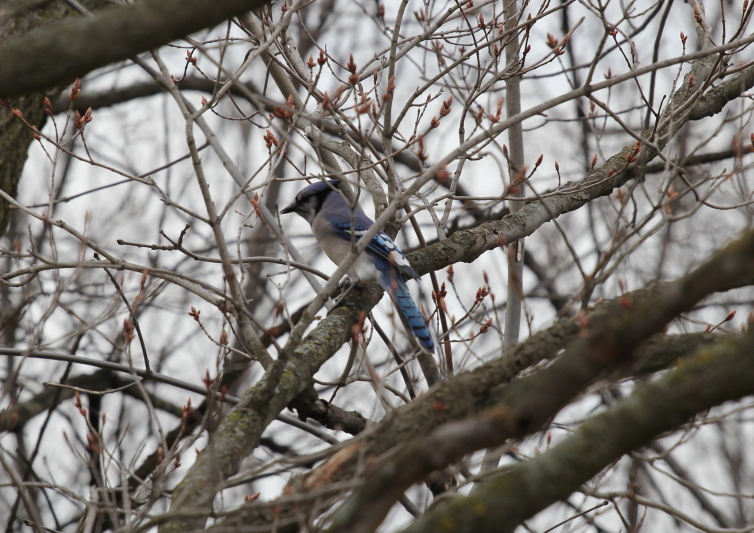 I did shoot a blue jay, that was about it for the birds. 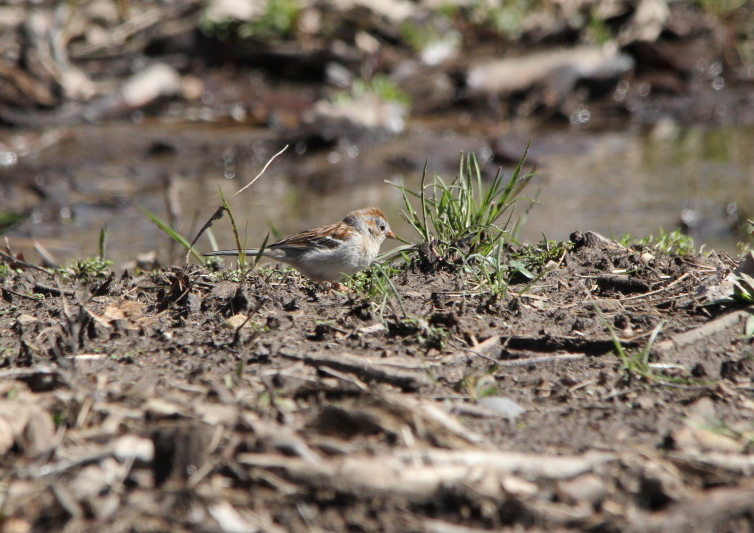 I did shoot several of a very small bird that I haven’t identified yet, and I don’t think that I’ll be able to from my photos. 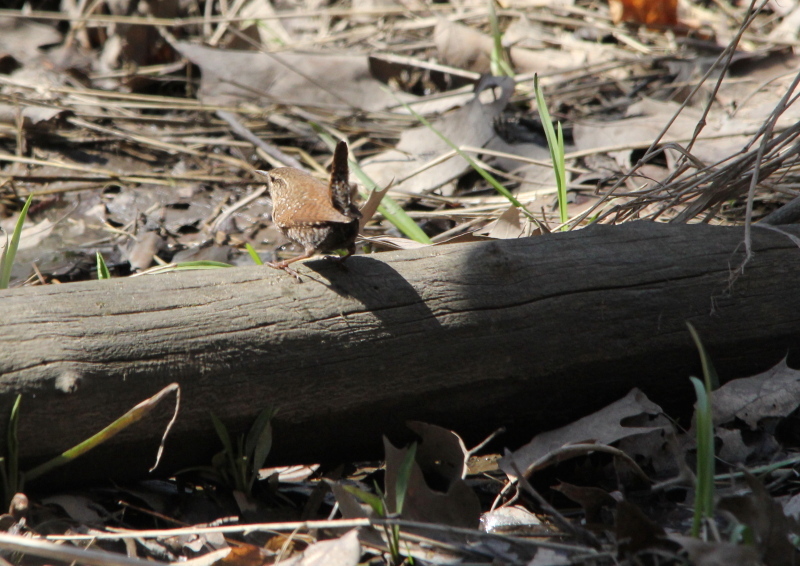 It looked like a wren to the naked eye, it was twitching its tail like crazy as wrens do, but it stayed out in the open, and in the cropped photos, it doesn’t look like a wren. But, the photos aren’t good enough to post here. It was another good day just to be outside and enjoy the birds singing, far more than trying to chase them down to get photos of them in the bad light of today. I have written in my post on my trip to Muskegon on Sunday (Not published yet as I type this) that I am becoming more selective in both taking, and posting photos. A number of things are driving that. One, I now have good photographic equipment that is both reliable and predictable as far as the results I’m getting, so I no longer have to shoot and hope. In part because of that, I no longer feel the need to shoot every bird that I see, everyday. Then, I’m past 25% of the way through the My Photo Life List project, and I am closing in on getting to being 33% of the way finished with it. It’s no longer this empty space nagging at me to be filled, I can take my time, fill in the sparse posts in the project that I have already posted, and get good photos for that project from here on out. By getting this far through the project so quickly, it has dawned on me that since I’m outdoors every day, with good photo equipment, the photos will come, not may come, it’s just a matter of time. 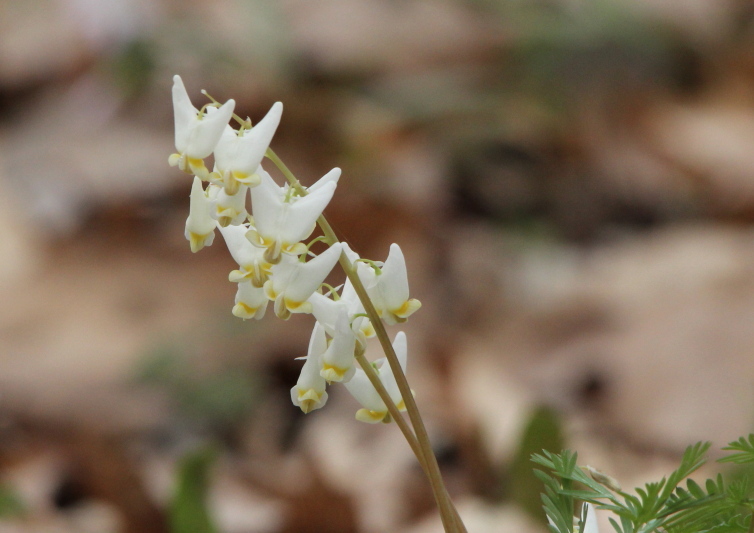 I netted photos for 5 more species in the project during my trip to Muskegon on Sunday, on top of the 3 or 4 drafts I have ready to post over time. That puts me very close to 100 species of birds posted in a very short time. I may have “officially” begun the project back in January of this year, but the idea for it has been kicking around in my head for some time now. The page that I did and entitled “My Bird Gallery” was my first attempt at it, but I quickly realized that one page wasn’t going to cut it. 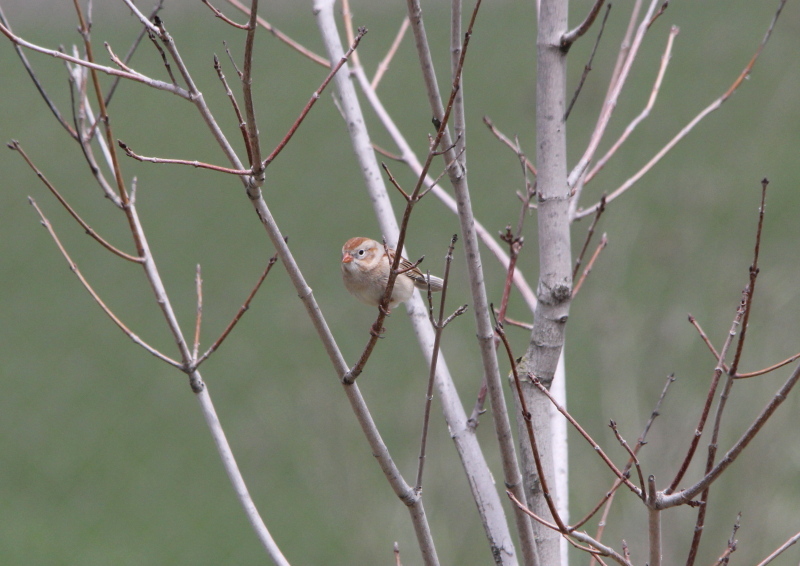 But, that’s the reason that there has been so much emphasis on birds here on my blog for the last year or so. So, what does all this have to do with my walk today? 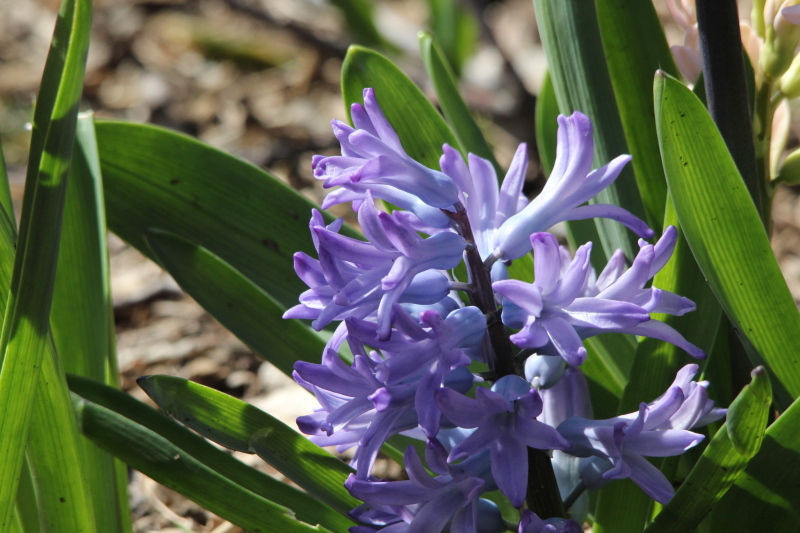 This, I am taking more time to enjoy my walks, I would be stopping to smell the roses if there were any blooming. 😉 I’m watching, listening, learning, and enjoying my time outdoors now that I am no longer feeling as much pressure to shoot as many photos as I can, and overwhelm people with quantity over quality. 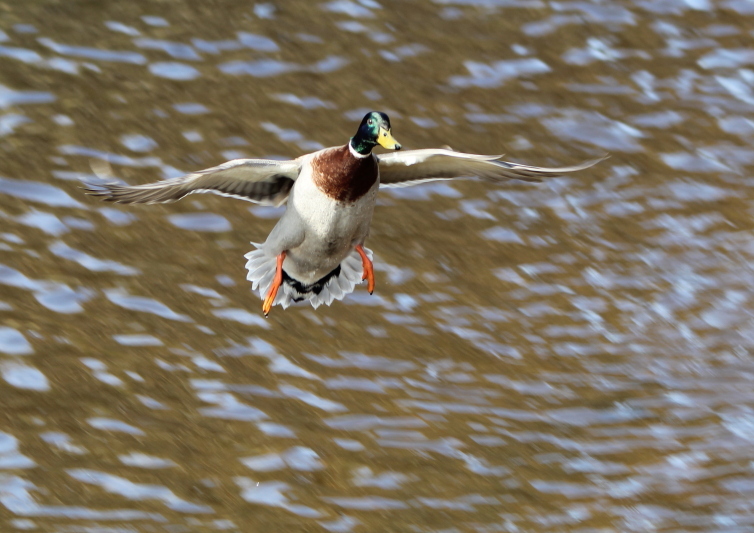 Don’t worry, I still post a few bad photos of mallards in flight from time to time. 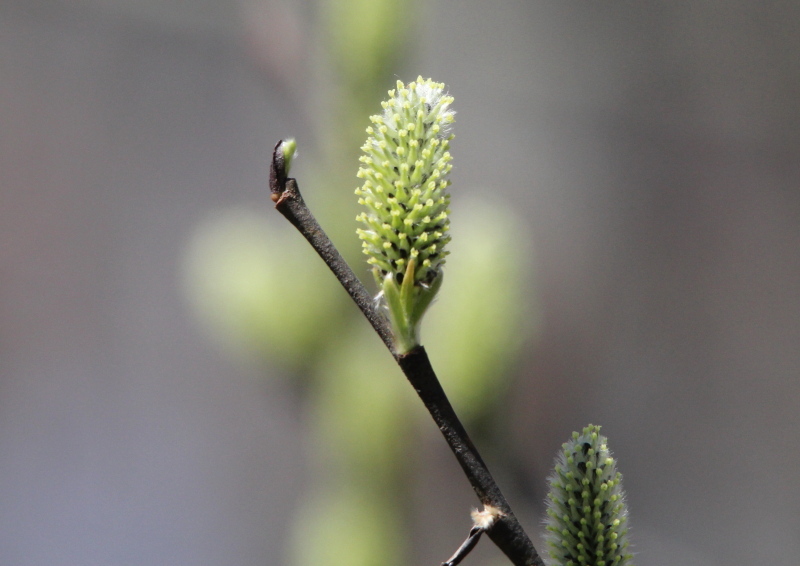 The other thing that I have been doing while on my daily walks is finding the first signs of plants poking their shoots out of the ground so that I’ll know where to look for wildflowers when spring does really get here. 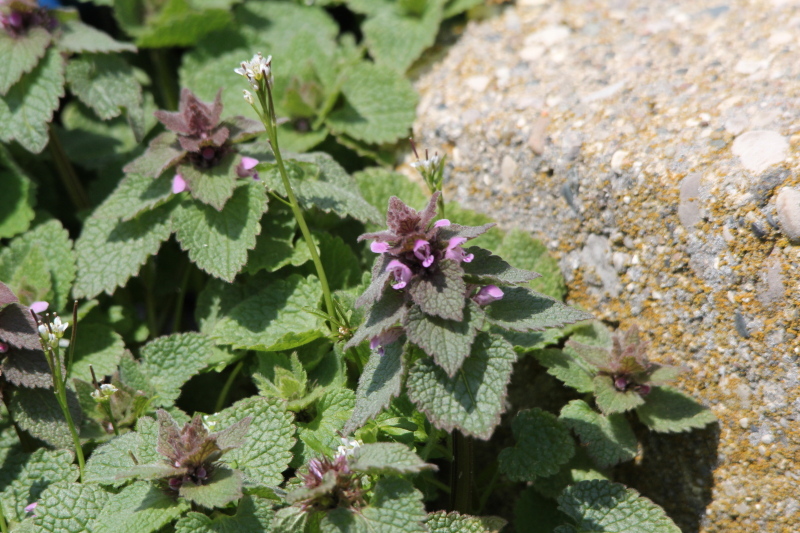 I have already located several areas that look good, now all it will take is some sun and warmer weather, and there will be flowers! Well, enough for today, on to Wednesday. OK, so it didn’t stick, but I am so tired of the cold gloomy weather we’ve had. Yes, we had a couple of nice days, but it rained most of Tuesday, and I woke up to snowflakes this morning. But, it looks like sring will finally arrive for this weekend! A couple of things in general before I go for my walk. I heard a story on NPR about a group of “environmentalists” who are undertaking a project of trying to cultivate redwood trees on five different continents where the redwoods aren’t native. Hence the quotation marks around the term environmentalists. Have humans learned nothing? 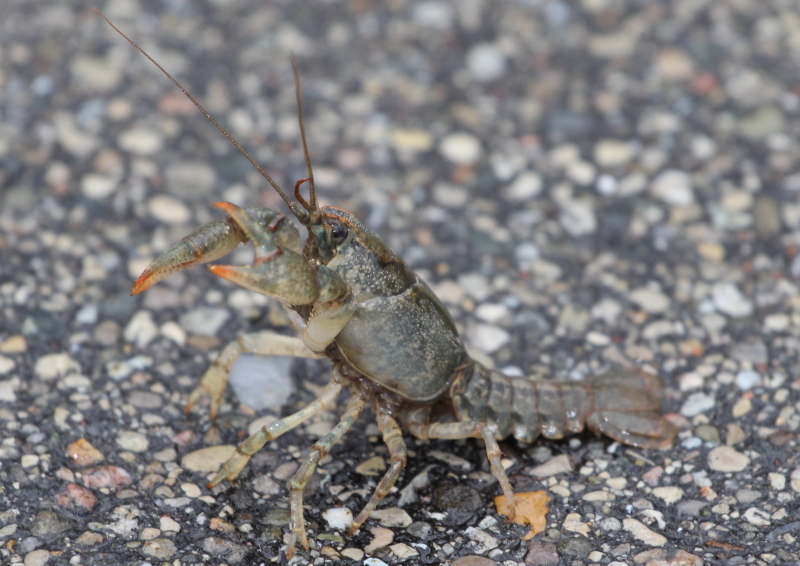 Especially since invasive species are becoming a major problem around the world? Redwoods may be magnificent trees, but the kind of thinking shown by this group and their project is one of the reason so many ecosystems around the world are threatened. But, this group is exporting redwoods to fight climate change, so I guess destroying natural habitats is OK then. Idiots! This was our third “100 year flood” in just over a century. 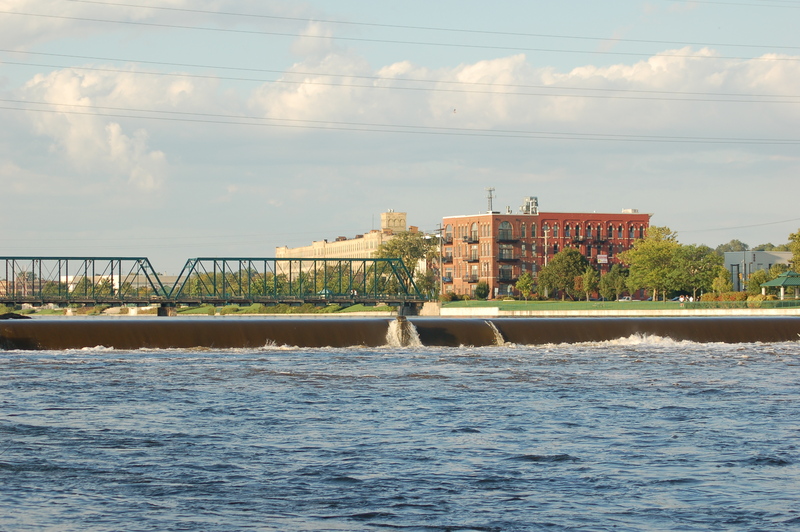 After the real flood of 1904, when large portions of the city were underwater, flood walls were built to protect the city of Grand Rapids from flooding. 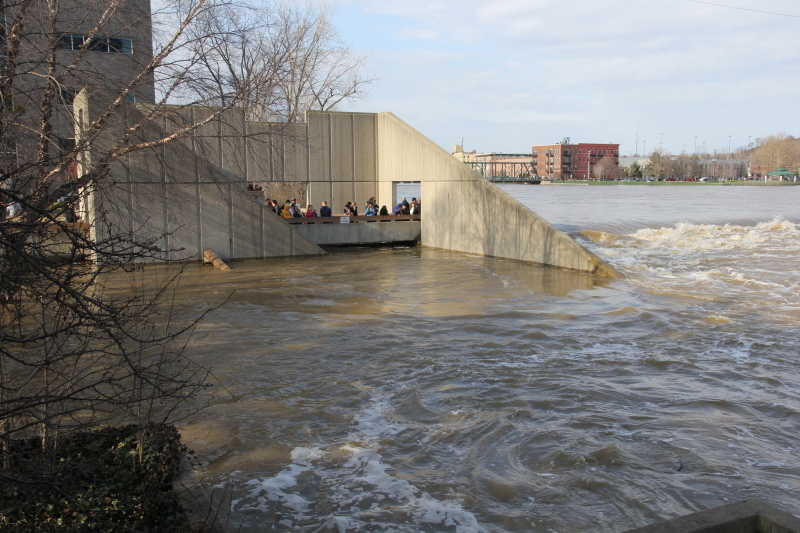 As they built the flood walls higher, they contained the river within the walls, which forces the river higher, rather than spreading out of the river’s natural floodplain. So, when the flood during the 1940’s hit, they found that they had to build the walls higher. By the flood of 1986, they had given up trying to go higher with the flood walls, as they figured out that the higher they build the walls, the higher they force the river to go. It’s a never ending battle. So, as far as the height of the river, this was a record flood, but that’s a little misleading. 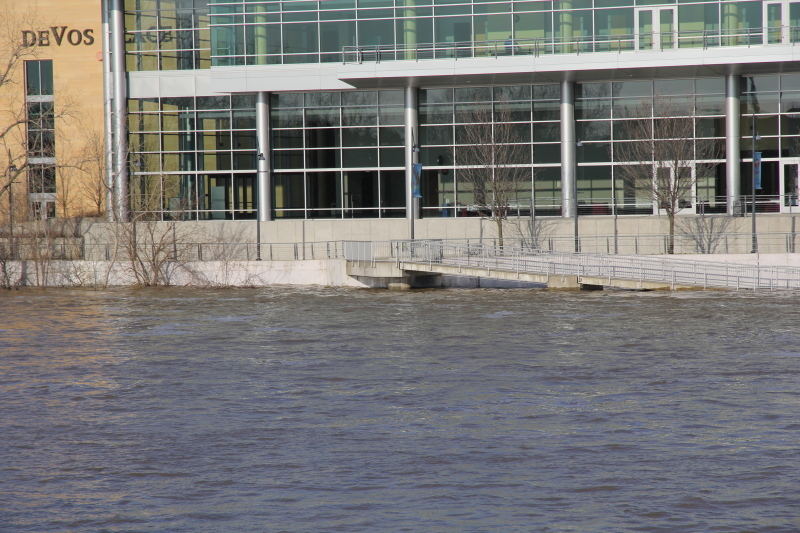 The volume of water was significantly more in 1904 (54,000 cfs) than here in April 2013 (33,700 cfs). 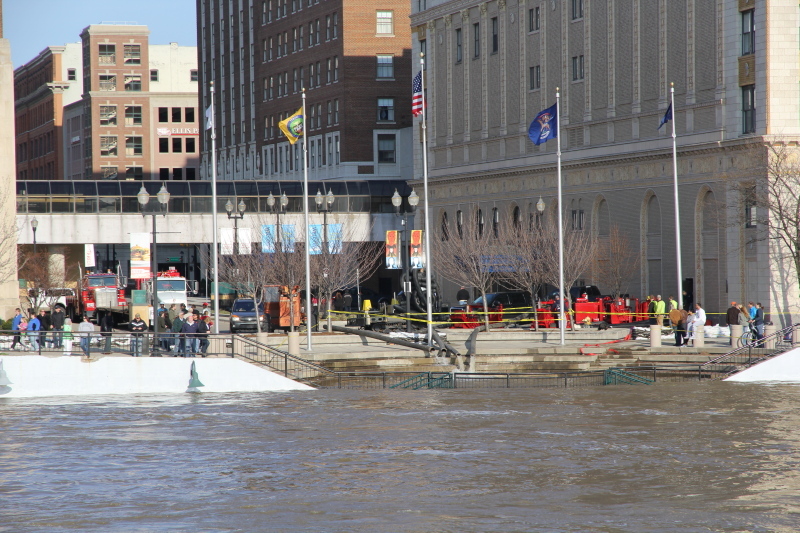 The water is now constricted to a narrow channel downtown, so when we have a flood, the river is forced to rise to a higher level than it did before the walls were built, so you get a higher number (21.85) for the crest. 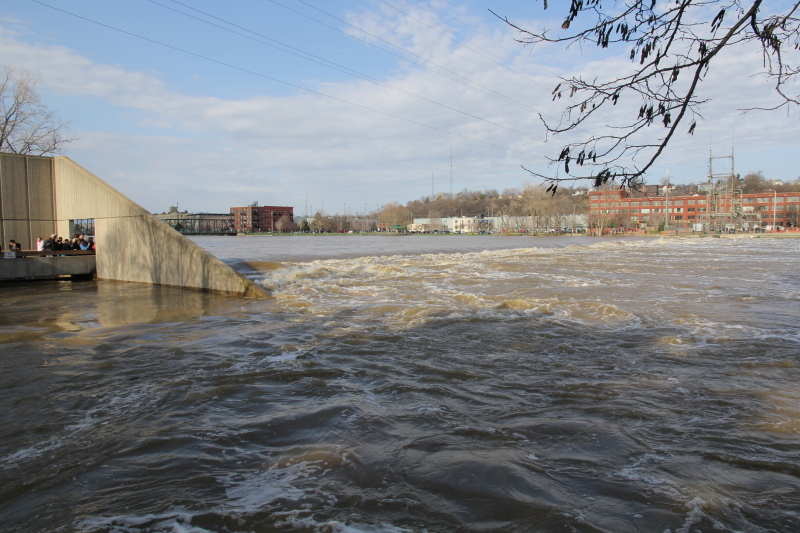 The floods of 1904, 1905, 1947 and 1948 all had higher volumes of water (cfs) than the flood of April 2013. Something to note is that our highest floods came back-to-back in 1904 and 1905 and again in 1947 and 1948. As far as the amount of rain we received, April 2013 has the third highest total precipitation on record, but it was almost three inches below the all time record of 13.22 inches in June 1892, and almost two inches below the 11.85 inches in September 1986. But, the month isn’t quite over yet, either. So far we’re at 10.41 inches for April 2013. One more item from the flood news, one of the local media outlets had water samples from the flood waters tested for E. Coli bacteria, and to no one’s surprise but the media types, the results came back showing elevated levels of the bacteria, duh! Reporting that is a little like reporting that it is dark at night, cold at the south pole, or that the sun is hot. Anyway, for my walk, I really hate whining about the weather almost as much as I hate the weather, but I’m tired of wearing a knit wool hat, gloves, a winter parka, and pulling the hood over my head to block the cold winds. 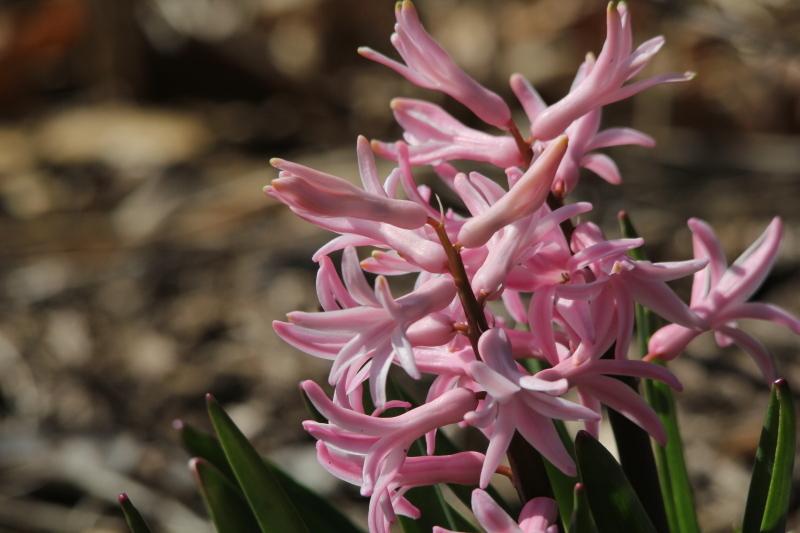 It’s the end of April, it should be spring. 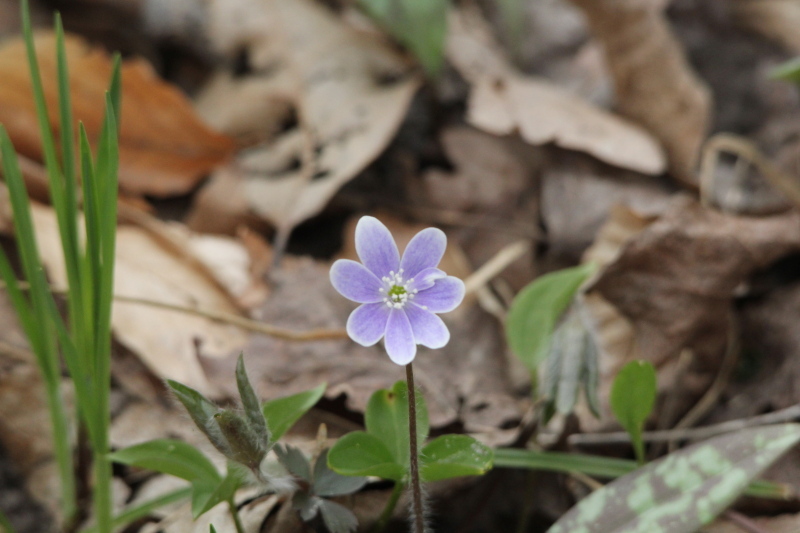 I took only a handful of photos, starting with one of the few flowers to be seen. 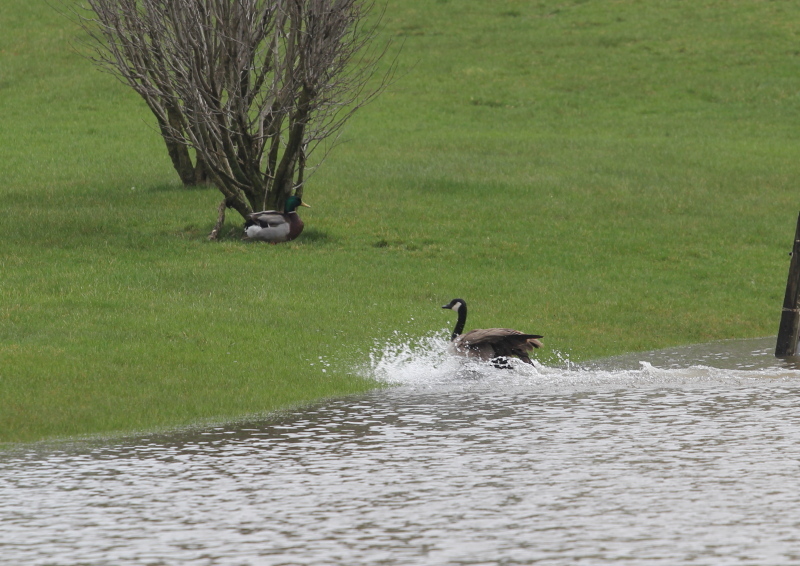 Oh, I carried the 70-200 mm lens today again because of the weather, and shot that with the flash. I will do better. 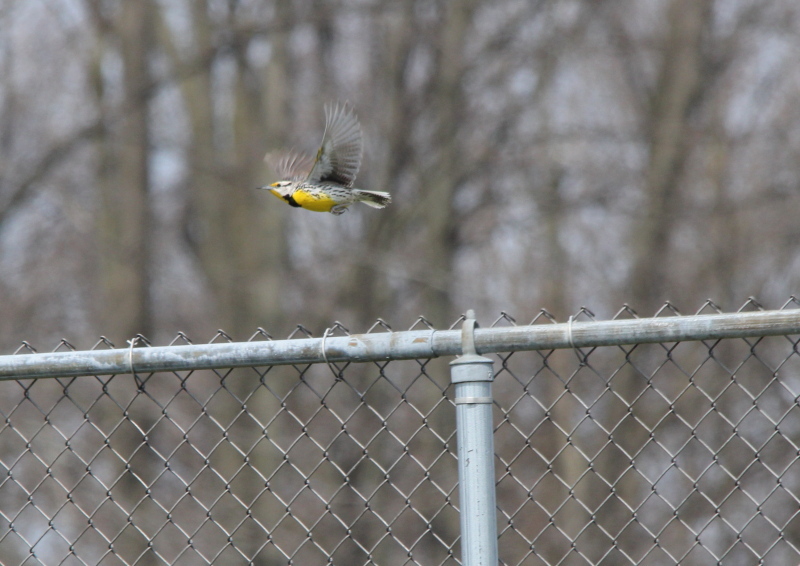 I have been trying to get shots of songbirds in flight, with little success. I figured out today that some of the same attributes of the new camera and lenses have that allow me to get good photos of birds partially hidden in the brush are working against me when it comes to flying birds. 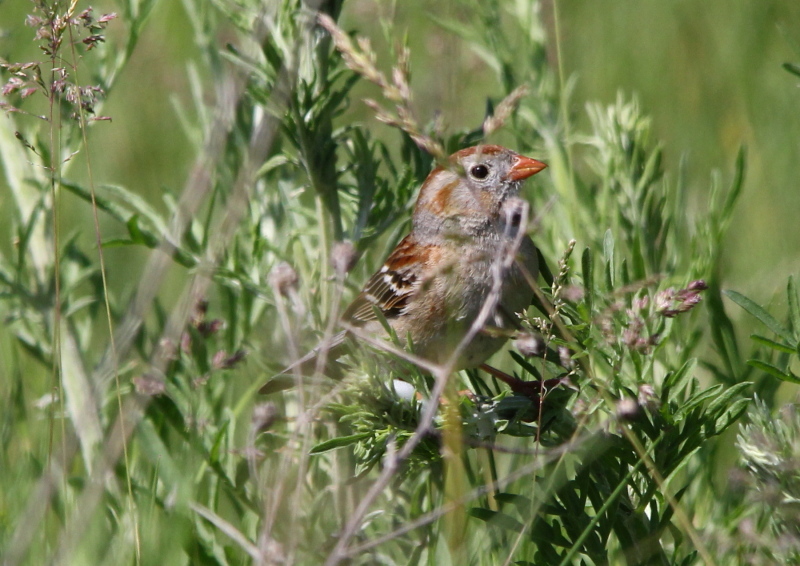 I can’t keep the small center single focusing point on a songbird in flight for very long is one problem. The other sounds funny, but, the new lenses are so much faster in focusing that I can’t anticipate when they are going to achieve a focus lock. The old Nikon auto-focus was so slow that I could see the subject coming into focus and be pressing the shutter release as the camera did achieve a lock. 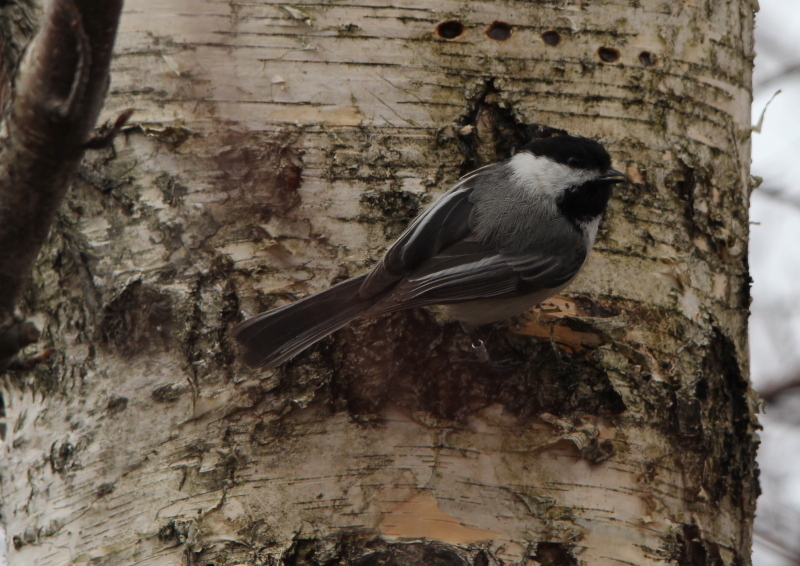 With the new camera and lenses, it gets a focus lock before I can react, and by that time, I have moved the single focus point off from the bird, and the camera is already focusing on the background when I press the shutter release. I know that I could change the camera settings for better results on flying birds, but then that would work against me when I’m shooting through the brush. Hmmm, what to do? I know, shoot larger birds! 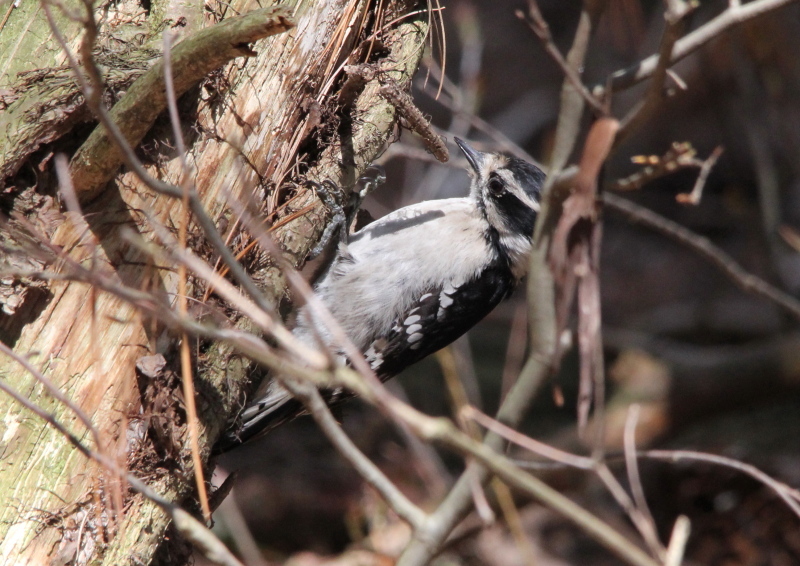 With larger birds, I can keep the focus point on them easier, especially since they tend to move slower as well. 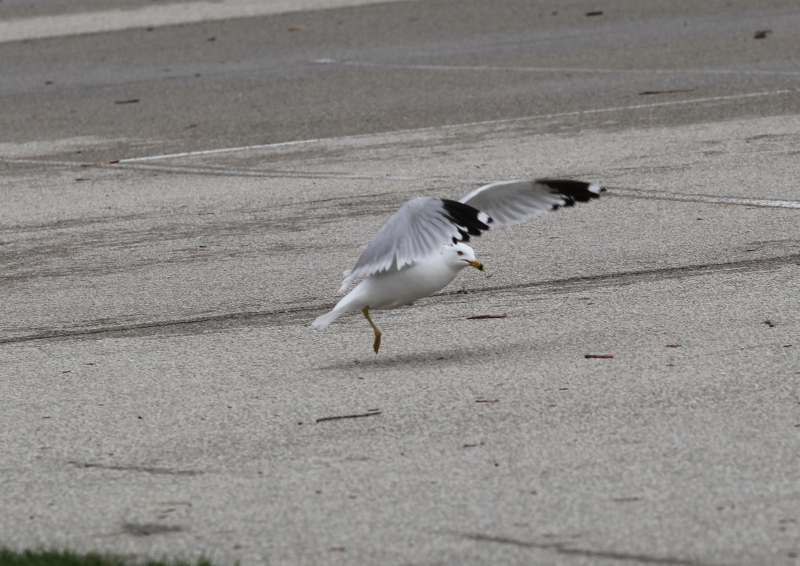 Part of the reason I shot the gull in flight was to remind myself to note that there was a flock of gulls in the park eating the nightcrawlers on the pavement of the parking lot. 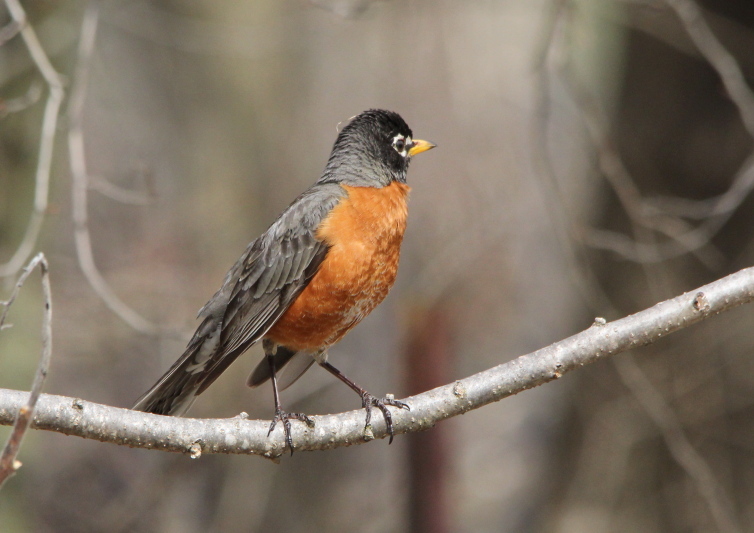 Last spring, I noticed that robins typically don’t eat the worms that are abundant on pavement after a rain, and wondered why that was. 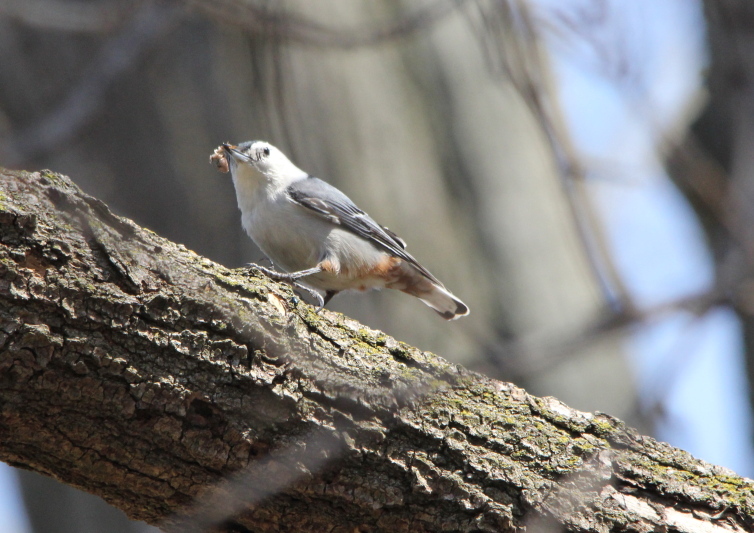 No one else seemed to have an answer either, and after I brought it up here on my blog, they noticed the same thing, that robins don’t go around eating what would seem to be easy pickings for them. After that, I observed turkeys chowing on the crawlers on the pavement, and now gulls doing the same thing. 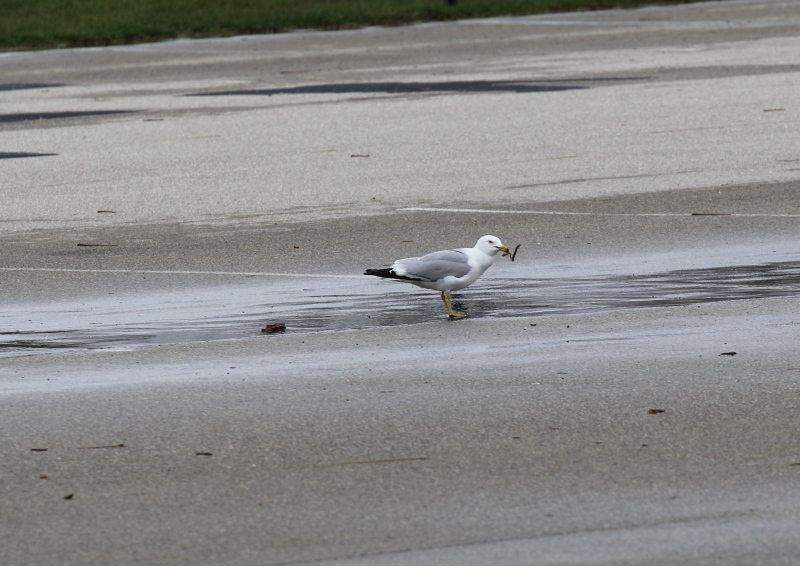 Even as the gulls were scarfing down the worms on the pavement, there were robins all around the edges of the parking lot, pulling worms from the ground. One of the great mysteries of nature I suppose. That was about all for today, on to Thursday. Cloudy, cold, windy, and of course, snow. I’m going to use the bad weather today as an excuse to at least postpone my daily walk, and go to the doctor to have my DOT required physical done. The precipitation is forecast to end by noon, I may get a chance for a walk after I get back from the doctor, we’ll see. Well, that did work, I’m somewhat surprised. It took way too long at the Med center that my employer uses, though I did get a walk in, it had to be quick, and I don’t have time to download the photos before I head to work. 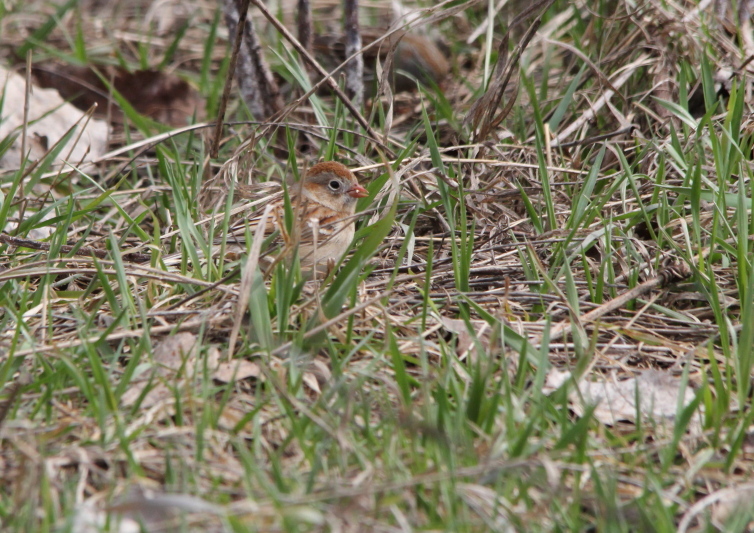 Early afternoon is not prime birding time, but I did see a flock of white-throated sparrows, a pair of bluebirds, and a few field sparrows to photograph, I think, I’ll have to double-check the field sparrows, as I saw white rumps on what I think are the field sparrows. Time for work, darn. 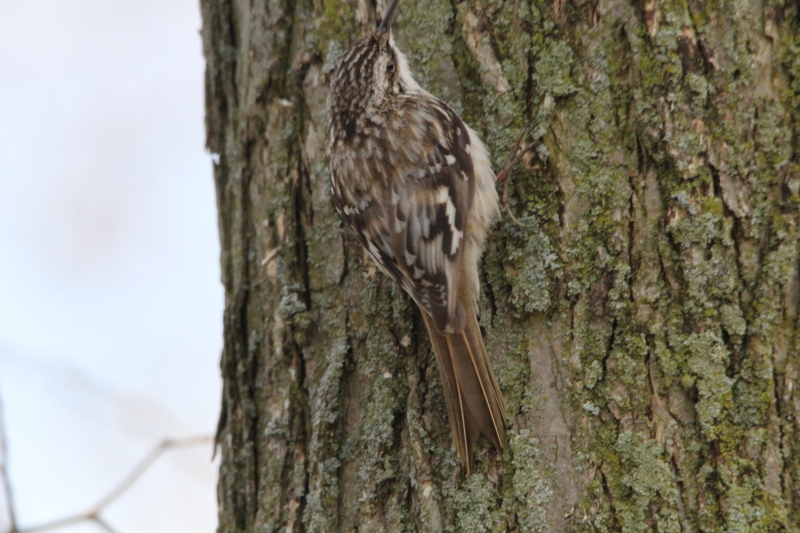 Well, here’s a few of the photos, I had forgotten about the brown creeper. 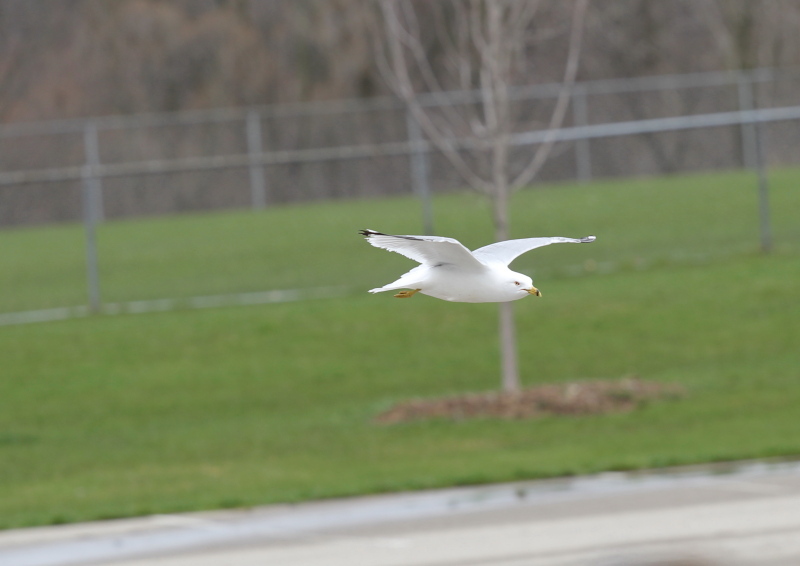 I am throwing that one in to prove that even with the Sigma lens, a sharp photo isn’t guaranteed when a bird refuses to stop moving for even a split second. 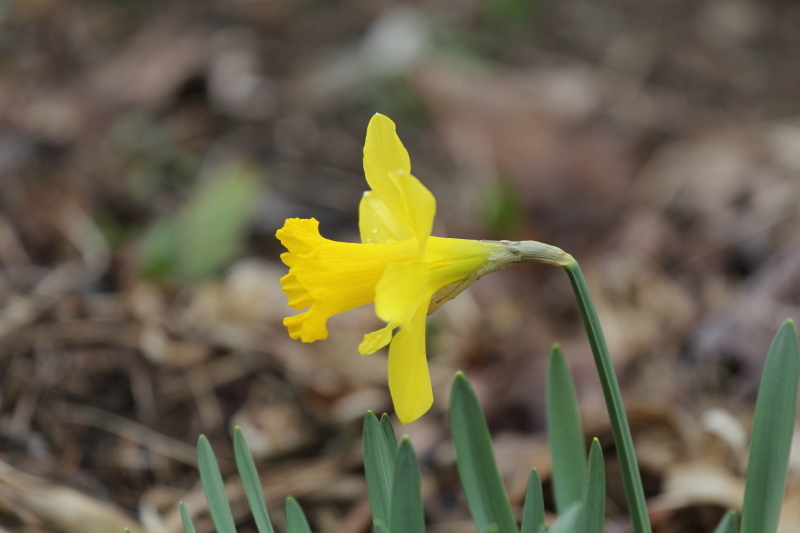 Tomorrow marks the beginning of what is forecast to be our first week of spring weather, with pleasant temperatures, and little to no rain, best of all, no more snow! The bright side of the flooding, Lake Michigan is up six inches in just twelve days, an incredible rise for a lake that large! Since the lake was near record low levels over the winter, this is really good news. Even with the forecast of great weather, I’m not sure what I’m going to do this weekend. Gas is back up to almost $4 a gallon, and I don’t feel like making the oil companies any richer, especially since as the price of gas was jumping up, the price of crude oil was dropping. Then, there’s the flooding, one of the reasons that the Great Lakes have risen so much is that while the flooding was the worst here, it is more or less state-wide. I see no reason to drive to an area to find it flooded, I can stay home and find flood waters. One thing about my physical yesterday, I was sitting in the examination room when a very overweight doctor waddled in short of breath from the effort of walking a few feet, and he proceeded to lecture me on my health, specifically smoking. OK, I know I should quit, I am tapering off, not as quickly as I should be, but at least I’m heading the right direction, especially since I have lost 60 pounds since my last DOT physical. However, when the doctor is in very poor shape, much worse than the patient, does he really expect people to listen to him? He had to pause to catch his breath several times during the course of his lecture. I was worried that he was going to have a heart attack in the middle of doing my exam. 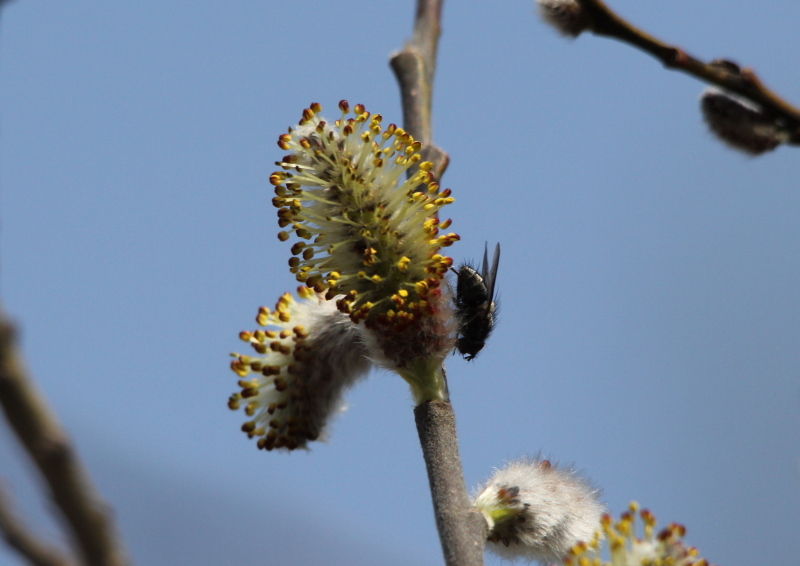 Now then, for my walk, spring is finally here! 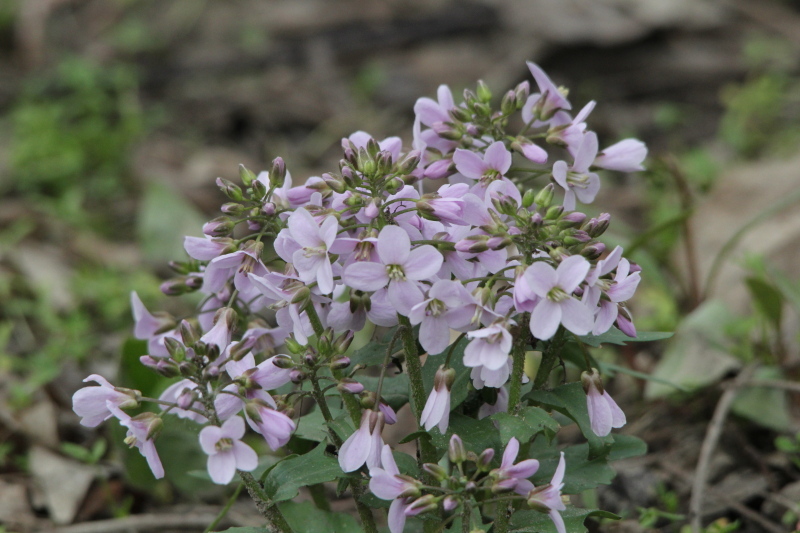 OK, the Sigma 150-500 mm lens does not make a good macro lens, especially not on a breezy day like today. Several times I was tempted to switch lenses, but just about the time I would talk myself into it, I needed the Sigma’s length. I’m having difficulty getting close to the meadowlarks and other species of birds that spend most of their time in open fields, I’m not used to that habitat. 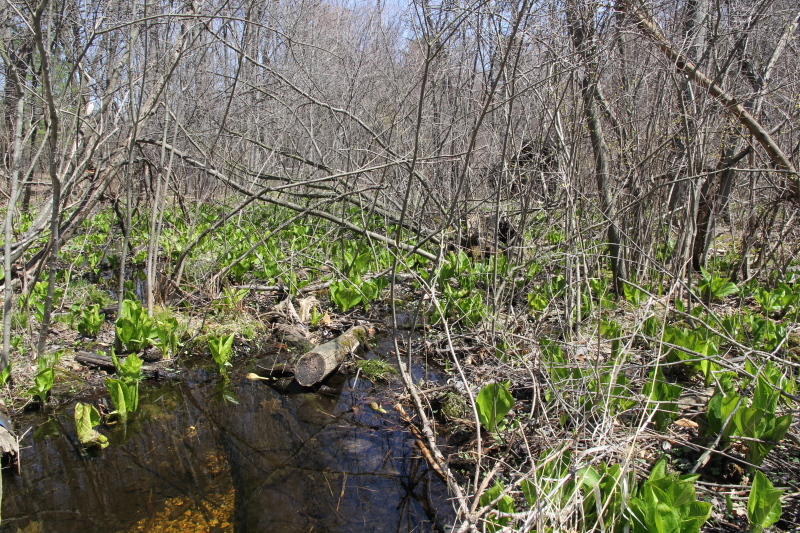 I’m a creature of the woods and water, fields are something to cross to get to the next woodlot, stream, or lake. That’s going to have to change, as I am developing a much greater appreciation for all the species of wildlife that inhabit fields, not just birds. 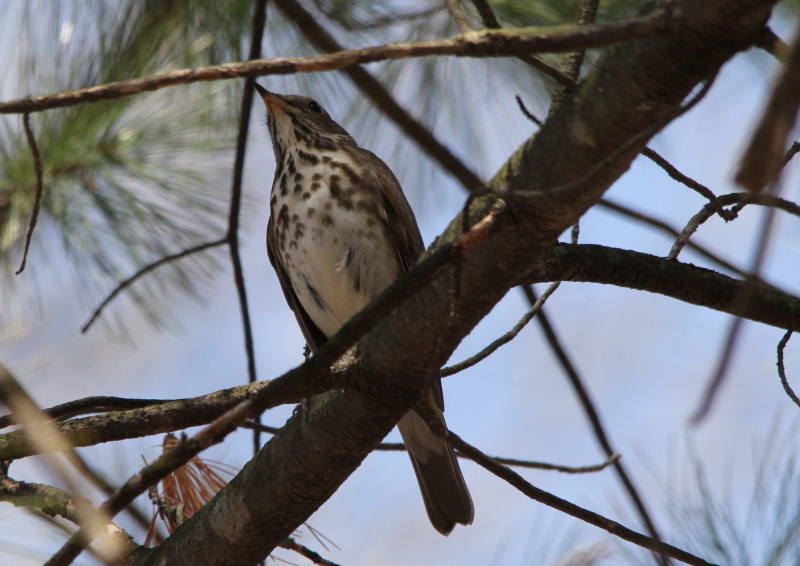 Anyway, I had almost convinced myself to switch lenses on the last leg of my walk when I spotted one of the brown thrashers back in the very thick brush, where they love to spend most of their time. 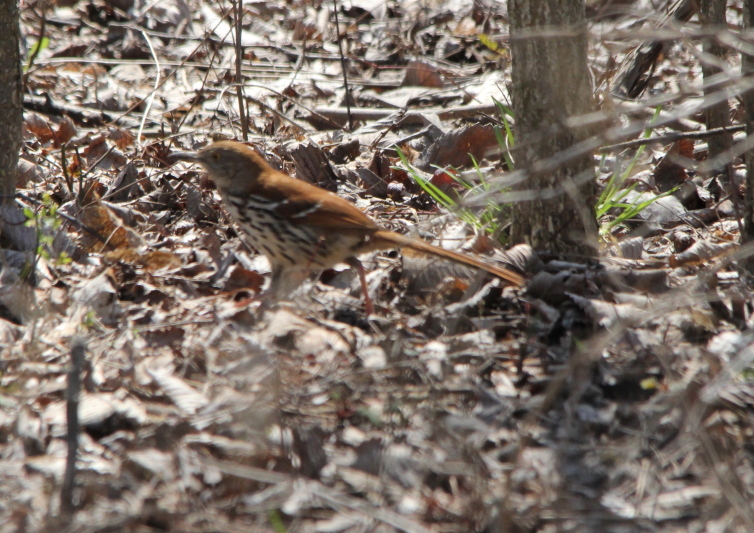 I was working my rear end off trying to get good photos of the thrasher out in the open. I tried getting ahead of it and waiting for it to appear in an opening. At one time I thought that I had it, but I was supporting the camera and lens on top of a fence, and when I moved the camera the last few inches to get the shot, the fence started to bend under the weight, and ruined that shot. 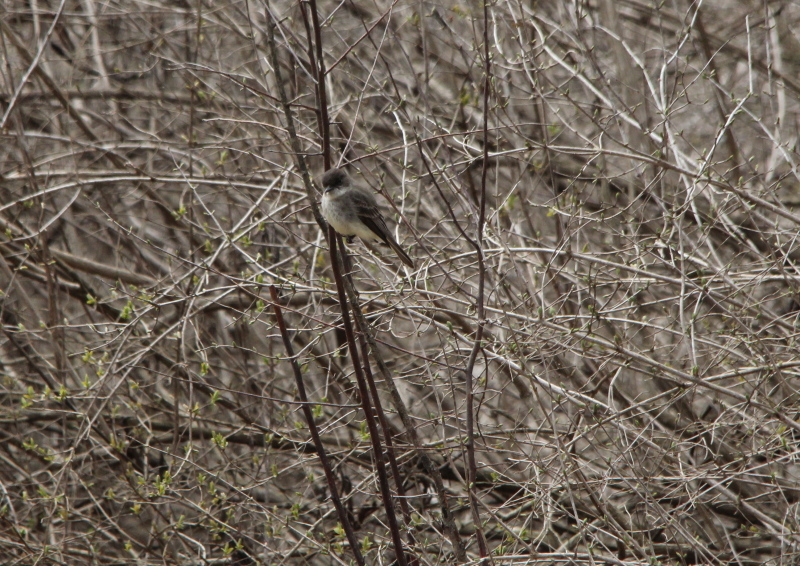 There was another thrasher back even farther in the brush, I didn’t bother to try for that one. The thrasher that I was following seemed to be headed for a more open area, I got set up, this time using a fencepost for support, and waited. Not once did it stop in the open, it was on the run when I shot that last one as you can see by its leg. But, I’m patient if nothing else. 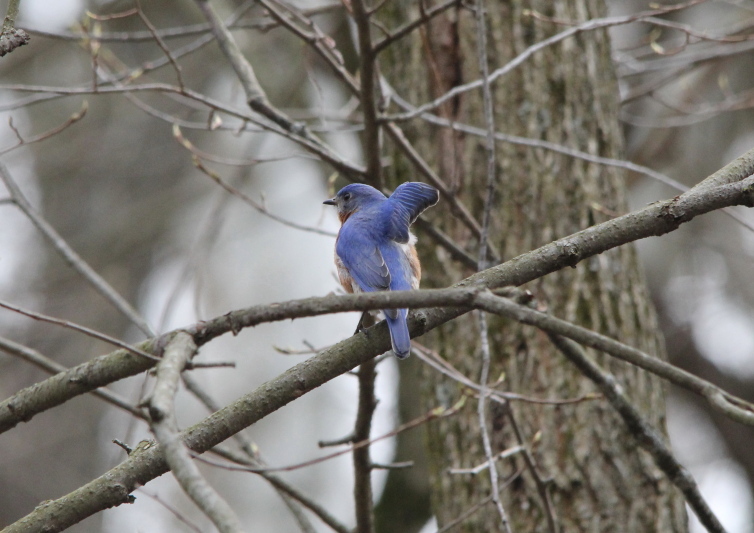 The second one had joined the first, and while I never got a clear shot of both of them, I did get a few of each. They may not be great because I was forced to shoot towards the sun, but they are good enough for here, and for the My Photo Life List project. Another species I’ll be able to check off! 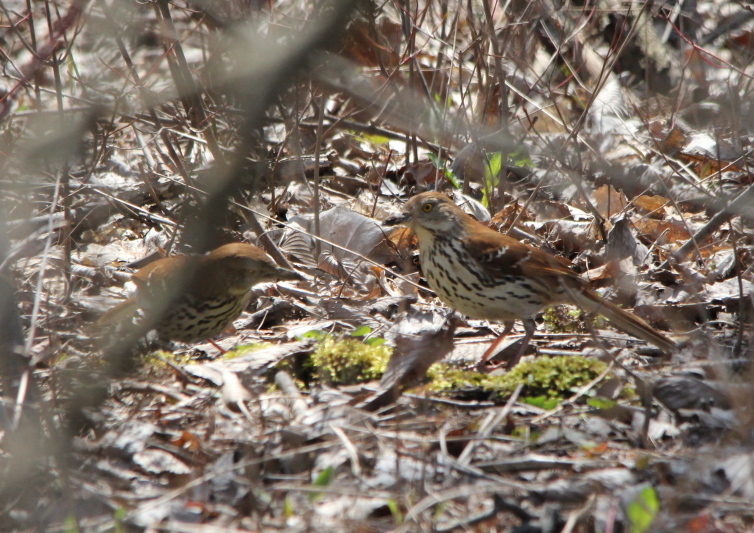 And, I hope that it goes the way with the brown thrashers the way it has gone for so many species of wildlife, once I get fair photos of them, it gets easier to get better photos. I don’t know why that is, but it happens over and over. I’ll chase a species for days, weeks, or even months to get one not so great photo, then it is almost as if they start posing for me. Anyway, that’s it for the day. I think that I’ll go to Palmer Park, the county park not far from home tomorrow, and spend the entire day there. I’m even going to pack a lunch to take with me, and spend more time just sitting, enjoying some nice weather for a change. 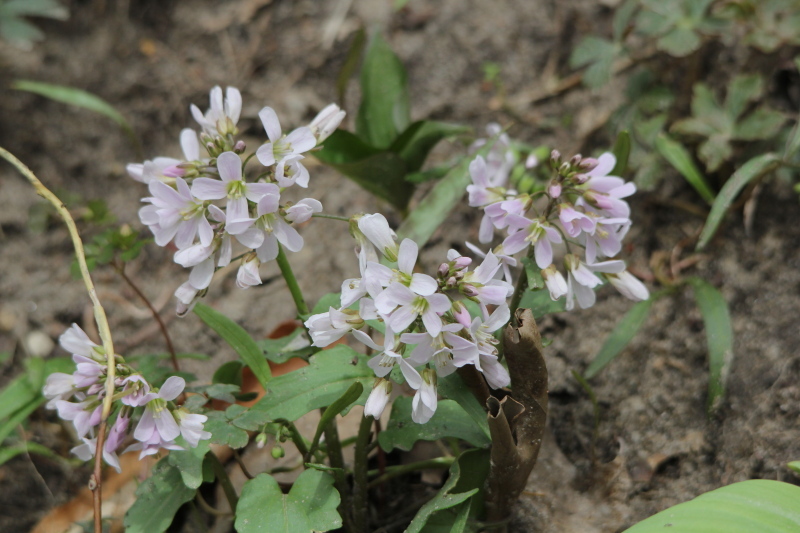 Then on Sunday, head for Aman Park, which is known for an abundance of wildflowers. 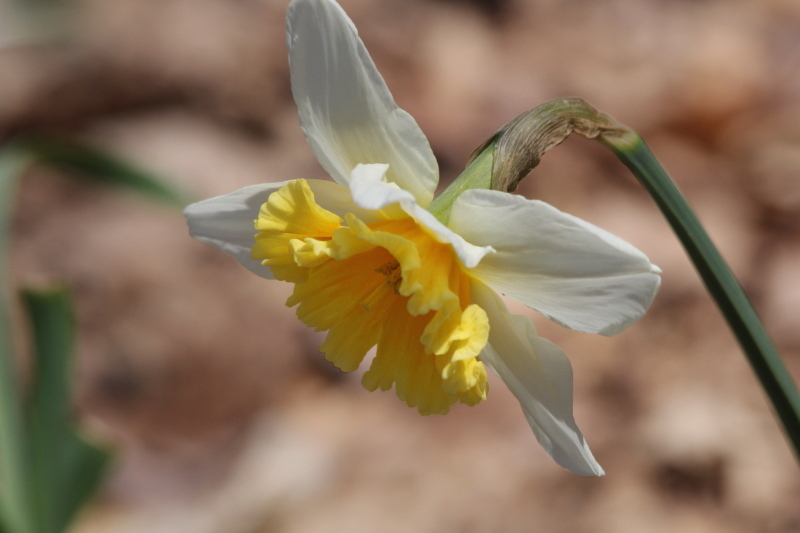 It may be too early for many flowers, but I won’t know unless I go. 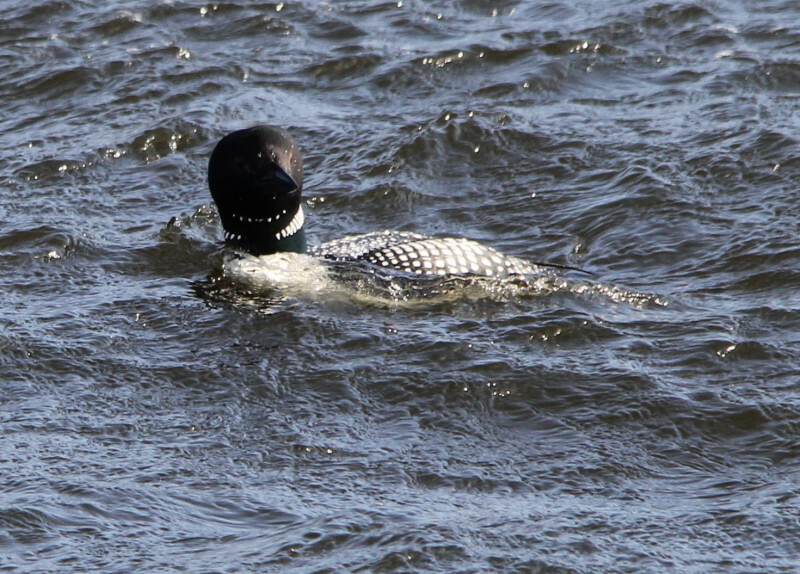 The Great Northern Loon, is a large member of the loon, or diver, family of birds. 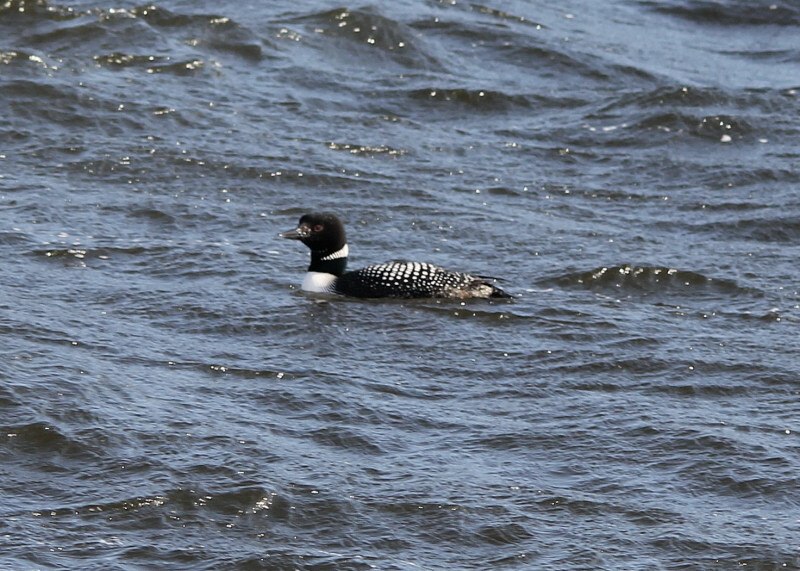 The species is known as the Common Loon in North America and the Great Northern Diver in Eurasia; its current name is a compromise proposed by the International Ornithological Committee. 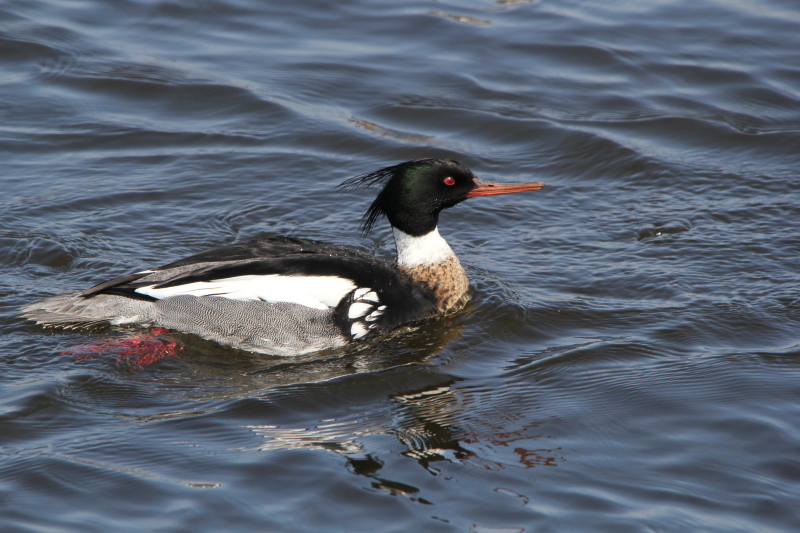 Breeding adults have a black head, white underparts, and a checkered black-and-white mantle. 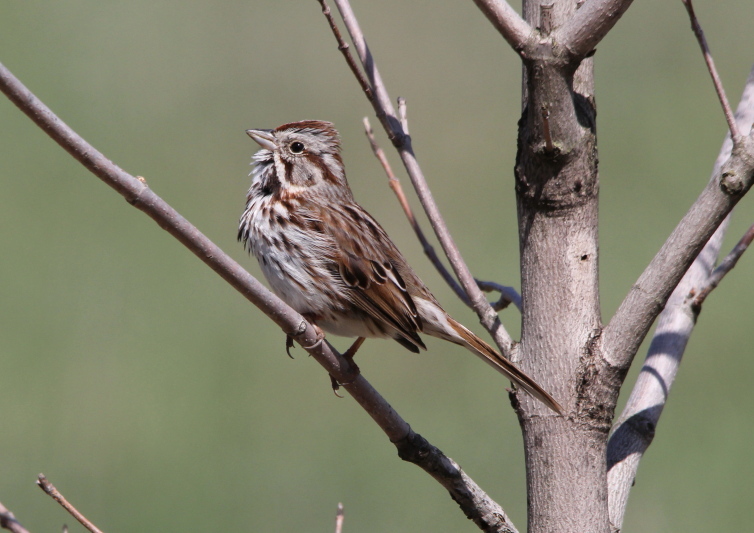 Non-breeding plumage is brownish, with the chin and fore-neck white. The bill is black-blue and held horizontally. 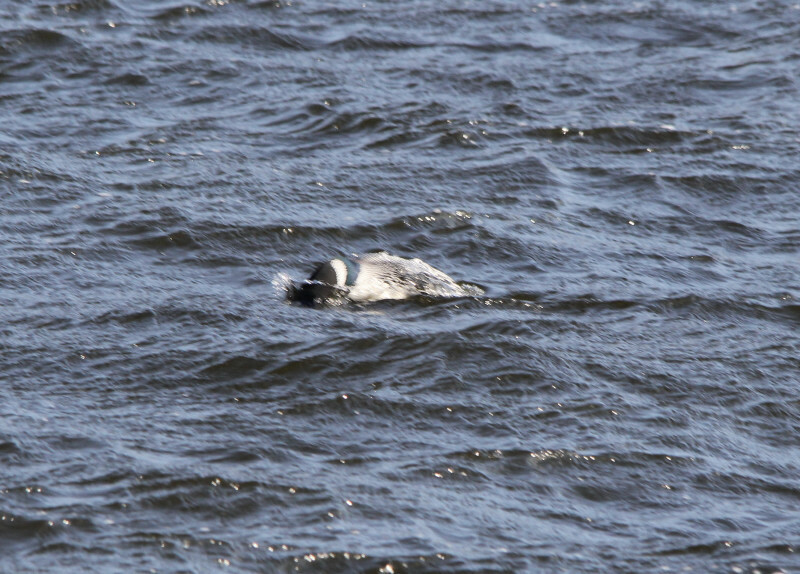 The bill color and angle distinguish this species from the similar Yellow-billed Loon. This species, like all divers, is a specialist fish-eater, catching its prey underwater, diving as deep as 200 feet (60 m). Freshwater diets consist of pike, perch, sunfish, trout, and bass; salt-water diets consist of rock fish, flounder, sea trout, and herring. 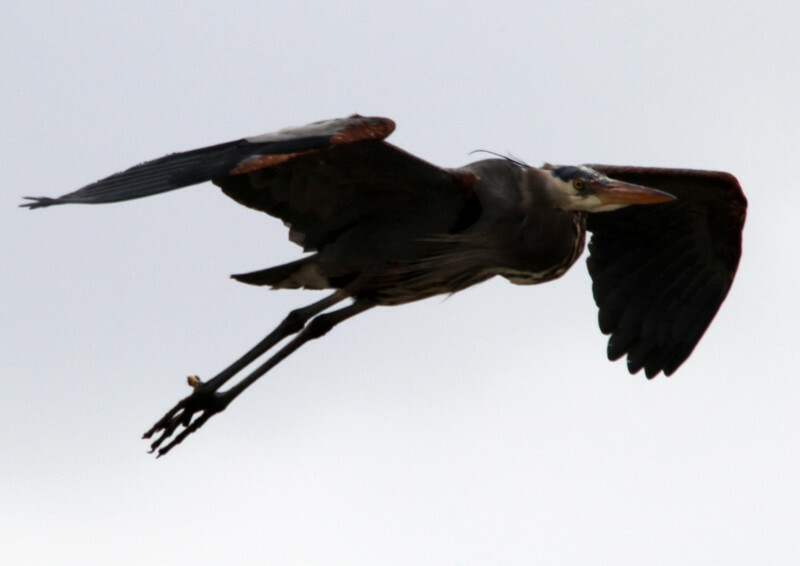 The bird needs a long distance to gain momentum for take-off, and is ungainly on landing. Its clumsiness on land is due to the legs being positioned at the rear of the body: this is ideal for diving but not well-suited for walking. 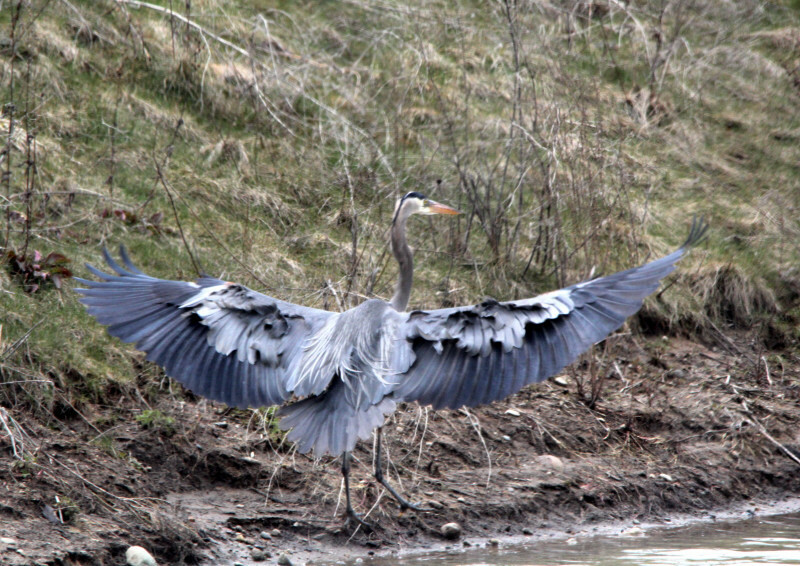 When the birds land on water, they skim along on their bellies to slow down, rather than on their feet, as these are set too far back. The loon swims gracefully on the surface, dives as well as any flying bird, and flies competently for hundreds of kilometers in migration. 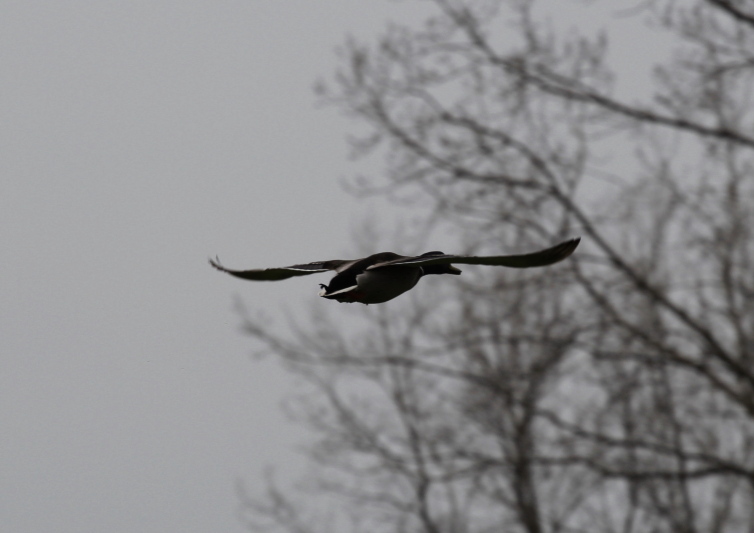 It flies with its neck outstretched, usually calling a particular tremolo that can be used to identify a flying loon. 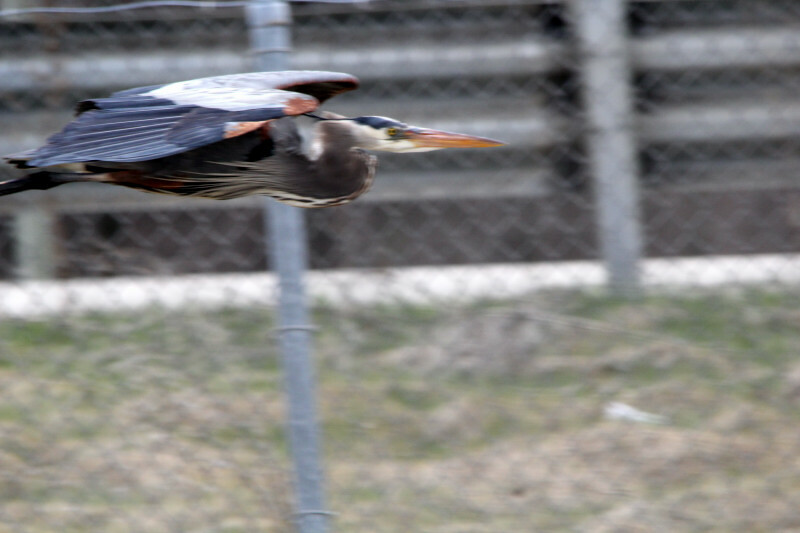 Its flying speed is about 120 km/h (75 mph) during migration. Great Northern Loon nests are usually placed on islands, where ground-based predators cannot normally access them. 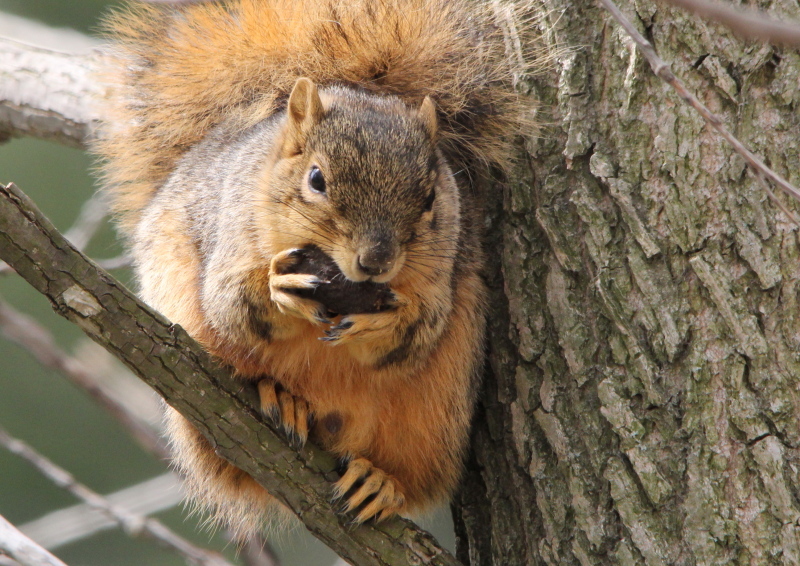 However, eggs and nestlings have been taken by gulls, corvids, raccoons, skunks, mink, foxes, snapping turtles, and large fish. Adults are not regularly preyed upon, but have been taken by sea otters (when wintering) and Bald Eagles. 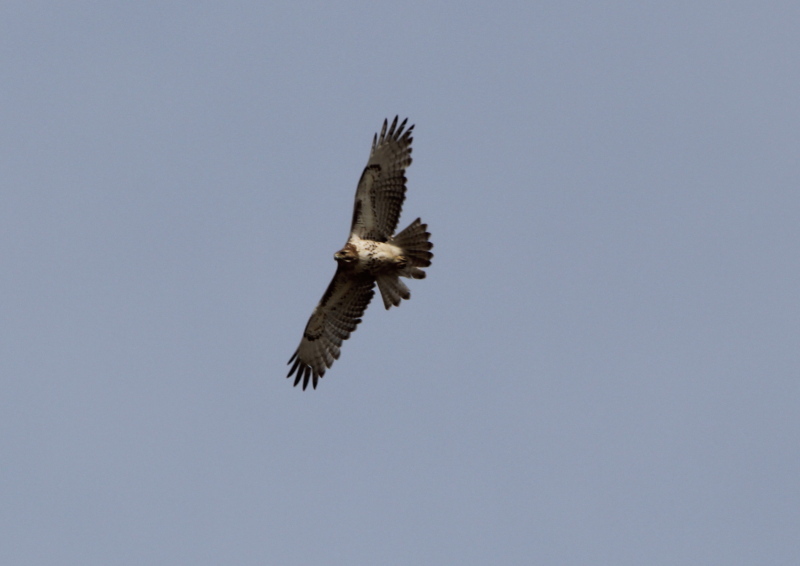 Osprey have been observed harassing divers, more likely out of kleptoparasitism than predation. When approached by a predator of either its nest or itself, divers sometimes attack the predator by rushing at it and attempting to impale it through the abdomen or the back of the head or neck. 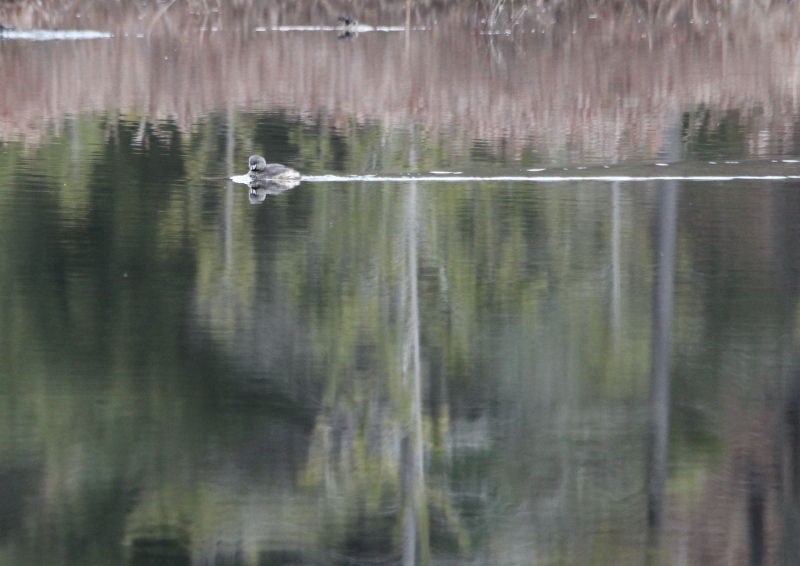 Loons are solitary birds that do not tolerate human activity very well. This is number 90 in my photo life list, only 260 to go! I came back extremely arm weary! 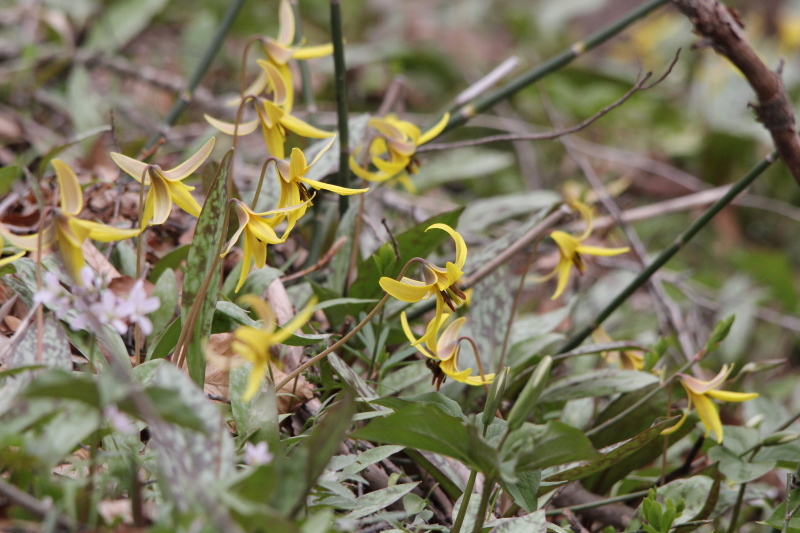 Yes, another birding trip to the Muskegon area, I did look for wildflowers, honestly, I did. But there were none to be seen at any of the place I went. I really wanted to try out the close focusing performance of my new lenses, particularly the 15-85 mm I purchased this last week. So, once again, this is going to be mostly birds, with a few other things thrown in to break up the monotony. My first stop was Lake Harbor Park on the west end of Mona Lake. I have posted about it before, and it is on the opposite end of Mona Lake from where I went to shoot the eagle photos last month. Some one had posted that they had seen a flock of avocet there last week, but neither I, nor any one else who showed up looking for them could find them. I did find this guy though. For all the years that I used the Nikon D50 I tried to get an acceptable photo of one of these, and never did. 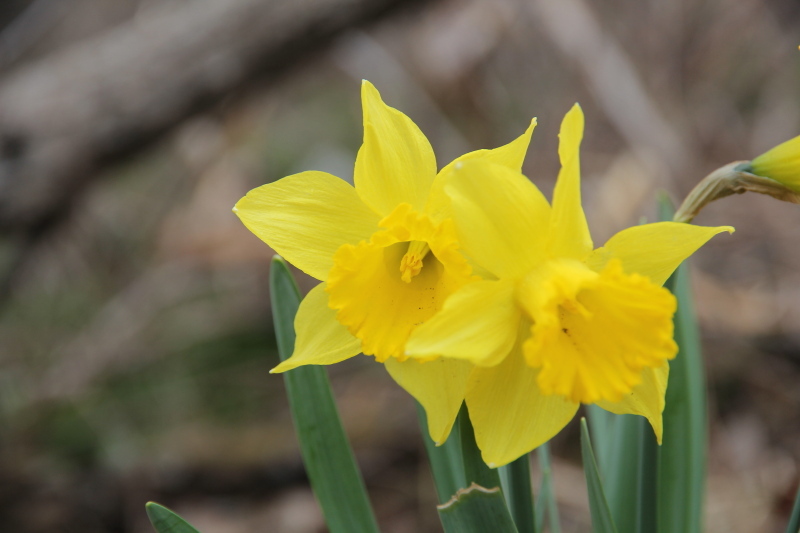 I am learning just how much better this new Canon 60 D is when compared to the Nikon, what a difference! 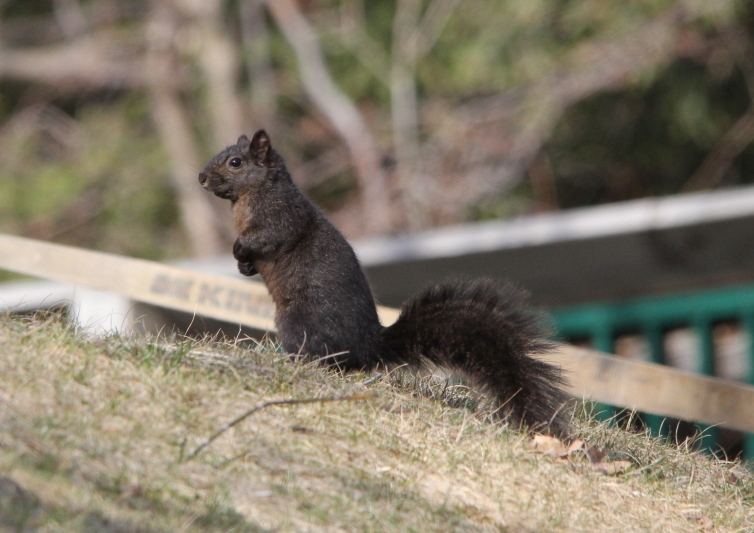 In fact, now it’s easy to get good photos of grey squirrels in the black phase. No more unrecognizable black lumps! I am quite surprised by the difference that there is between the camera bodies, I attributed most of my problems to the inexpensive lens I was using. However, I am not going to go back on what I said in my post about buying camera gear on a budget. In fact, I think that what I’m learning reinforces that in many ways. Sure, the Canon 60 D body is light years better than the old Nikon D 50 body, but most of that is due to improvement in sensor technology over the years. The 60 D is not an entry-level body, but it is the lowest priced body in Canon’s mid-level bodies. Couple that with some quality glass, and for the first time since I switched to digital, I am getting some really good photos now. I still contend that if you’re in the market for new camera equipment, start with the lenses, buy quality glass, then buy the best body that you can afford. That brings up something else, I am developing an entire new attitude towards my photographic endeavors. I trust the Canon and the lenses I have now, and I find myself being much more selective as to what and when I shoot. With the Nikon it was shoot anything at any time, and hope to get a good photo. Maybe the highest compliment that I can give to my new gear is that it is predictable, after less than 1,000 pictures, I know what I am going to get. I shot over 40,000 with the Nikon, and never knew how any of them would turn out. I don’t feel like rehashing all the problems I had with the Nikon, but I think that you can see the leap in the quality of the photos I’m posting, even in the reduced quality versions you see online here. So, now I see a species of bird that I have already photographed with the new Canon, and I think to myself, I already have a better shot than what I’m going to get this time, there’s no need to shoot and hope. That doesn’t stop me from shooting lots of photos though, as there are so many things to photograph, but here’s an example from today, even if it is out of order as far as the way the day progressed. That photo has not been cropped at all! It would be darned hard to get a much better photo than that, unless I catch one so close that I can zoom out and still nearly fill the frame. 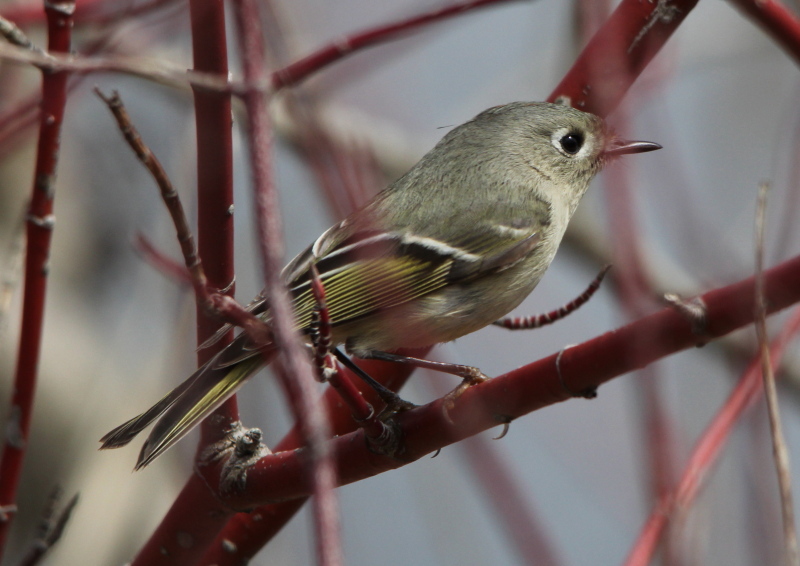 So after that one, I won’t be shooting many ruby-crowned kinglets any longer. Could it be that I’ll run out of things to photograph with the new Canon? I doubt it. OK, now let’s get back to the beginning. 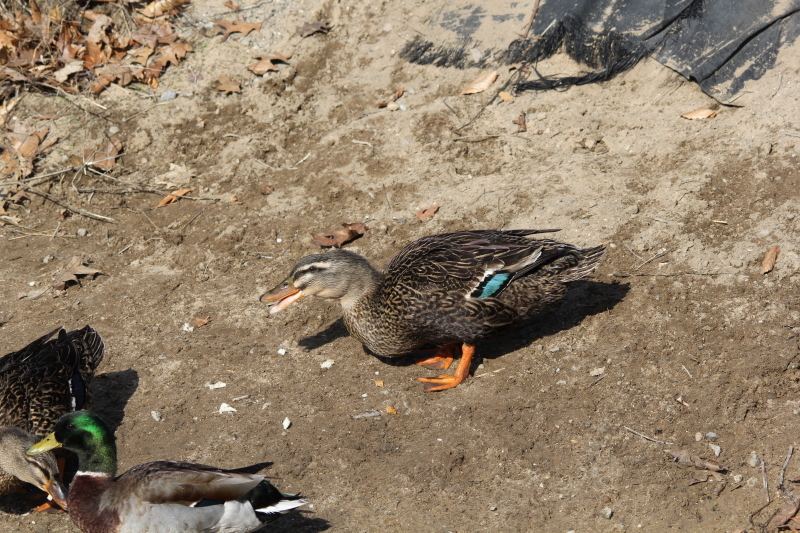 I never did find the avocet, but there were other things to photograph besides the squirrels, like a pair of American black ducks hanging out with some mallards. 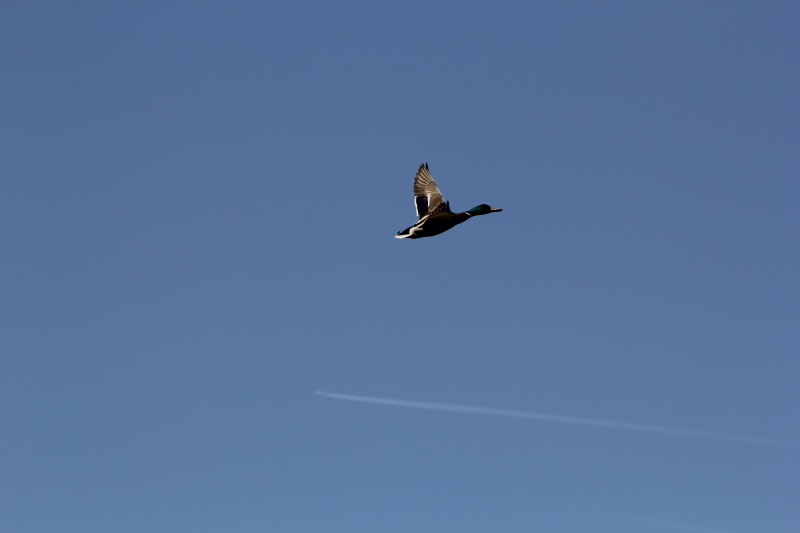 And, to practice on my action shots, a male mallard coming in for a landing. 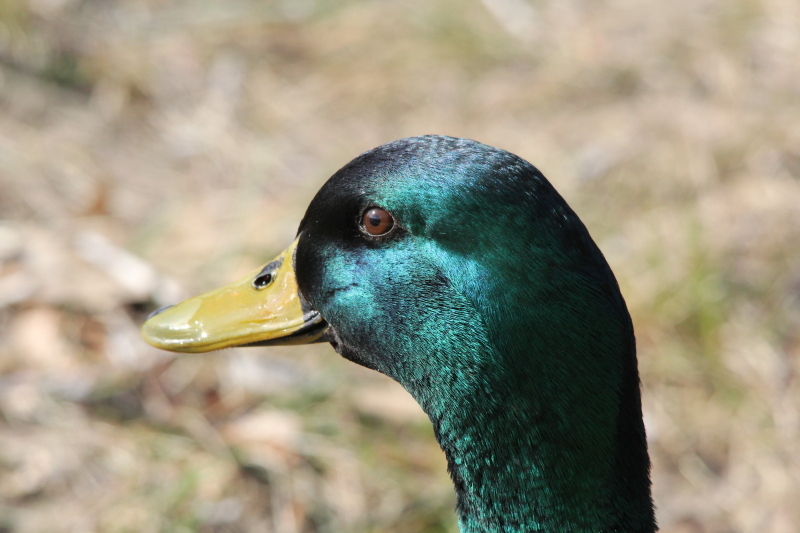 And, since I’m a frustrated portrait photographer at heart, a few mallard portraits to test out my new gear. 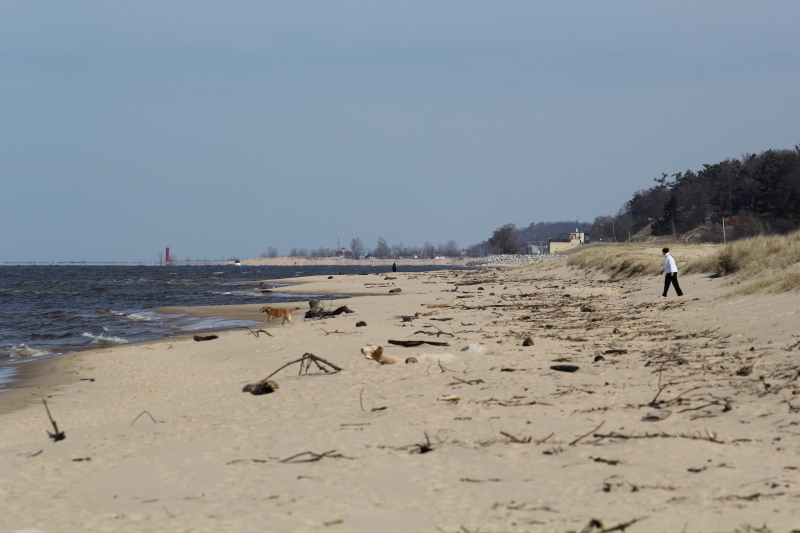 Then, I strolled down the channel to the Lake Michigan shore, I thought that it would be a good spot to compare the performance of my lenses. Here’s the shoreline shot with the Sigma 150-500 mm set at 200 mm…..
Here’s about the same shot with the Canon 70-200 mm L series lens set to 200 mm. I took a series of shots with each lens, they aren’t very interesting, so I won’t bore you with them. But, the replacement 70-200 mm is definitely sharper than the one I exchanged! I wonder if there are slight differences between bodies and lens that cause slight, but noticeable problems? I didn’t get the composition exactly the same with each lens, as I didn’t really want to be changing lenses on the sandy beach, so to switch, I walked back to where there was vegetation to prevent any sand blowing around, and into my camera or lens. It was while walking back off the beach that I found this guy brightening up an already cheery day with his song. Anyway, I am very happy with the replacement L series lens, but I can’t say as I can see why people go so gaga of the L series lenses, it doesn’t look much if any sharper than the Sigma. I later tested the 15-85 mm lens, and found out that it is just as sharp as both of the longer lenses, so now I no longer have any reason to blame my equipment when I take crappy photos. And I do still take crappy photos, even though I know that they will be crappy when I shoot them. One more thing about the time that I spent comparing the lenses on the beach. I said earlier that the results that I see from the Canon are predictable, and they are. I knew that the shots on the beach were likely to be a little over-exposed with the Canon. So, not only did I check the lenses, I also played with the exposure compensation at the same time. I shot the series with each lens with the exposure compensation set at 0, -1/3, and -2/3 stop compensation, and just as I suspected, -1/3 stop came out the best, with both lenses. I’m feeling like a real photographer again! 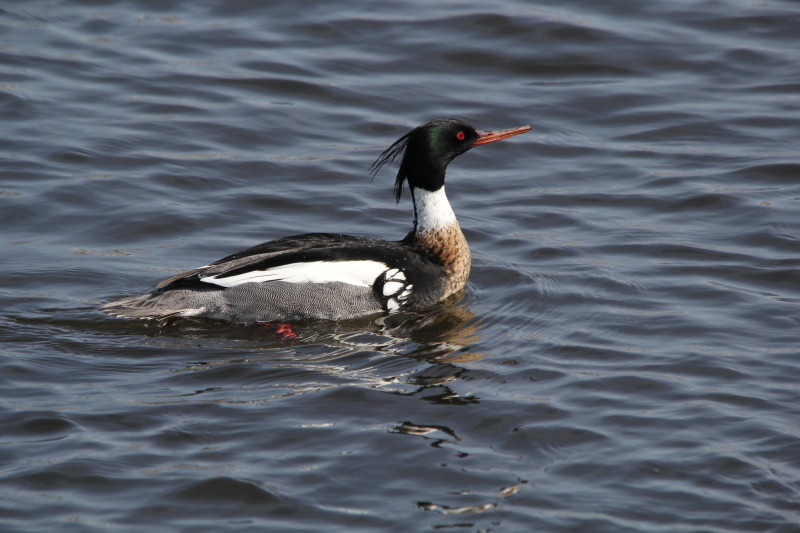 I shot a few other subjects with the L series lens, it’s a keeper, but I won’ bore you with those photos, as they’re nothing special, besides, you all want to see your favorite punk rocker ducks, the red-breasted mergansers, don’t you? None of those were cropped either, and they were taken at the Muskegon channel, my second stop of the day. I have to say that some good weather and a good camera and lens makes for some much better photos than I am used to turning out! A walk up and down the channel didn’t yield many more waterfowl photos, just a few coots, a goose, and a mute swan on her nest, nothing special, so I’m not going to bore you with them. 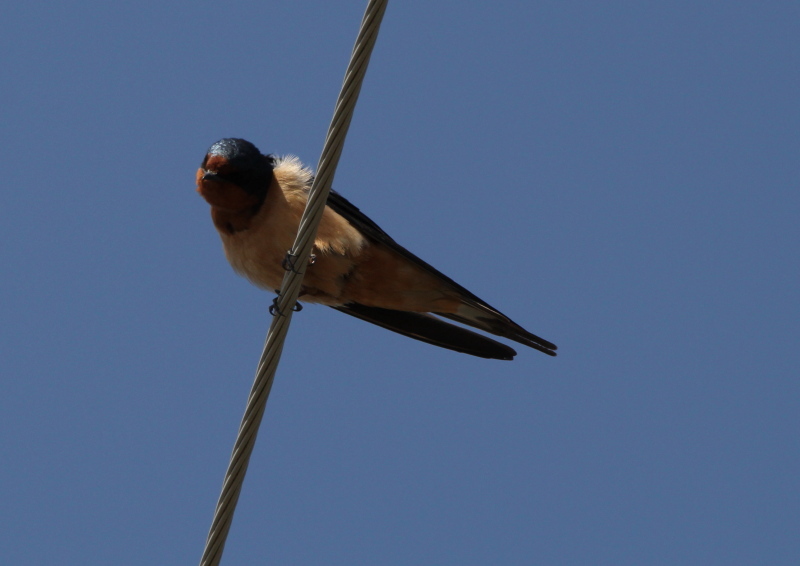 I did however manage a few photos of a pair of barn swallows taking a break. 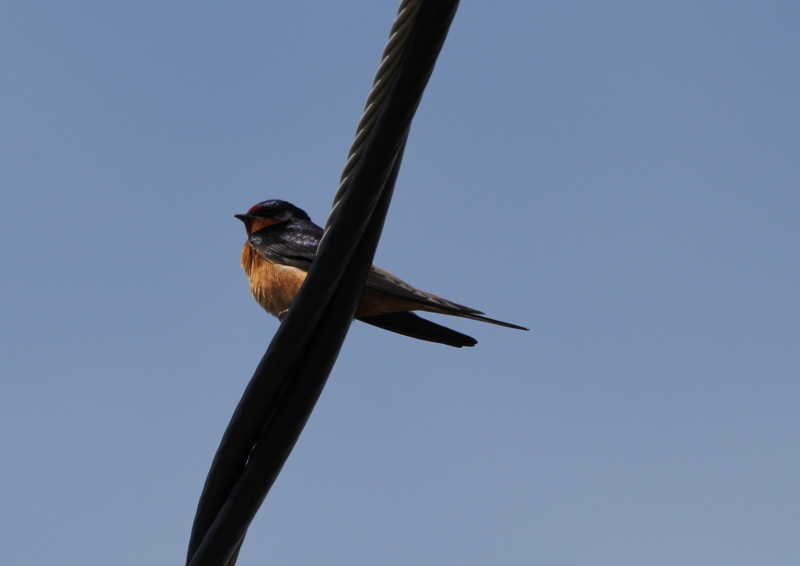 I think that the barn swallow was looking into the lens hood of the Sigma lens thinking that it would be a good place to build its nest. 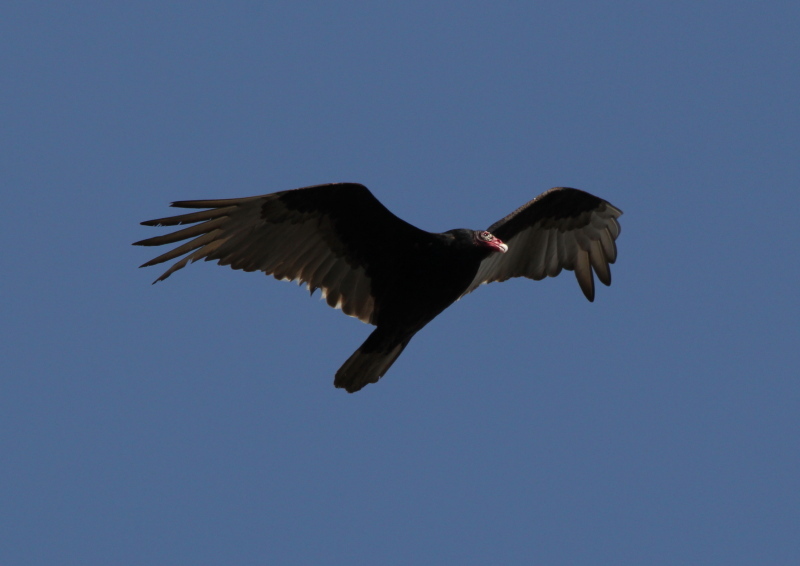 Other than a flyby from a turkey vulture…. …I have no other photos from the channel to add here. With warmer weather, and increased boat traffic, the channel won’t be the birding hotspot that it has been this winter until next fall. But, I’ll probably stop now and then, as you never know what you will find there. My next stop was the Muskegon Lake Nature Preserve, a small area on the northeast corner of Muskegon Lake, where the north branch of the Muskegon River enters the lake. 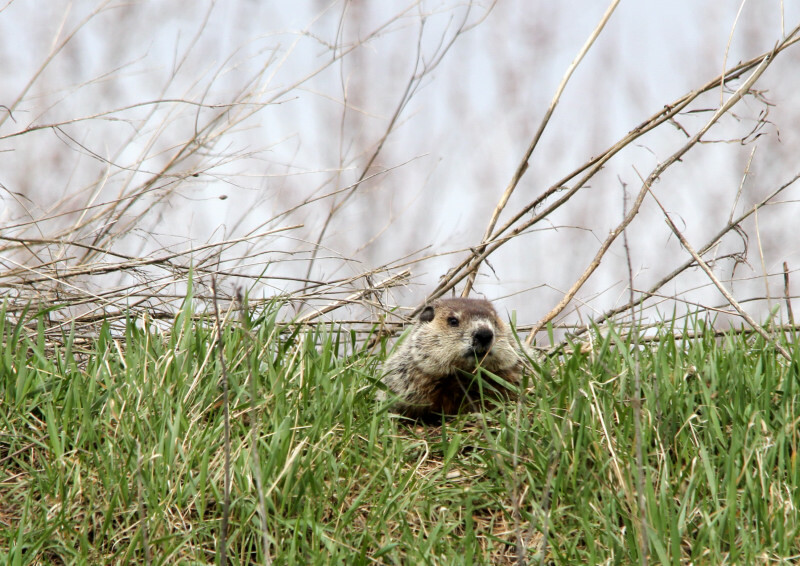 It’s a marshy area, and it may exemplify how a small parcel of land in the right hands can become a nice little touch of nature in a developed area. The preserve is tucked in between a major highway to the east, and a condominium/marina to the west. 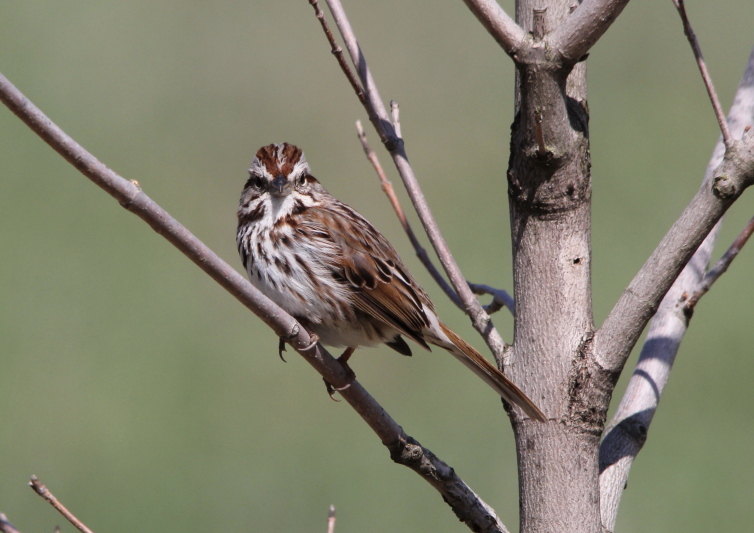 The Muskegon Environmental Research & Education Society has done a great job of building a series of boardwalks and observation towers there, and the preserve serves not only as a home to many species of birds, but also as a resting area for birds during migration. I’ve stopped there once or twice before, and I think that I have mentioned it previously. 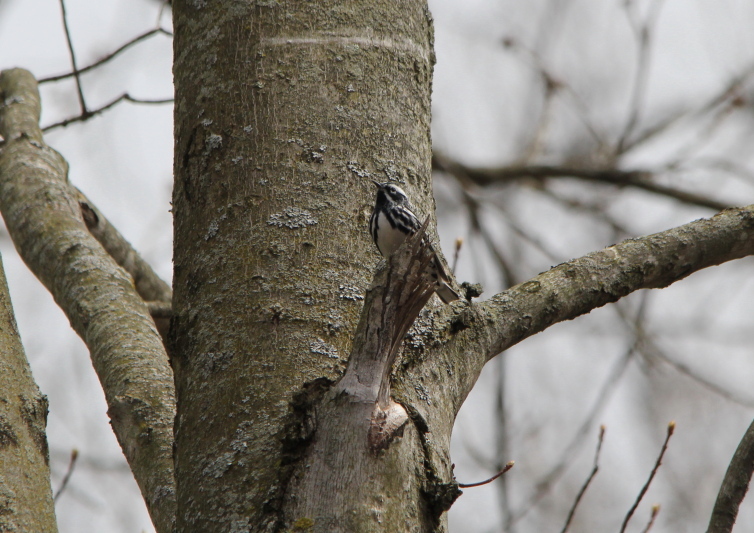 Anyway, the place was filled with birds on Sunday, both residents and migrants. 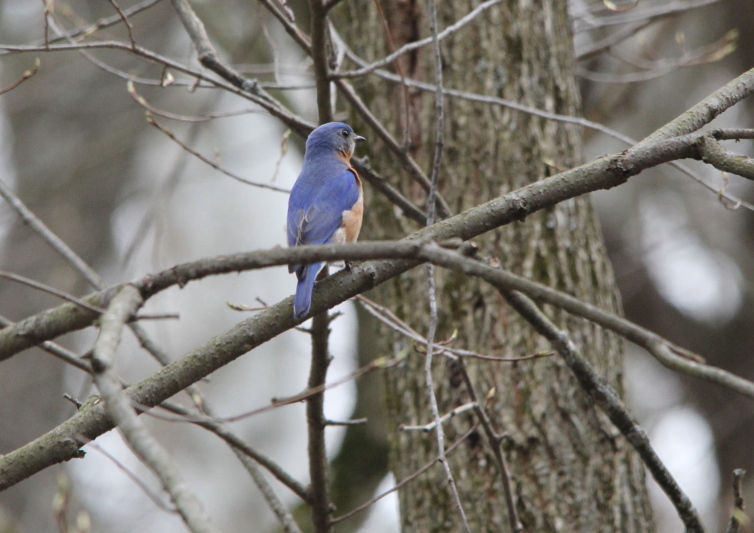 The birding started before I had crossed the footbridge from the parking lot into the preserve proper. 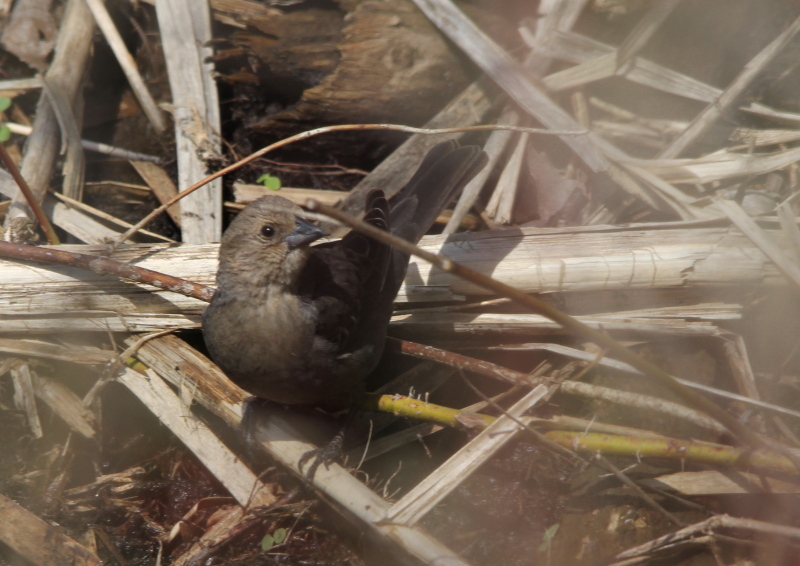 These are not great photos, but I saw this brown bird under the footbridge. 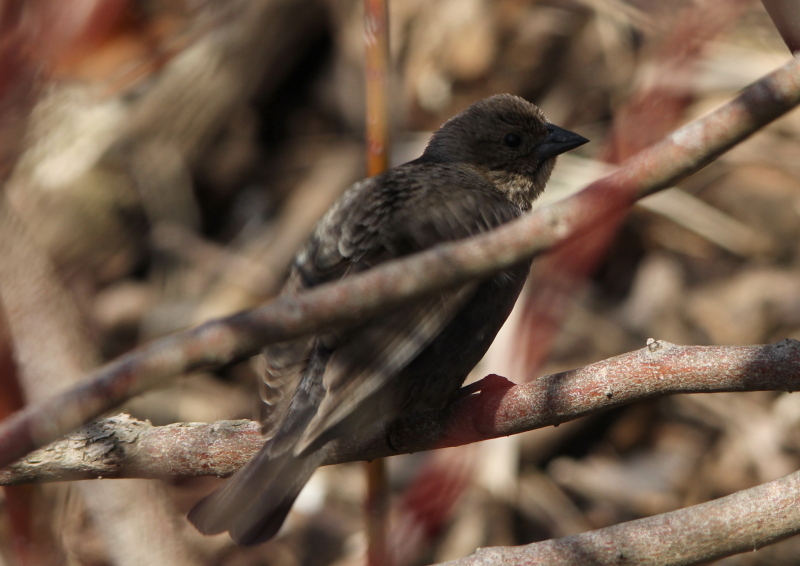 It looks similar to a female cowbird, but not exactly, and it didn’t behave like a cowbird at all. 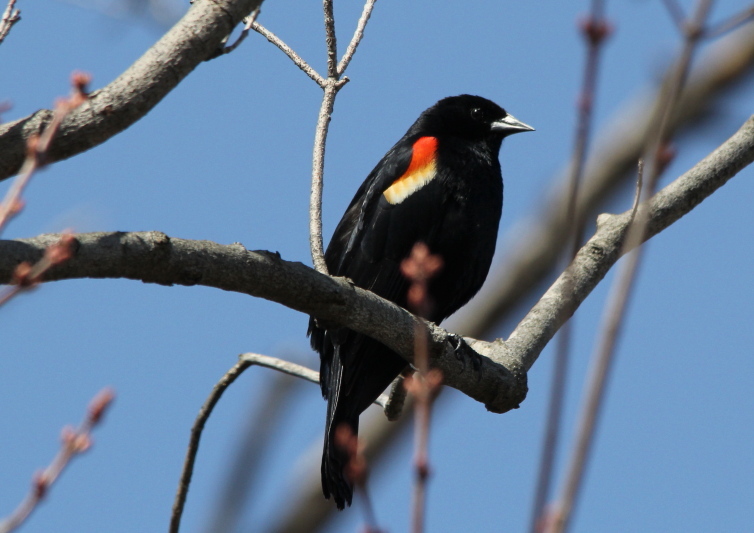 I say that it didn’t behave like a cowbird, for one thing, it was by itself, and cowbirds typically are found in flocks. 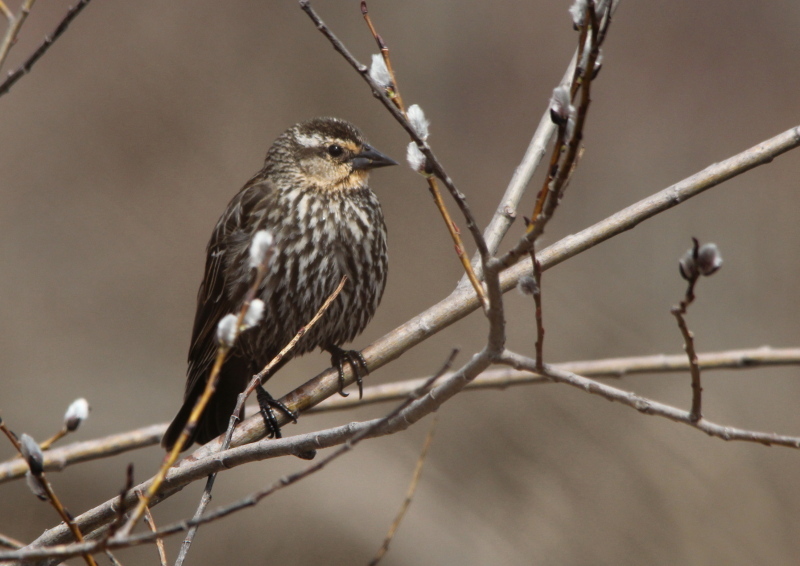 It was secretive, staying in the thick brush, while cowbirds generally prefer open fields. 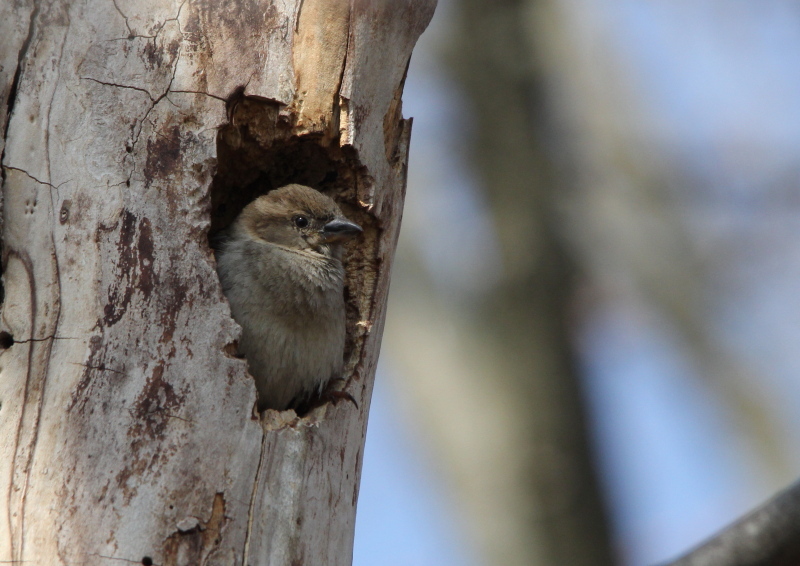 It never made a sound, and cowbirds are often very vocal. 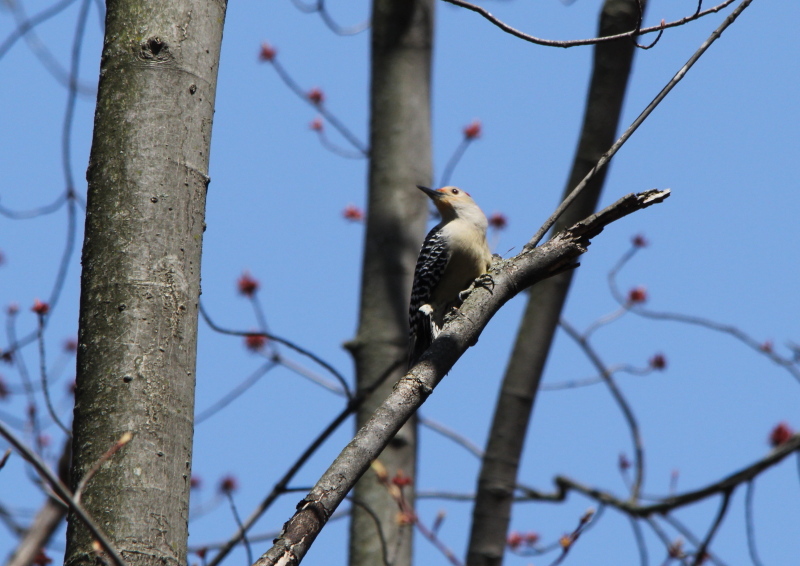 I’m not sure what it was, probably a cowbird looking for a nest of another species of bird in which to lay an egg. 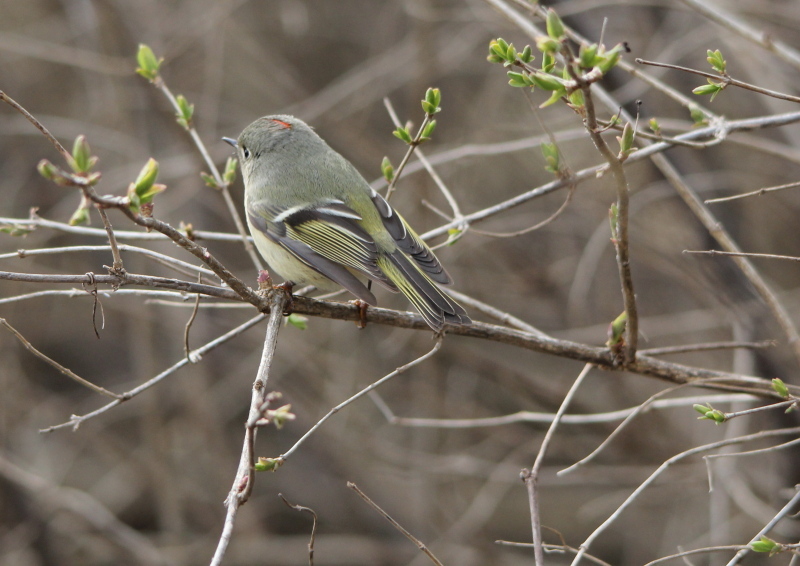 There were hundreds of ruby-crowned kinglets flitting around. They kept me quite busy trying to keep up with them, and also avoiding them. 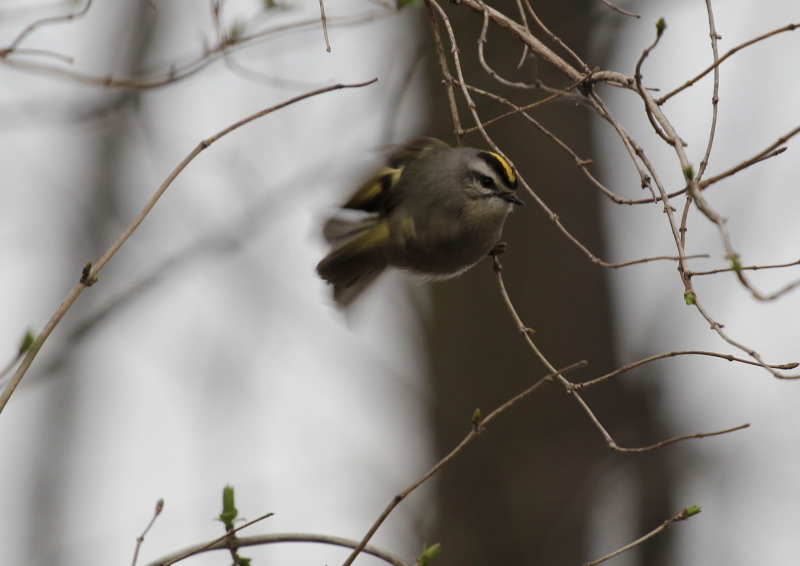 I had one in the viewfinder, and just as I was about to click the shutter, the kinglet flew straight at the camera lens. They may be tiny little birds, but seen through a 500 mm lens at less than 5 feet, they can appear quite large when headed straight at you. A couple of others almost touched me as they went past me. Swinging the Sigma lens around getting the photos that I did started to wear me out. 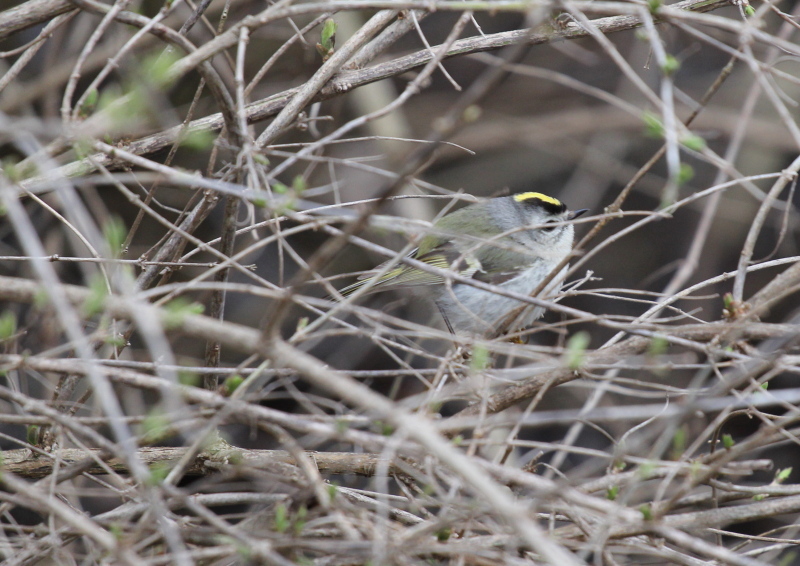 The kinglets are far from the only birds that were there. Somewhere in this timeframe, two things happened that negatively affected my photos. One, a layer of heavy cloud cover moved in. And two, I either accidentally bumped, or more likely forgot to reset the exposure compensation on my camera so that it was set to -1/3 compensation, at exactly the wrong time with the clouds. Being a complete idiot, I didn’t notice that until much later. 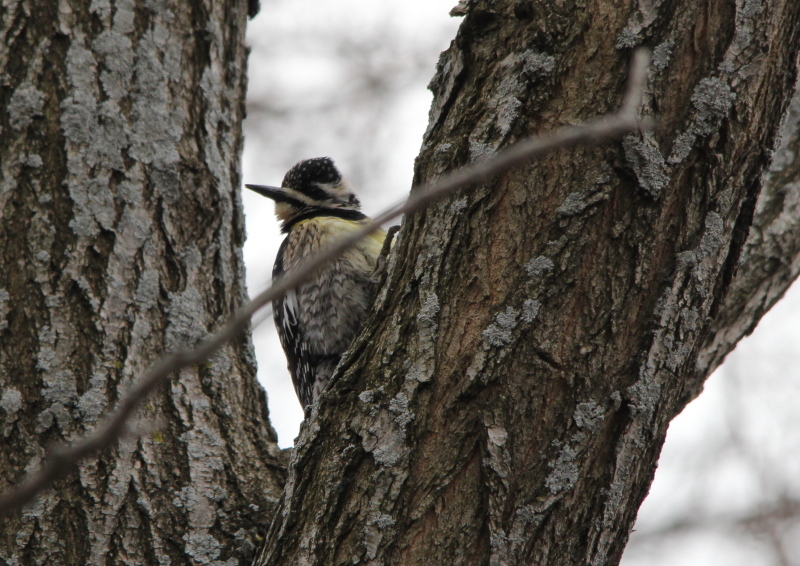 But, in spite of that, I got fair photos of a yellow-bellied sapsucker at work drilling holes in the bark of trees. Then, a rather strange thing happened, maybe it isn’t strange, maybe it’s just something I’ve never seen before. 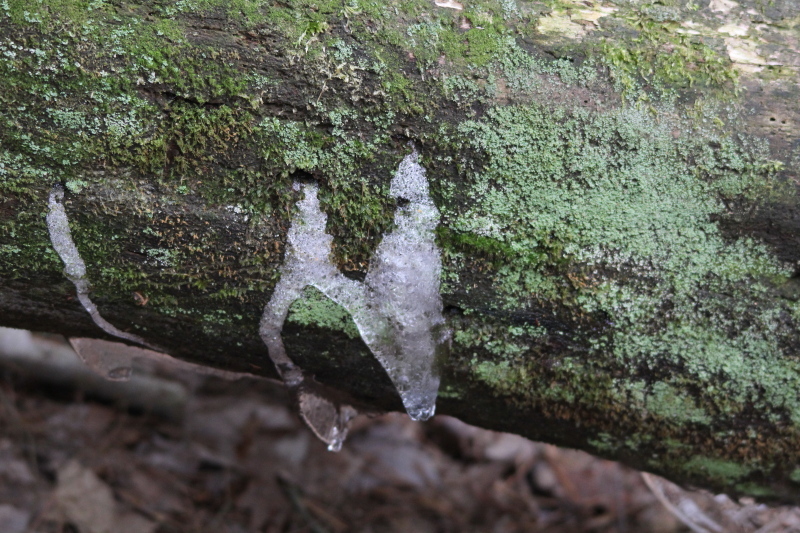 A couple of chickadees tried to drink the sap oozing from the holes drilled by the sapsucker. 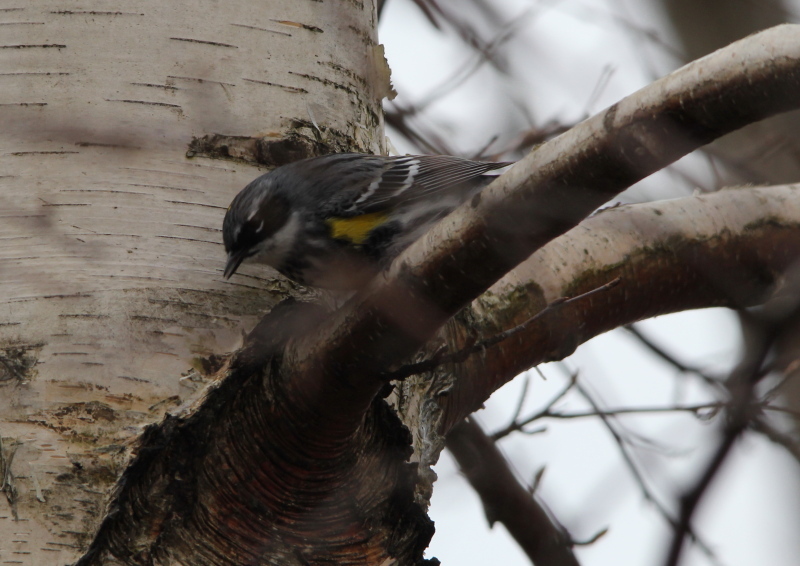 But, every time the chickadees got close to the sap, a yellow rumped warbler would drive the chickadees off, and drink the sap itself. 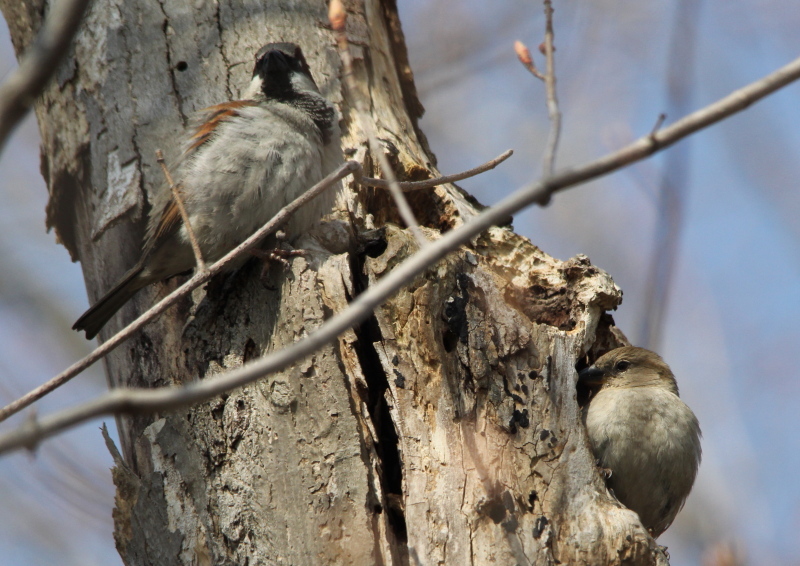 Getting shots of the small birds fighting over the sap was impossible with the Sigma 150-500, but that didn’t stop my from trying. However, I am not going to post photos of greyish blurs streaking across the frames of my photos. 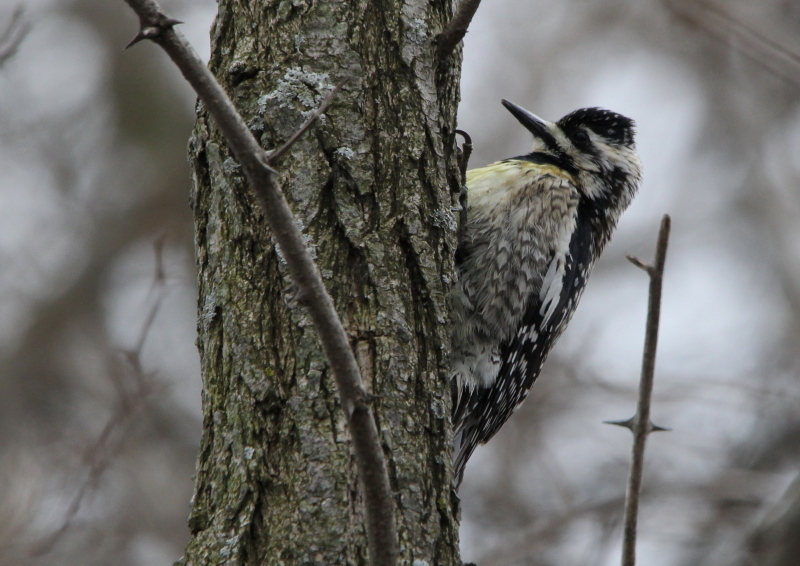 I knew that some other species of birds would often feed on both the sap, and any insects attracted to the sap, where sapsuckers drill through the bark of trees. 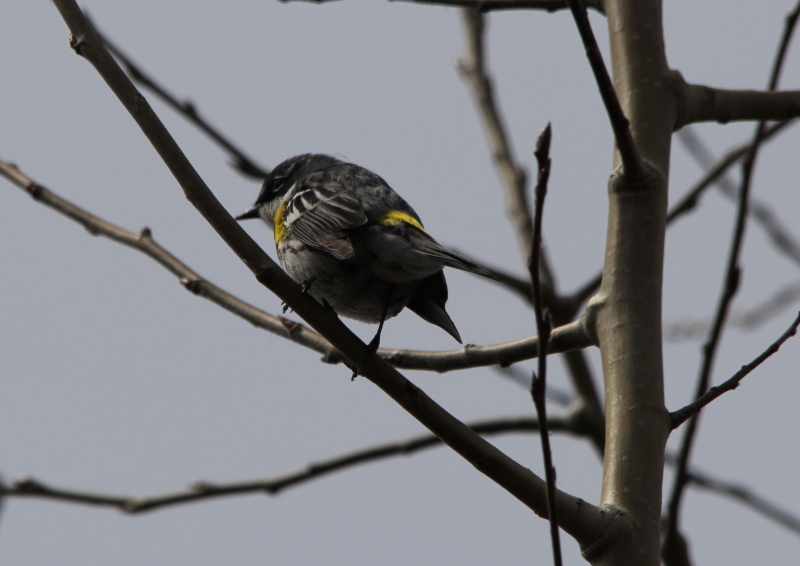 But I didn’t know warblers were one of them, and I didn’t know that one would be belligerent about it. 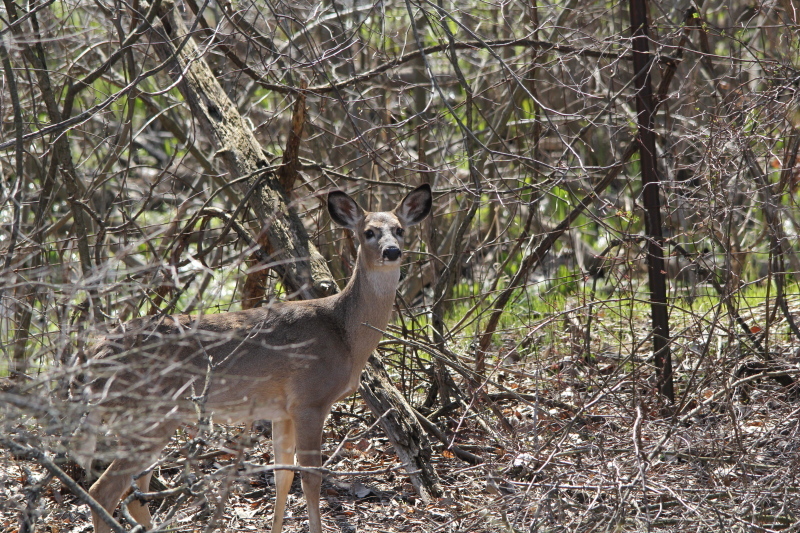 That was near the end of my first lap around the Muskegon Lake Nature Preserve, I stopped off at my Subaru, had a drink and a snack, and went back around the opposite way. 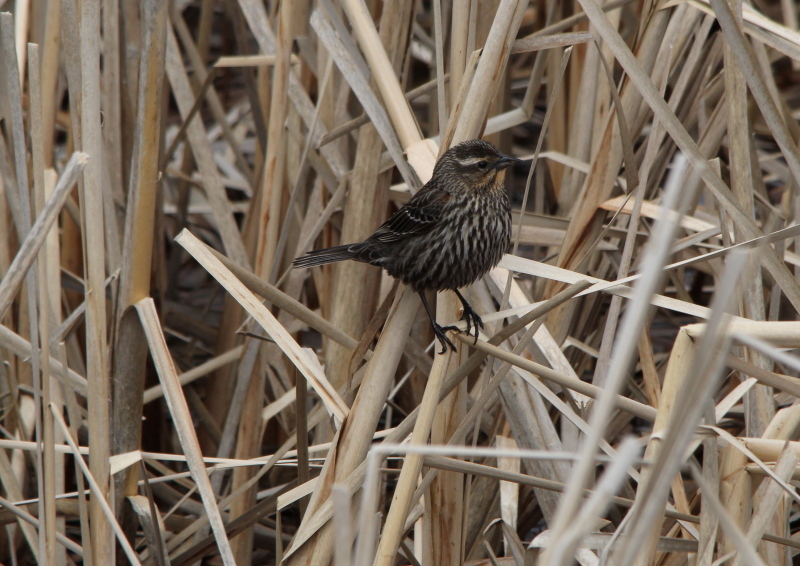 I got a few more (actually many more) photos of the kinglets, yellow rumped warblers, and female red-winged blackbirds. 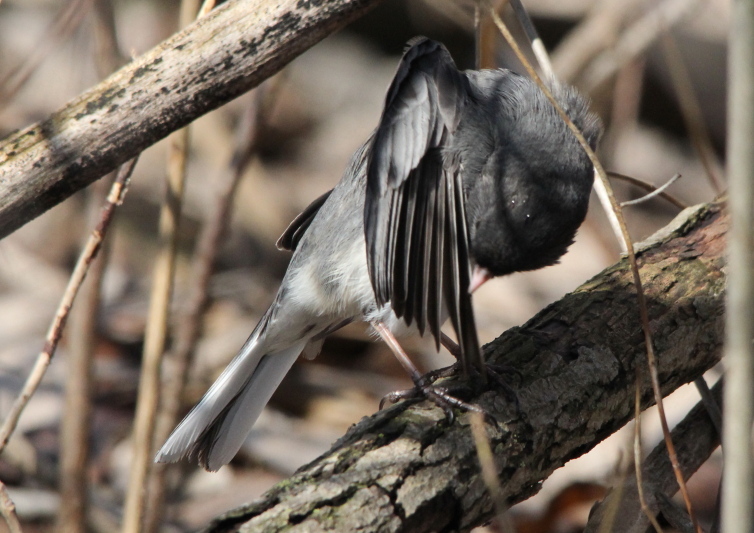 Even though Muskegon Lake Nature Preserve isn’t very large, two laps around it shooting small birds had left me arm weary from all the four pound arm curls I did while hoisting the Sigma lens up to shoot the photos. I took nearly 400 for the day, and of course missed many times that amount as the birds would move before I could get a shot. 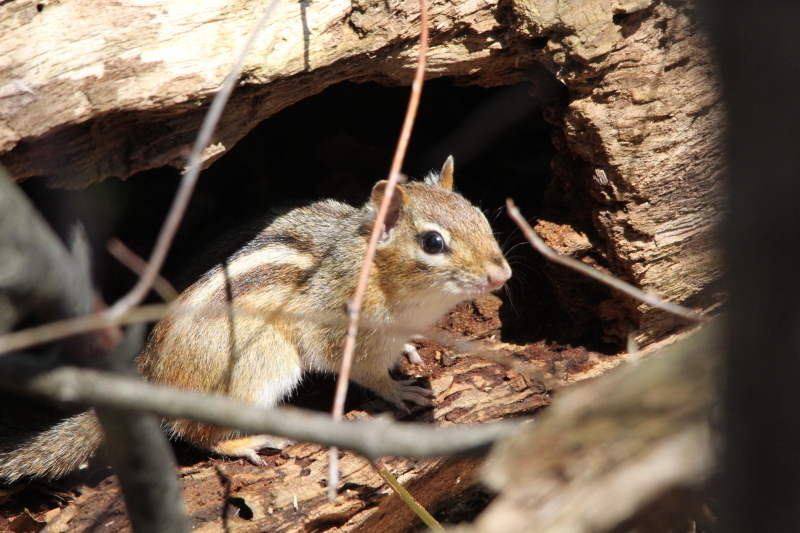 But, I wasn’t done yet, I headed to the Snug Harbor portion of Muskegon State Park to see if there was anything there worth photographing. 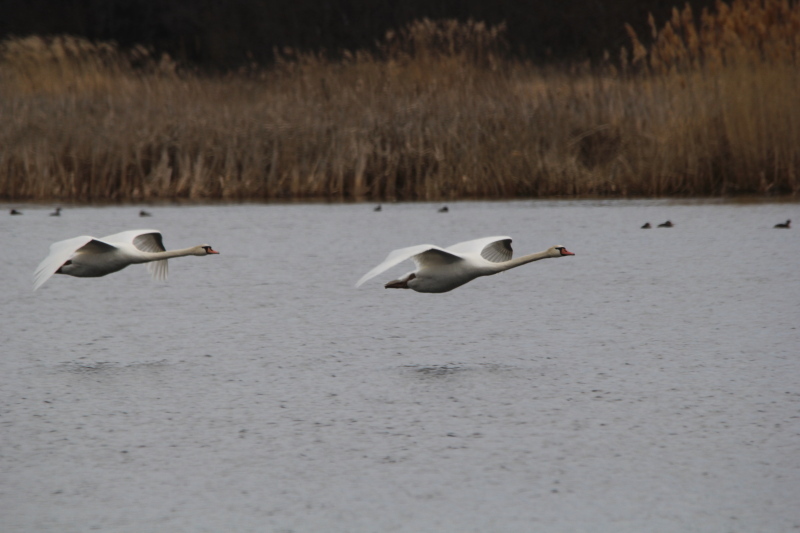 Just a pair of mute swans in flight. There were a few other ducks in around as you can see in the background, but not many, and not close enough for a photo. 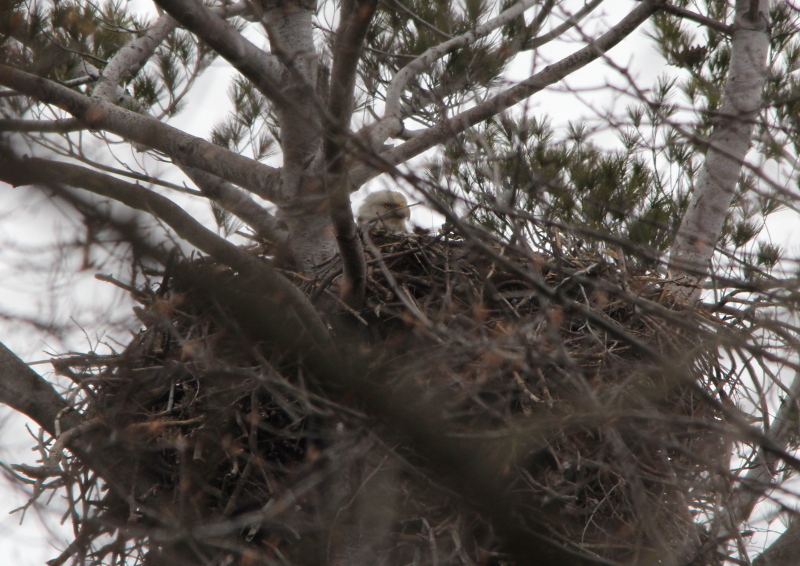 That was OK, as my real reason for stopping there was to check to see if the eagles were nesting, they were! 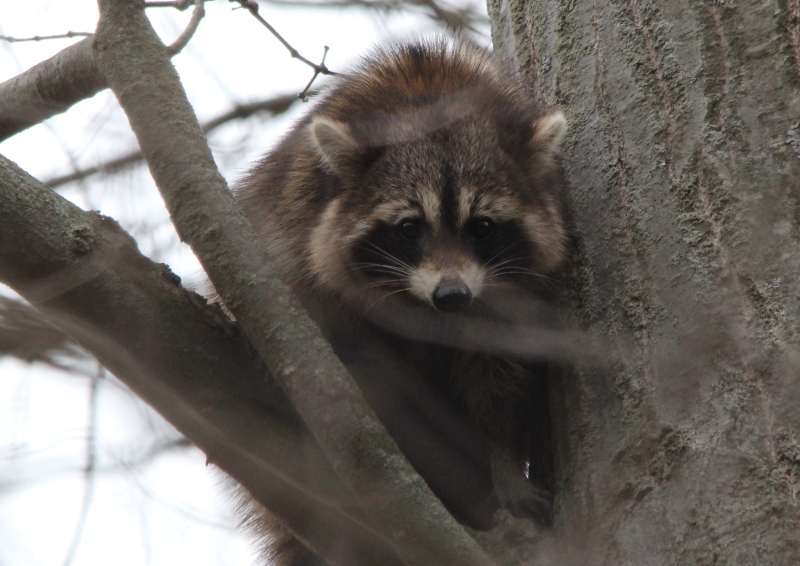 As I was checking the nest to see if the female was there, I saw this very brave raccoon in a tree quite close to the eagle’s nest. Since raccoons sometimes raid the nests of birds to eat the eggs, and since eagles are very fierce in defending their nest, I’m surprised that the raccoon wasn’t chased out of the area by the eagles. It’s hard to get a good shot of the eagle on her nest, as they chose a very tall tree on top of one of the larger hills in the area. 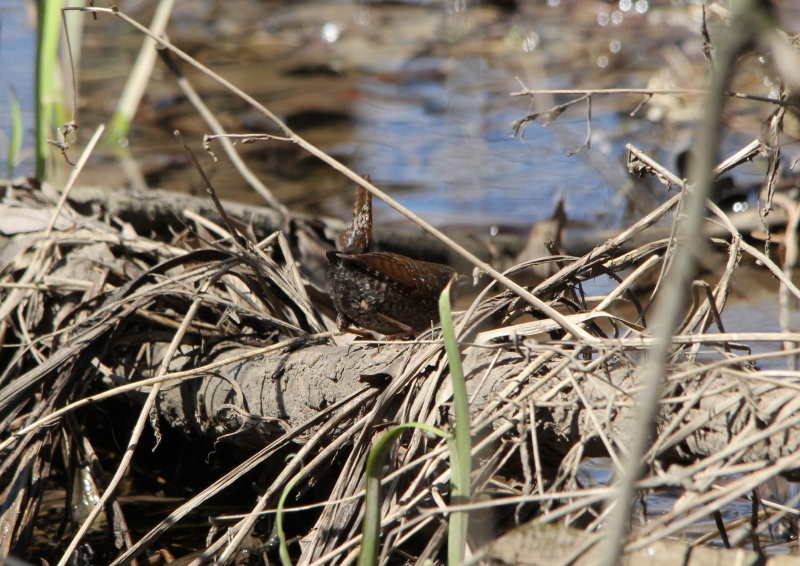 But, I’ll throw in one photo, if you look closely, you can see the female’s head. 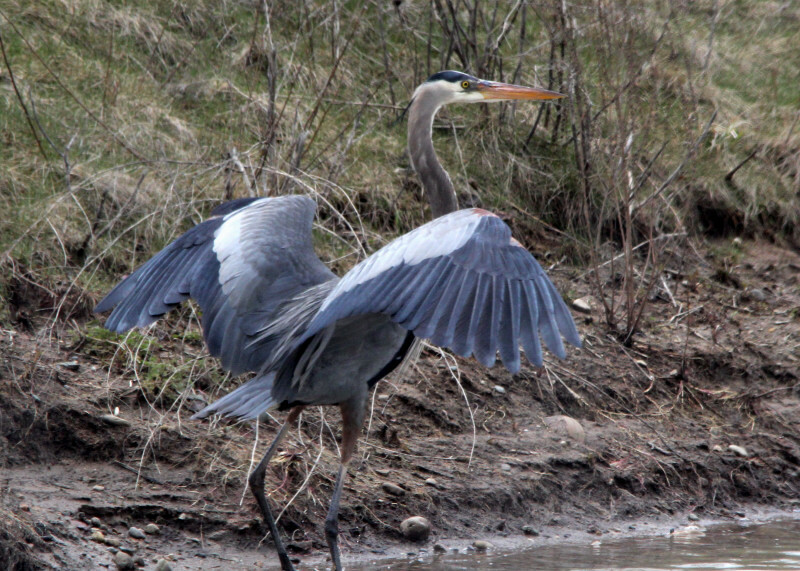 I stood there for about ten minutes or so, hoping the male would arrive with a meal for his mate. That’s about as long as I like to hang out near the nest, although I can tell that a few people stick around longer, and it doesn’t seem to bother the eagles. This is the fourth year that I know of that they have used this nest, and they attract a crowd at times. 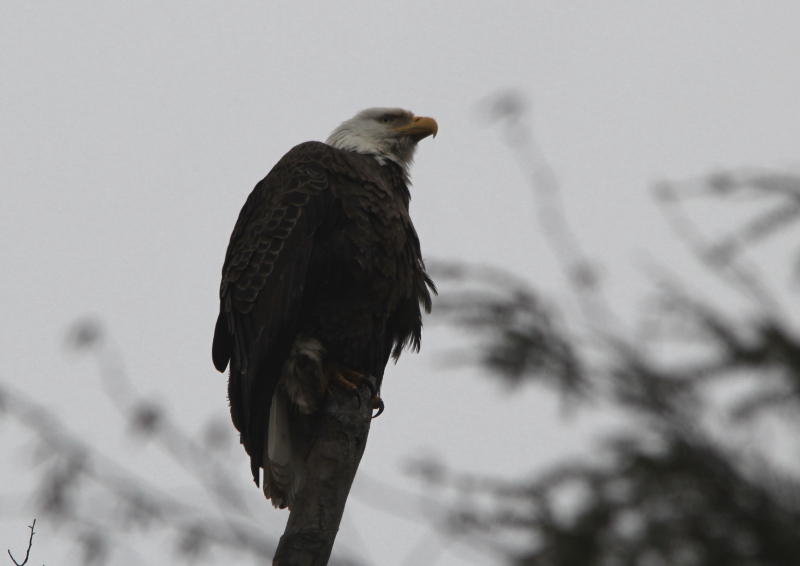 Anyway, I was standing with my back to the nest, explaining that eagles mate for life and use the same nest every year, when the young hatch, and so on, when the male flew up. 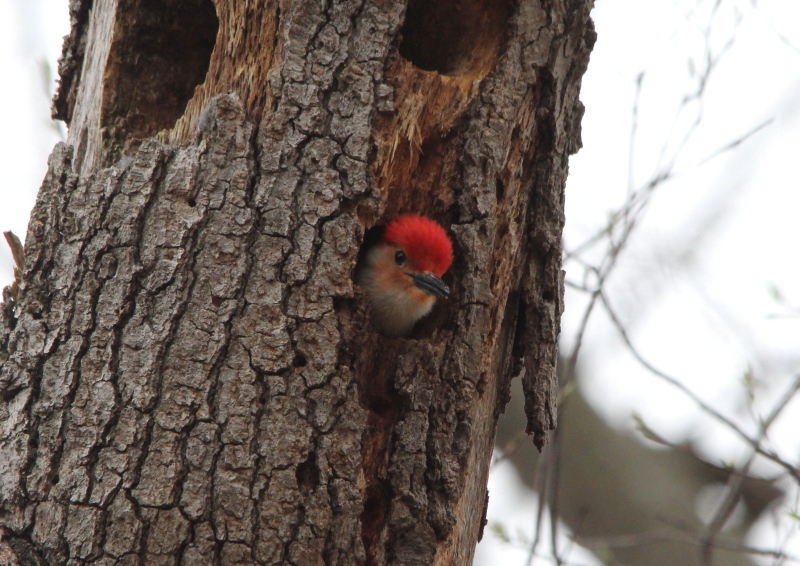 I didn’t see if he had brought supper or not, by the time I turned around to see him, he had perched near the nest. With a little more light, that would have been a great shot, but it was getting late in the day. 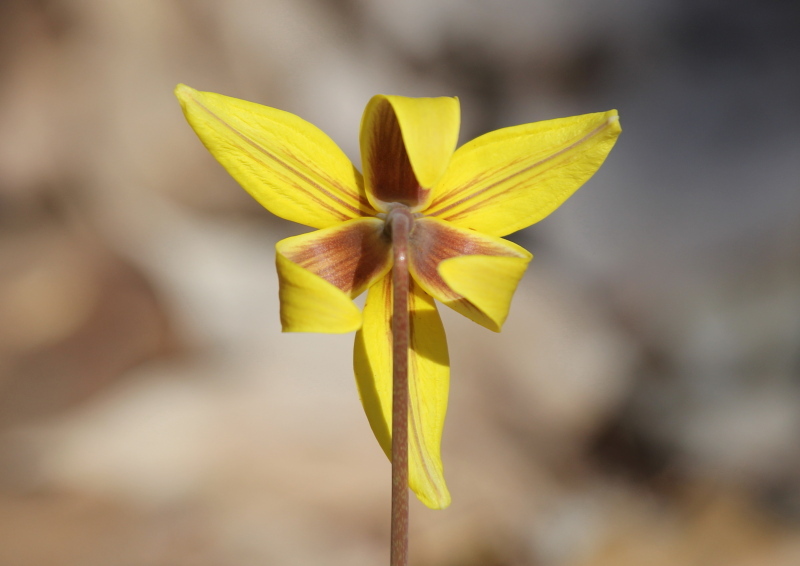 I still wasn’t done, I walked back to the Lost Lake area to see if I could find any wildflowers, as the Lost Lake area is known for marsh wildflowers, but it’s still too early in the year. All I found was a pair of mallards and a pair of pie-billed grebes, here’s one of the grebes, more for the reflections than the grebe itself. 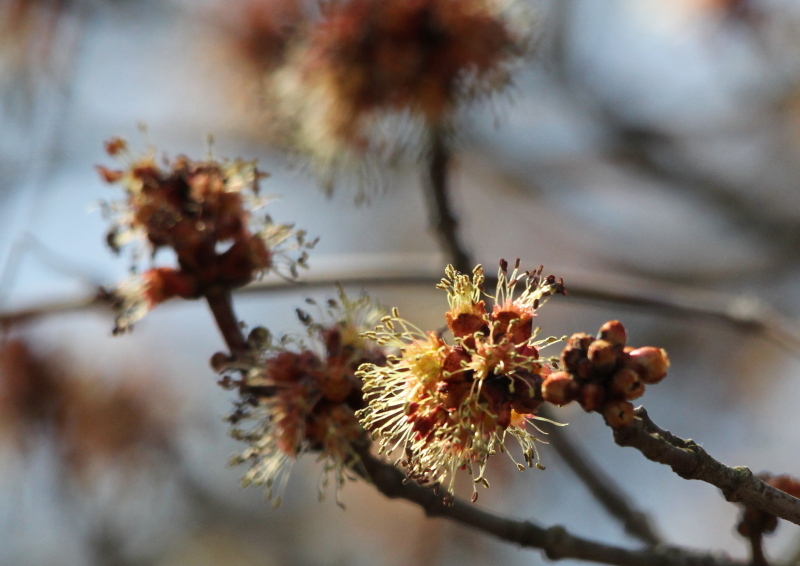 On my way back, I gave the Image Stabilization of the Sigma lens and the Canon 60 D body a real test. That was shot at 500 mm, a shutter speed of 1/200 of a second, and ISO 1600. 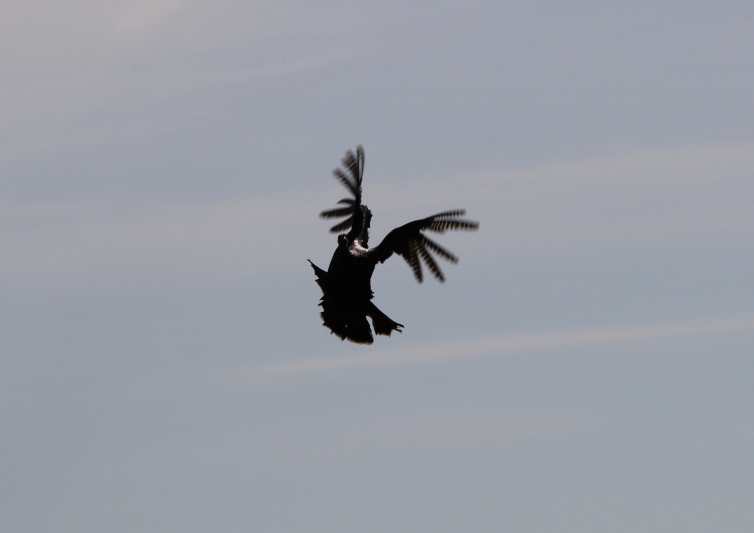 The photo is hardly spectacular, but I think the results are pretty darned good given the shutter speed and ISO. And, by the time I took that shot, my arms and shoulders ached badly from having carried and used that lens for most of the day. The photos that it produces are so good, I have a hard time convincing myself to switch to one of my other lenses unless the subject demands a shorter lens. I am one happy camper! By then, the clouds were so thick that it seemed much later in the day than 6 PM, and I had hit 5 areas in total, and shot nearly 400 photos, so I headed home. 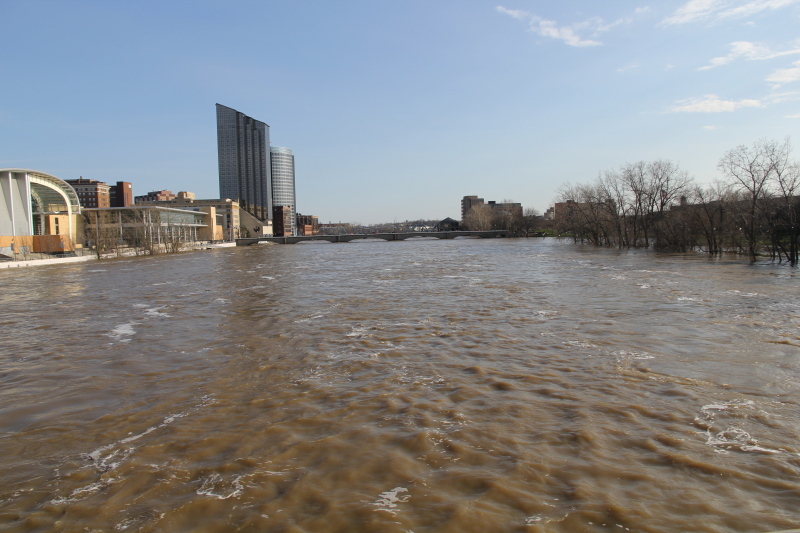 My hometown of Grand Rapids, Michigan is experiencing record flooding right now, due to heavy rainfall this month. This is from a local meteorologist’s blog about how much rain we’ve had. 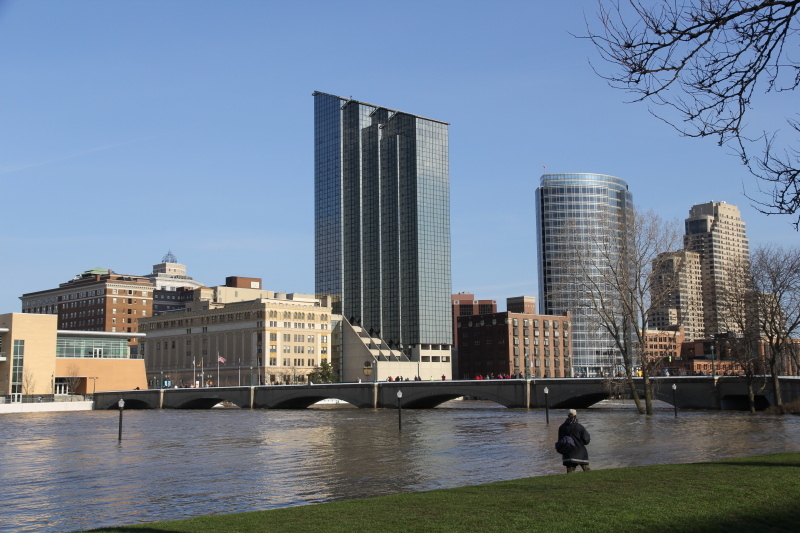 So on my way back from a day spent chasing birds in Muskegon, Michigan, I stopped off on my way home and shot a few photos of downtown Grand Rapids. This also gave me a chance to try out my new EF S 15-85 mm lens. That’s the Sixth Street dam under all that water. This is what it looks like normally. 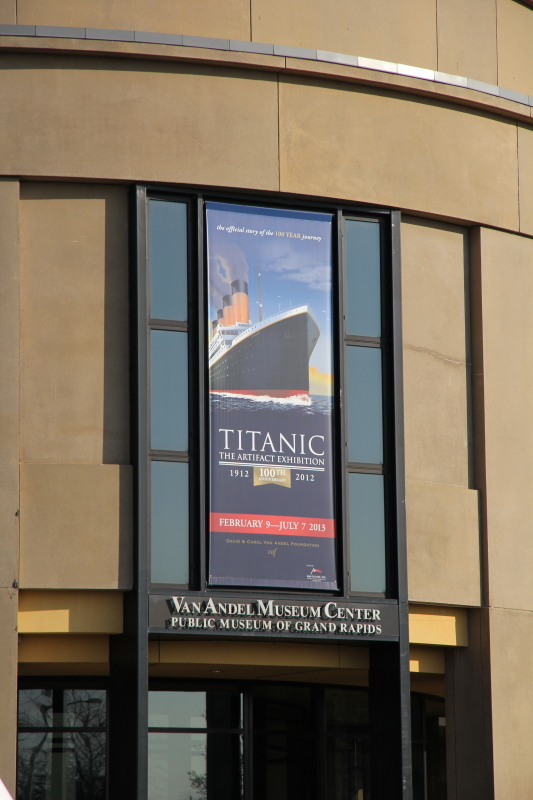 Are we going the way of the Titanic? 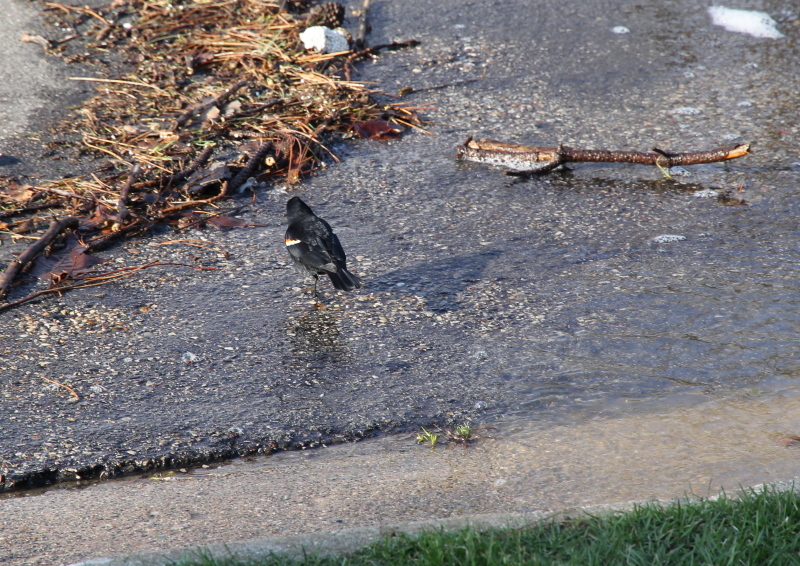 The river crested today, and is just starting to fall, good news for every one living near the river. Several of the Hotels and condo buildings downtown had to be evacuated, the building that my friend Mike lives in is one of them. 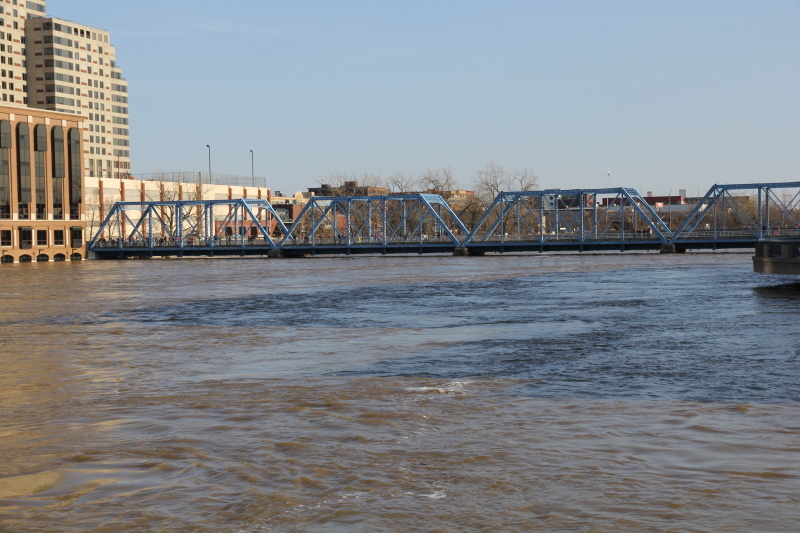 The good news is that the river is going down, the bad news is that it may be a week or more before the damage is repaired, and people will be able to return to their homes. Mike is lucky, he lives on the 23rd floor, so his belongings are high and dry, not so for many other people who will return to homes filled with slimy, stinky river mud. I started this post on a slightly different topic, but then began adding some facts about the State of Michigan, where I live. Because of questions and comments that I’ve gotten over the last few years I’ve been doing this blog, I thought it would be a good idea to do a post about this great state. I am going to start with a map and some facts from Wikipedia, the online encyclopedia. Michigan is a state located in the Great Lakes region of the Midwestern United States. The name Michigan is the French form of the Ojibwa word mishigamaa, meaning “large water” or “large lake”. Michigan is the 9th most populous of the 50 United States, with the 11th most extensive total area. Its capital is Lansing, and the largest city is Detroit. Michigan was admitted into the Union on January 26, 1837, as the 26th state. 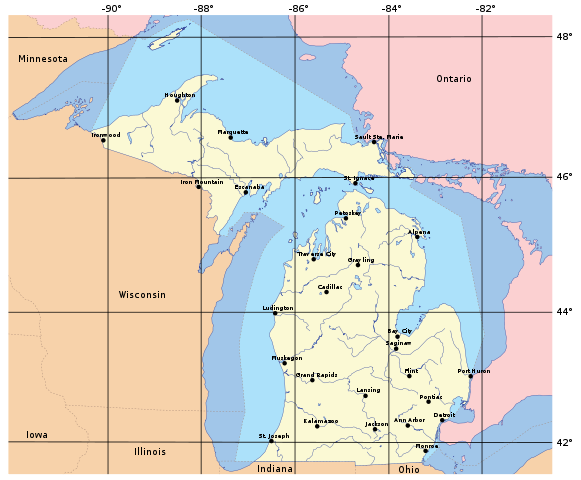 Michigan has the longest freshwater coastline of any political subdivision in the world, being bounded by four of the five Great Lakes, plus Lake Saint Clair. Michigan is one of the leading U.S. states for recreational boating. The state has 64,980 inland lakes and ponds. A person in the state is never more than six miles (9.7 km) from a natural water source or more than 85 miles (137 km) from a Great Lakes shoreline. It is the largest state by total area east of the Mississippi River. Michigan is the only state to consist of two peninsulas. The Lower Peninsula, to which the name Michigan was originally applied, is often noted to be shaped like a mitten. The Upper Peninsula (often referred to as “the U.P.”) is separated from the Lower Peninsula by the Straits of Mackinac, a five-mile (8 km) channel that joins Lake Huron to Lake Michigan. The two peninsulas are connected by the Mackinac Bridge. While sparsely populated, the Upper Peninsula is economically important due to its status as a tourist destination as well as its abundance of natural resources. The Great Lakes that border Michigan from east to west are Lake Erie, Lake Huron, Lake Michigan and Lake Superior. The heavily forested Upper Peninsula is relatively mountainous in the west. The Porcupine Mountains, which are part of one of the oldest mountain chains in the world, rise to an altitude of almost 2,000 feet (610 m) above sea level and form the watershed between the streams flowing into Lake Superior and Lake Michigan. The surface on either side of this range is rugged. 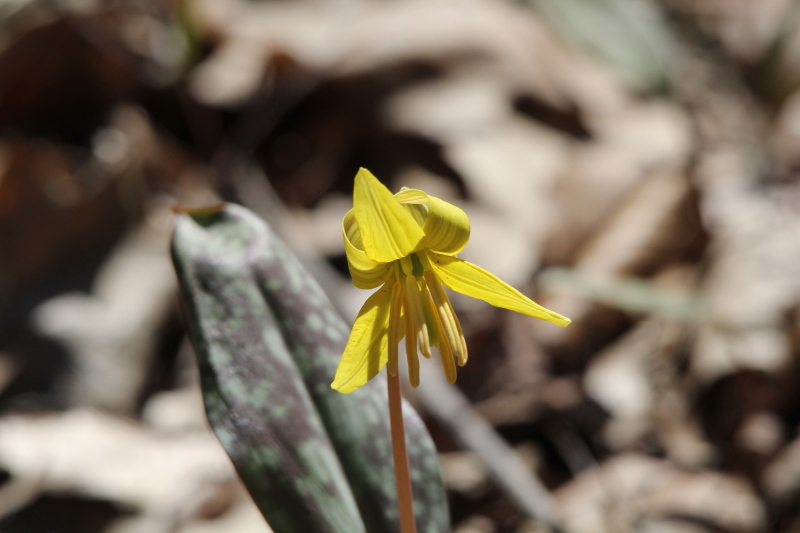 The state’s highest point, in the Huron Mountains northwest of Marquette, is Mount Arvon at 1,979 feet (603 m). The peninsula is as large as Connecticut, Delaware, Massachusetts, and Rhode Island combined but has fewer than 330,000 inhabitants. They are sometimes called “Yoopers” (from “U.P.’ers”), and their speech (the “Yooper dialect”) has been heavily influenced by the numerous Scandinavian and Canadian immigrants who settled the area during the lumbering and mining boom of the late 19th century. The Lower Peninsula is shaped like a mitten and many residents hold up a hand to depict where they are from. It is 277 miles (446 km) long from north to south and 195 miles (314 km) from east to west and occupies nearly two-thirds of the state’s land area. The surface of the peninsula is generally level, broken by conical hills and glacial moraines usually not more than a few hundred feet tall. It is divided by a low water divide running north and south. The larger portion of the state is on the west of this and gradually slopes toward Lake Michigan. 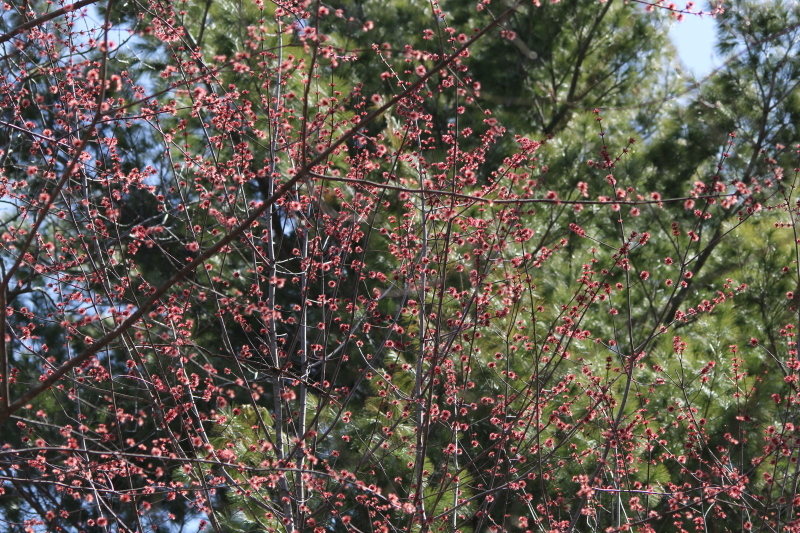 The highest point in the Lower Peninsula is either Briar Hill at 1,705 feet (520 m), or one of several points nearby in the vicinity of Cadillac. The lowest point is the surface of Lake Erie at 571 feet (174 m). Numerous lakes and marshes mark both peninsulas, and the coast is much indented. Keweenaw Bay, Whitefish Bay, and the Big and Little Bays De Noc are the principal indentations on the Upper Peninsula. The Grand and Little Traverse, Thunder, and Saginaw bays indent the Lower Peninsula. Michigan has the second longest shoreline of any state, 3,288 miles (5,292 km), including 1,056 miles (1,699 km) of island shoreline. The state has numerous large islands, the principal ones being the North Manitou and South Manitou, Beaver, and Fox groups in Lake Michigan; Isle Royale and Grande Isle in Lake Superior; Marquette, Bois Blanc, and Mackinac islands in Lake Huron; and Neebish, Sugar, and Drummond islands in St. Mary’s River. Michigan has about 150 lighthouses, the most of any U.S. state. The first lighthouses in Michigan were built between 1818 and 1822. They were built to project light at night and to serve as a landmark during the day to safely guide the passenger ships and freighters traveling the Great Lakes. 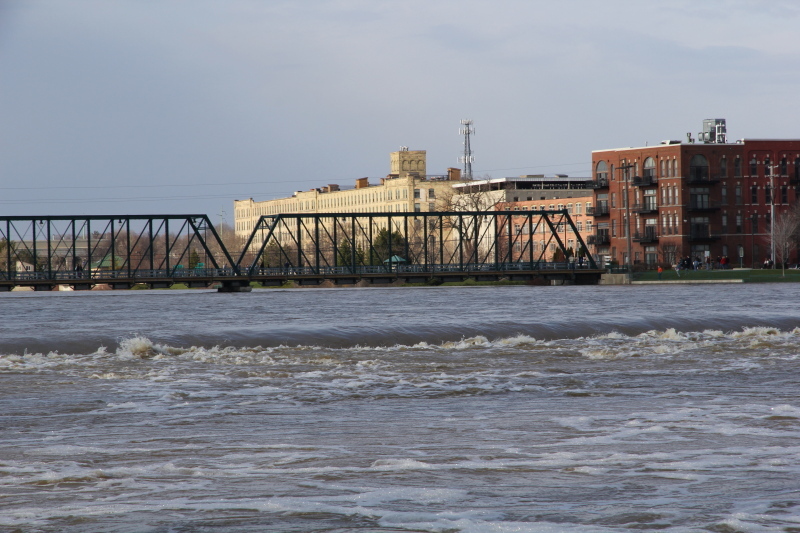 The state’s rivers are generally small, short and shallow, and few are navigable. 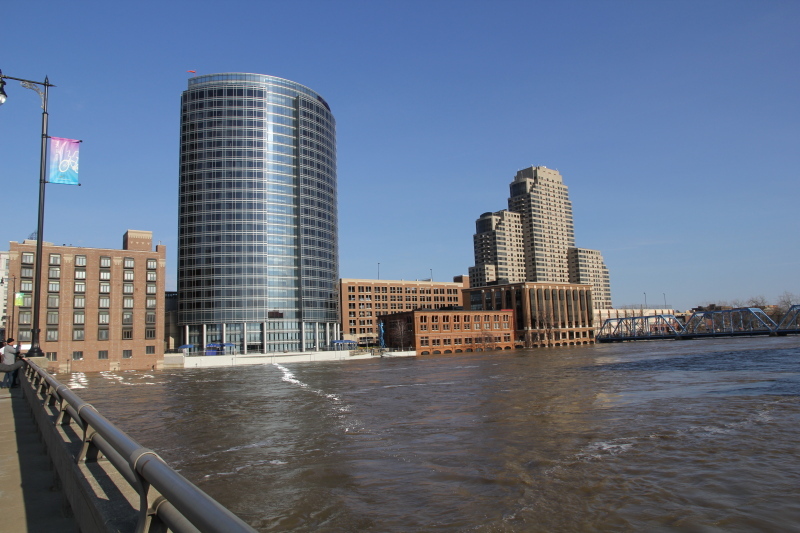 The principal ones include the Detroit River, St. Marys River, and St. Clair River which connect the Great Lakes; the Au Sable, Cheboygan, and Saginaw, which flow into Lake Huron; the Ontonagon, and Tahquamenon, which flow into Lake Superior; and the St. Joseph, Kalamazoo, Grand, Muskegon, Manistee, and Escanaba, which flow into Lake Michigan. The state has 11,037 inland lakes (totaling 1,305 square miles (3,380 km2) of inland water) in addition to 38,575 square miles (99,910 km2) of Great Lakes waters. No point in Michigan is more than six miles (10 km) from an inland lake or more than 85 miles (137 km) from one of the Great Lakes. 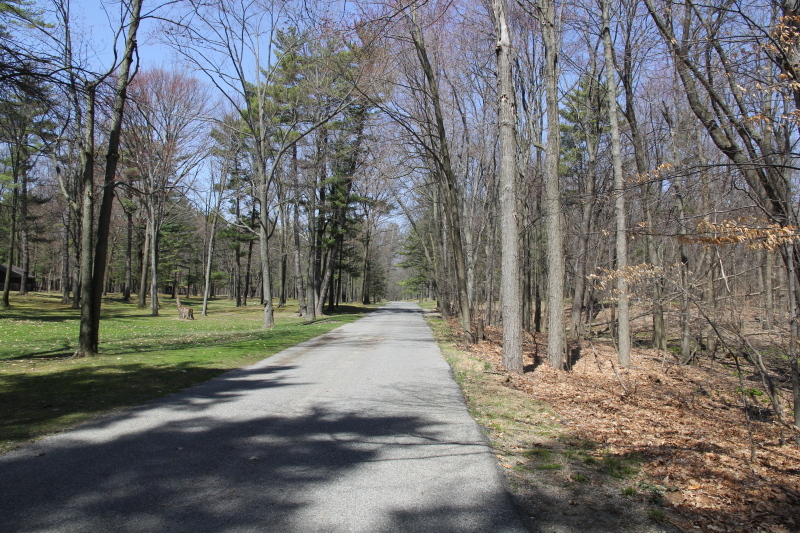 With 78 state parks, 19 state recreation areas, and 6 state forests, Michigan has the largest state park and state forest system of any state. 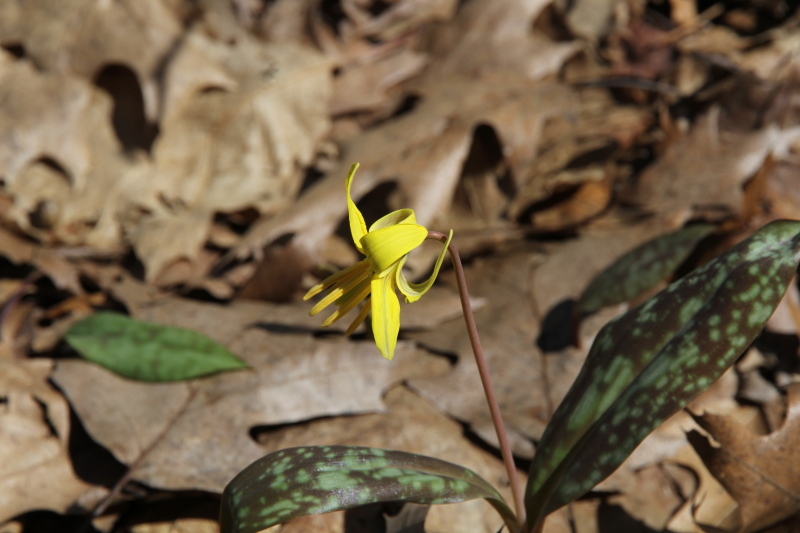 Michigan is fifty percent forest land, much of it quite remote. 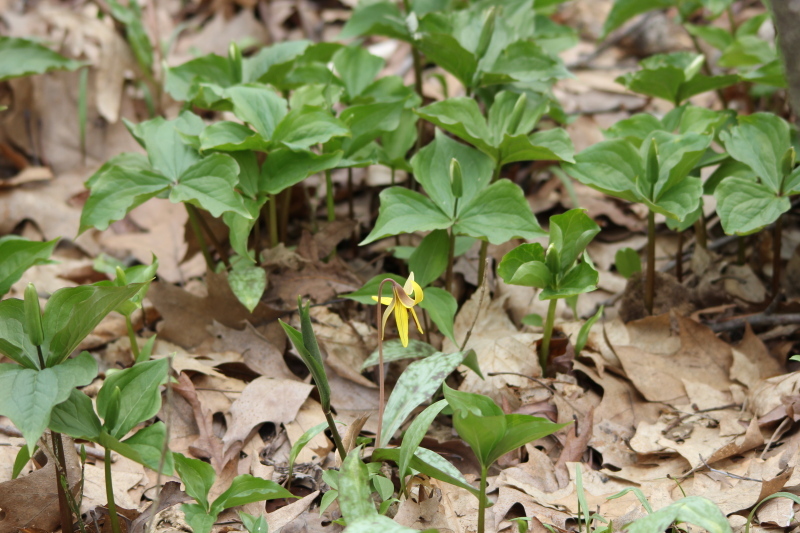 Michigan’s Department of Natural Resources manages the largest dedicated state forest system in the nation. 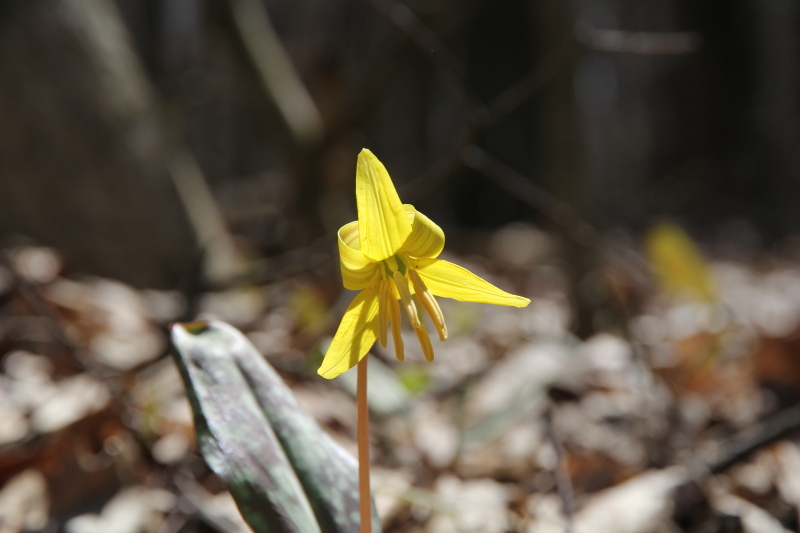 Public hiking and hunting access has also been secured in extensive commercial forests. 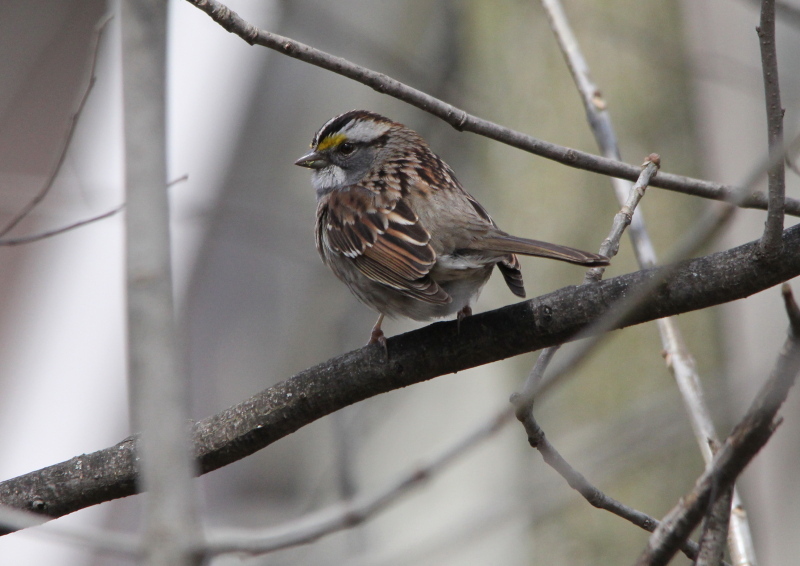 And now, a little about how the shape and geographical location come into play as far as birding. 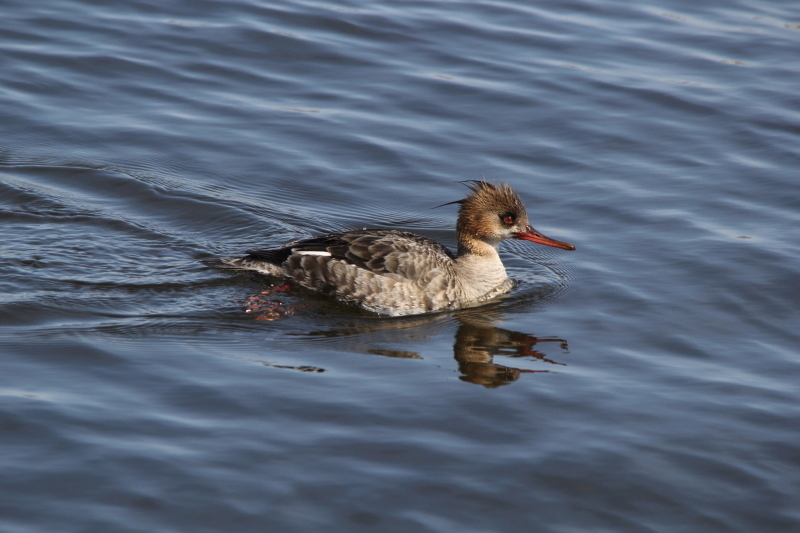 Because the Great Lakes are more like inland freshwater seas than lakes, they provide habitat for species of waterfowl that would only be seen along the east or west coast of America otherwise, not in the heart of the north American continent, where Michigan is. 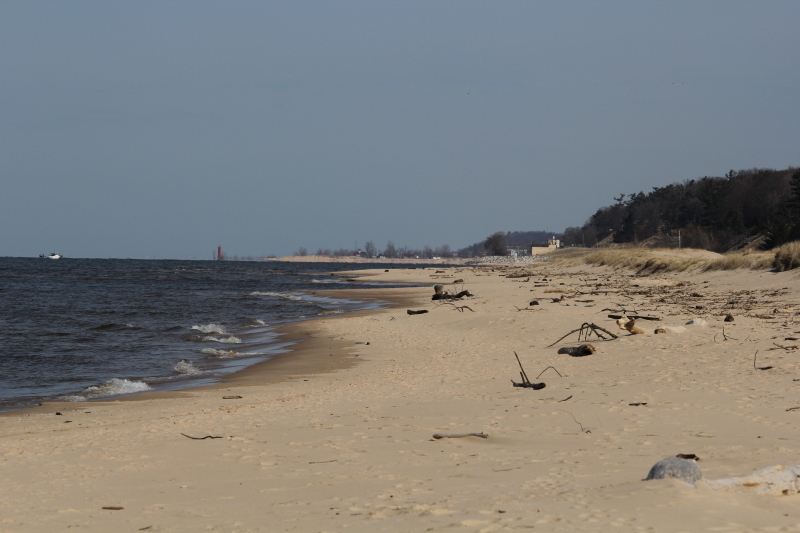 To give a little perspective, Lake Michigan is just over 300 miles long, and averages about 100 miles wide. It’s the Great Lake closest to me, the long, narrow lake to the west of Michigan. 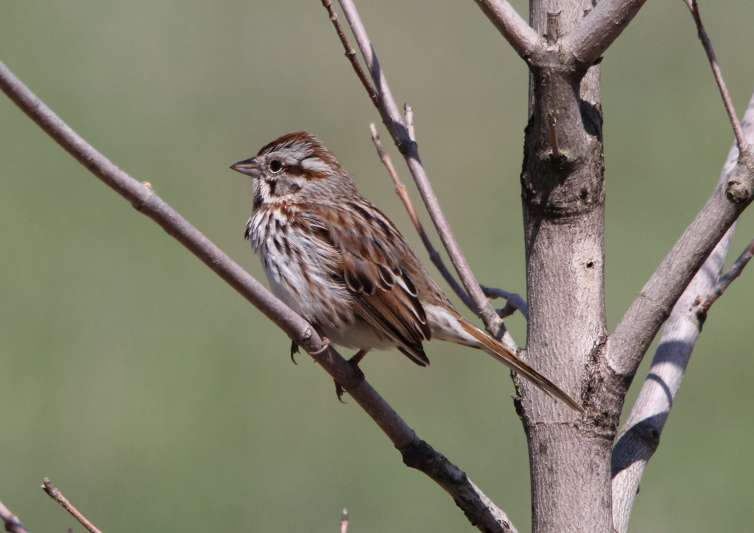 Because many smaller species of birds won’t migrate across the lengths of the Great Lakes, their migration routes take them through Michigan, and the shape of the state acts as a funnel of sorts, concentrating those birds in several small areas where they are able to cross shorter expanses of water. 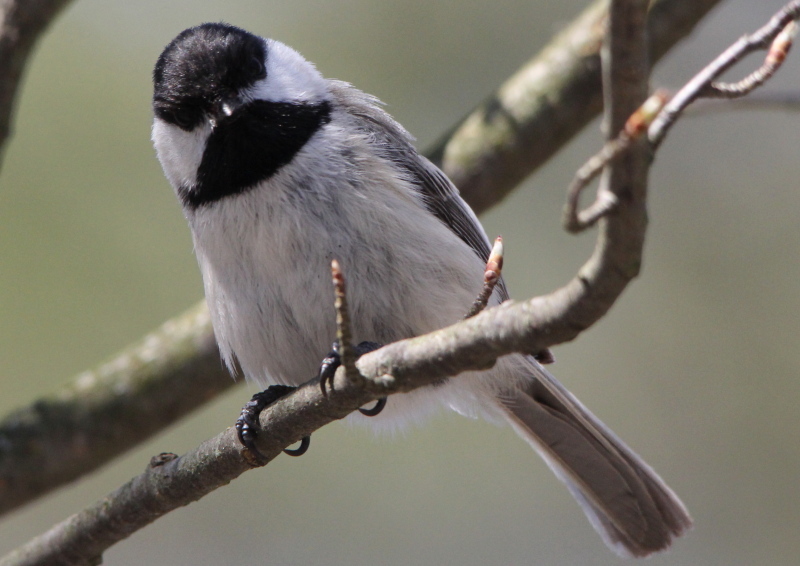 One of those places where birds congregate during migration is the Whitefish Point Bird Observatory, and here’s a blurb from their website that explains it better than I can. 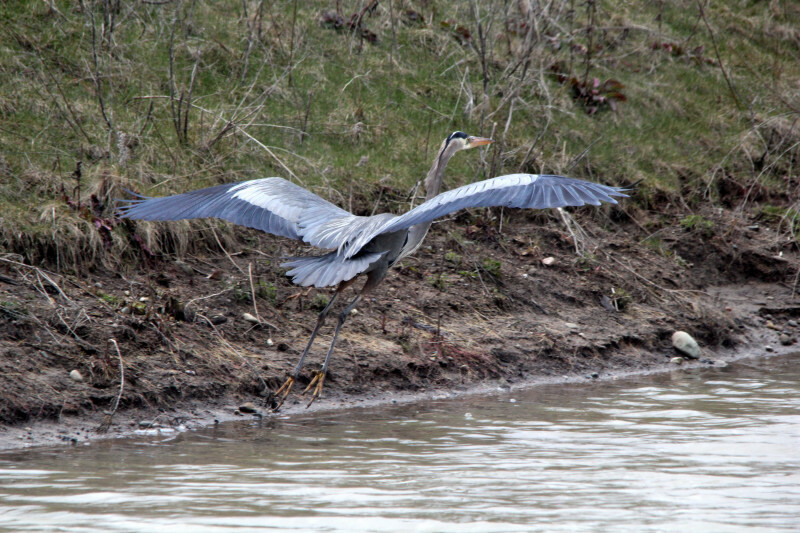 And because Michigan has a long history of being in the forefront of protecting wildlife, most of the concentration points along the bird migration routes are protected areas, and most of those are open to the public. There are a few spots that are considered to be so environmentally critical to wildlife that they are closed to the general public. Those are mostly islands in the Great Lakes, where human visitors could force tired birds that needed to rest before flying on to the next land mass to take flight before they are rested enough to make it to the next land. So there’s a quick overview of my home state. Doing this post points out something to me, that I need to retrace many of my earlier trips around the state to update my photo collection! And also to do more posts about Michigan, and our many attractions, both natural and man-made. Most of my photos of the scenic wonders of Michigan are in the form of slides, not much use for posting here. There have been times over the past few years when I thought about stopping at a particular spot to take photos, but I’ve stopped myself, telling myself that I had already been there and photographed those places. But in doing this post, I had the urge to use the photos from Wikipedia to illustrate this post, remembering how beautiful those places are. 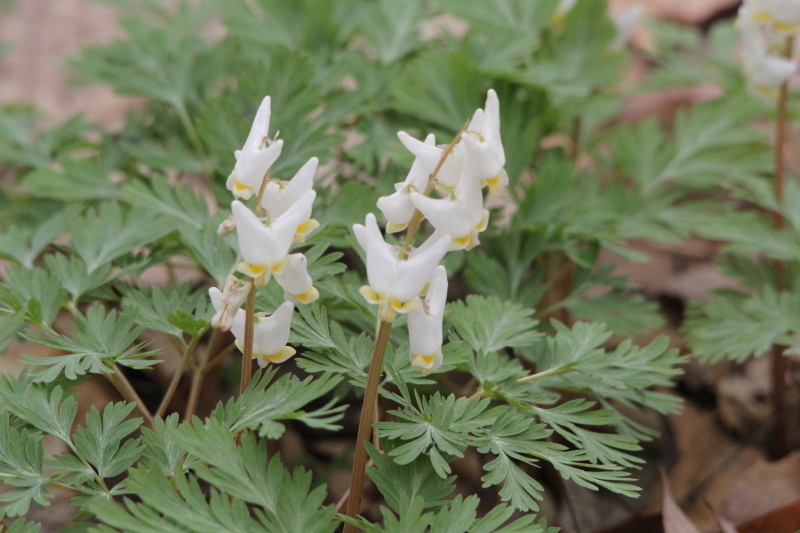 Hopefully, this will start another project for me, much more in line with my original intentions when I began this blog, highlighting many of Michigan’s great wonders. 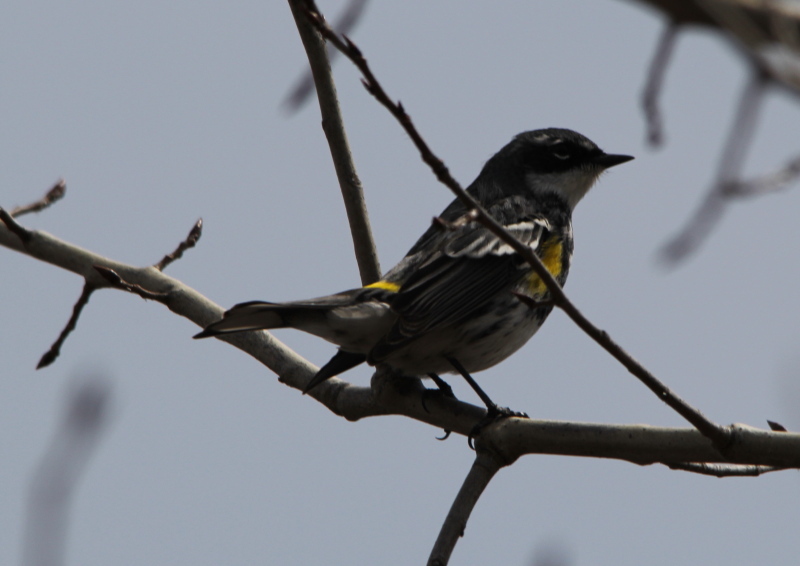 It will go well with the My Life List project that I am doing on the birds of Michigan. I’ll just have to stop and smell the wild roses! I’ve made it 1/4 of the way through the list of bird species that I am working from for My Photo Life List, all well and good. 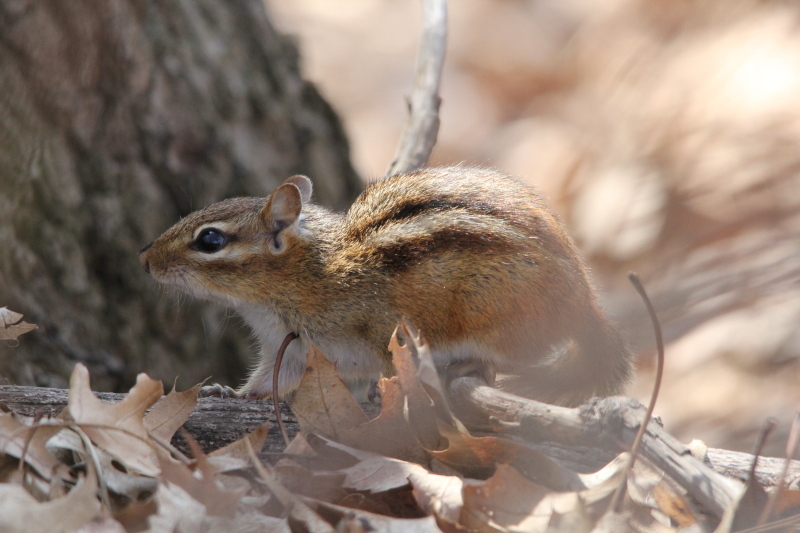 However, I am adding about one species a day as far as photos for posts in the future, just as I was finally nearing the end of my saved photos for the project. So, now what do I do? I don’t want to continue posting a species a day, I’d rather slow down and blog about other things. I still have photos of subjects other than birds that I shot last summer and fall that I thought that I would get around to posting long before this, but they were taken with my old, now dead, Nikon. I’m thinking of resurrecting the old “My Week” series that I was doing until last summer, I really liked keeping and having a journal of my daily walks, condensed into a weekly blog post. OK, I’m going to do it, it may be sparse at times, but I really liked doing that series. So, starting next Monday, that series will be revived, and posted on Saturdays. 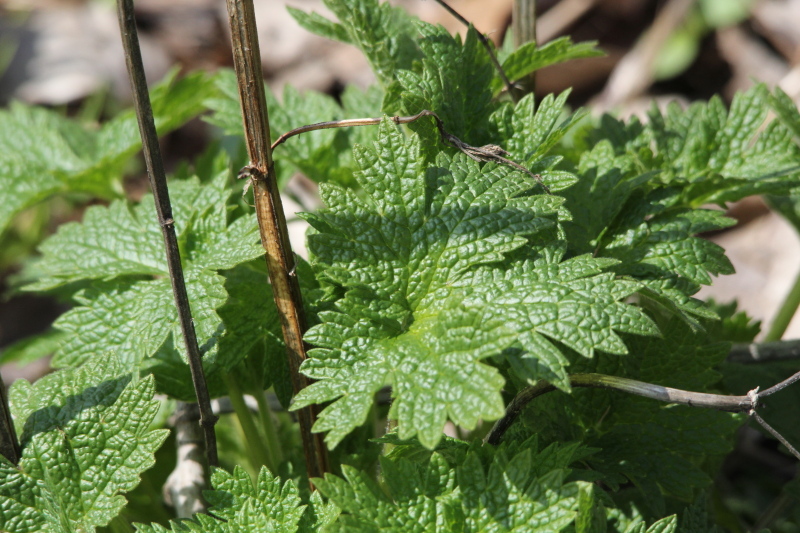 I changed my mind, this will be the first post in the revived My Week series. I am going to start a draft post for each of the new species that I have photographed this week, and post them at one per week, I haven’t picked a day for that yet. I am going to delete all those older photos I still have stored on my computer, some were good, but nothing special, and nothing that I won’t duplicate at higher quality with my new camera and lenses over time. If you remember, I posted a snippet from a local meteorologist that stated that the computer models were predicting some rain in every 6 hour period this week. Wrong! There were two nights when we got rain, heavy rain at times, compounding the flooding going on. But, it has cleared up nicely everyday this week at about the time that I go for my daily walk. In fact, this has been far and away the nicest week this spring up until today, which is Wednesday as I start this. Never trust a meteorologist and his computer models is the moral of this story, so far. We’ve received a lot of rain, but it hasn’t been nearly constant as predicted, which is a good thing. I am officially now an old fart! I bought a pair of suspenders this last weekend, and I have been wearing them this week. Why am I adding this, because I am darned tired of throwing good money away! I started taking my daily walks as a way of losing the weight that I had gained as an over the road truck driver. I have been losing that weight on a slow, steady basis ever since I started walking, and have now dropped 50+ pounds. As I have been losing the weight, I needed a new belt to fit my still large, but shrinking waistline. I did so just a couple of months ago, and last week, that almost new belt just fell apart on me. Come on, a belt is nothing more than a strip of leather with a buckle attached, and they charge $30 for one? That’s outrageous enough to begin with, then the darn things fall apart in just a few months! I’m not putting up with that crap, hence the suspenders. If it had been just one belt, I would think that I had managed to pick a defective one, but none of the belts I purchased the last few years has lasted more than a couple of months. So, am I old, or am I cheap, or am I both, I don’t care. I’m not paying $120 a year for $2 worth of cowhide. I have better things to spend my money on, like more camera gear! I’ll wear suspenders and look like an old fart before I do something that silly as far as buying new belts every few months. 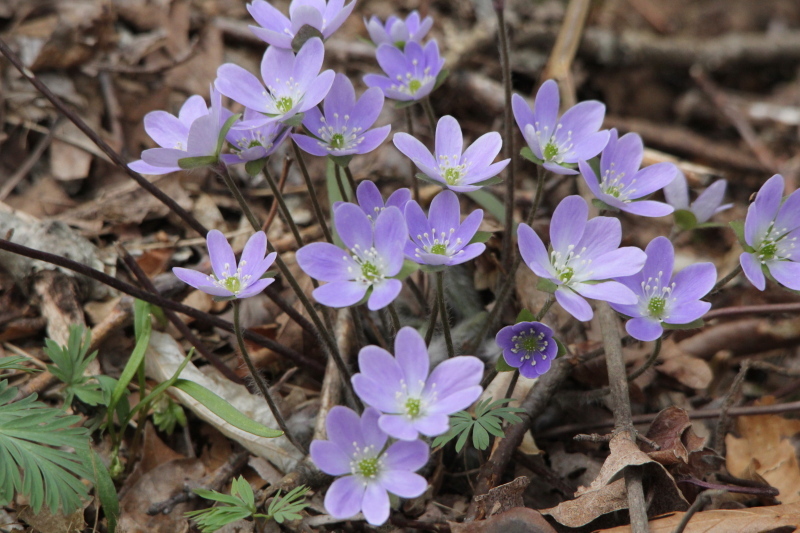 OK, done with that little rant, I said that the weather had been quite nice, it was, nice enough that the crocus have begun to bloom. 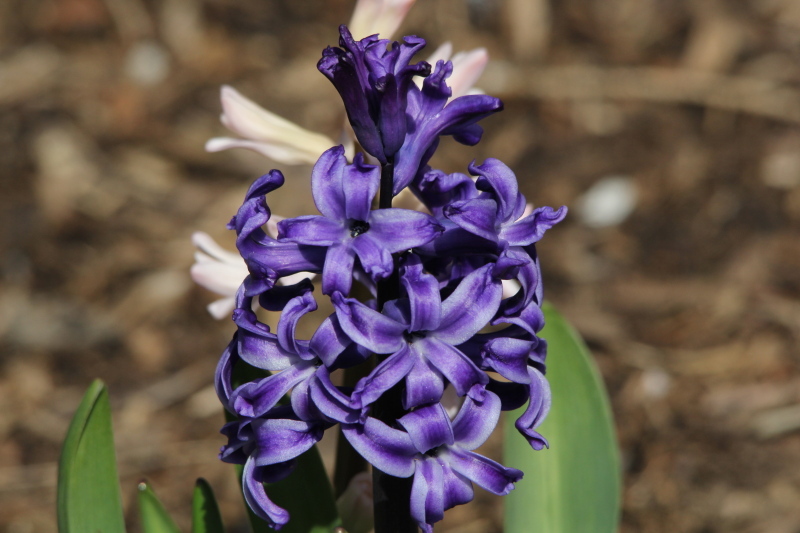 I’m finding that it is hard to be creative with flower photos with the Sigma 150-500 mm lens, but it does do a nice job as far as colors. 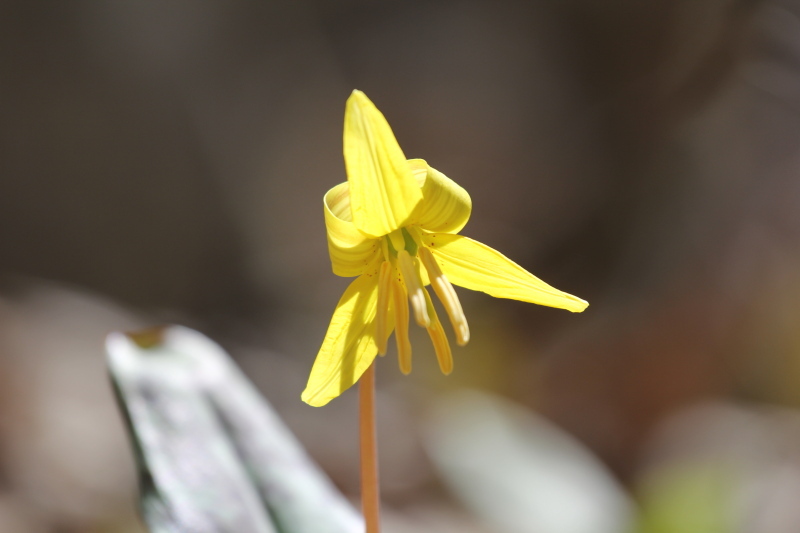 I am hoping to do many more flower photos soon, when more appear, and I’ll have a lens more suitable for that purpose. 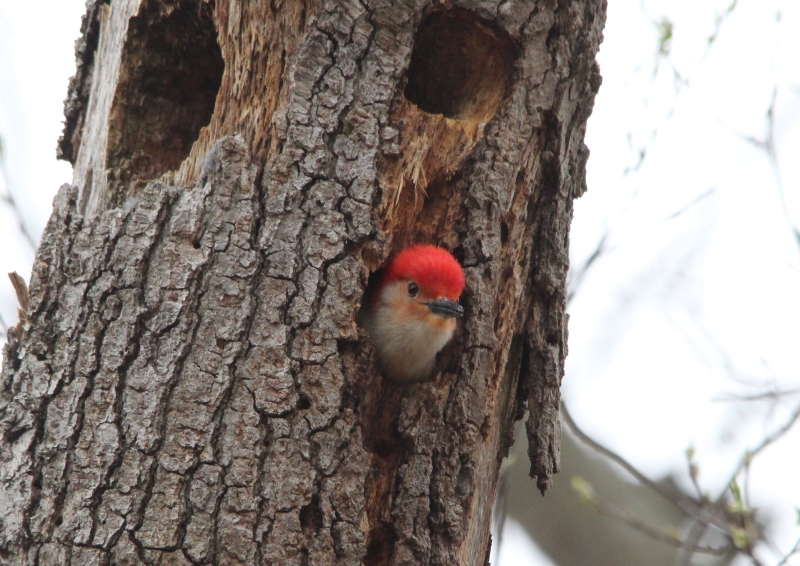 Back to birds, and how to spot new species of them. 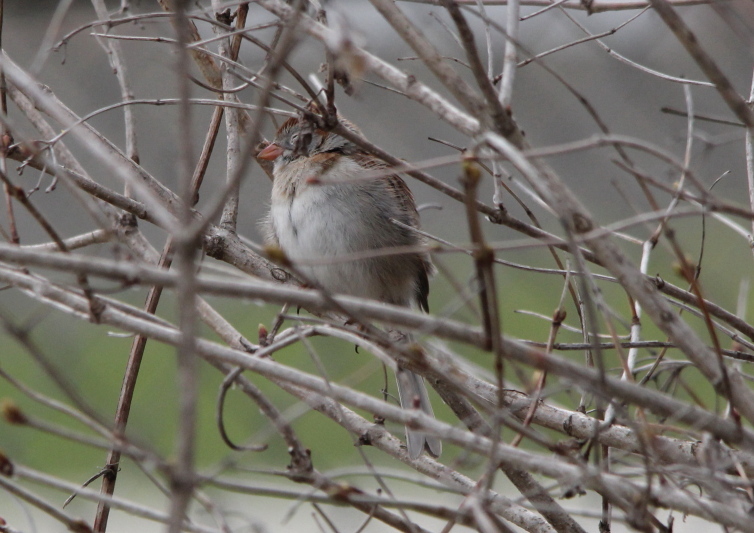 I spotted a chipping sparrow in a bush. 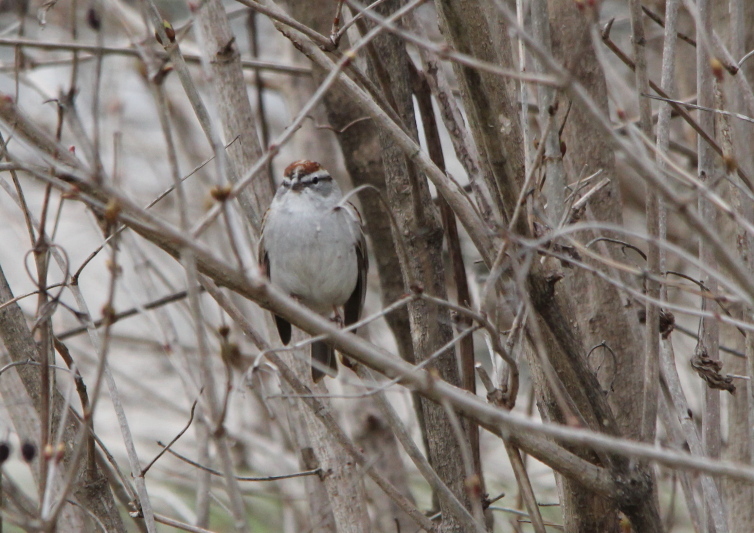 There was another sparrow singing in the same bush that looked very similar to the chipping sparrow, but it wasn’t singing like a chipping sparrow. 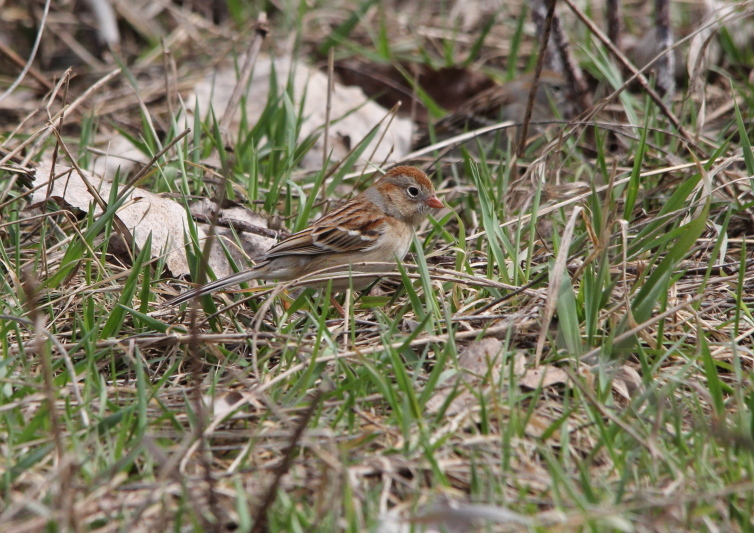 That required further investigation, leading me to see a new to me species, a field sparrow. 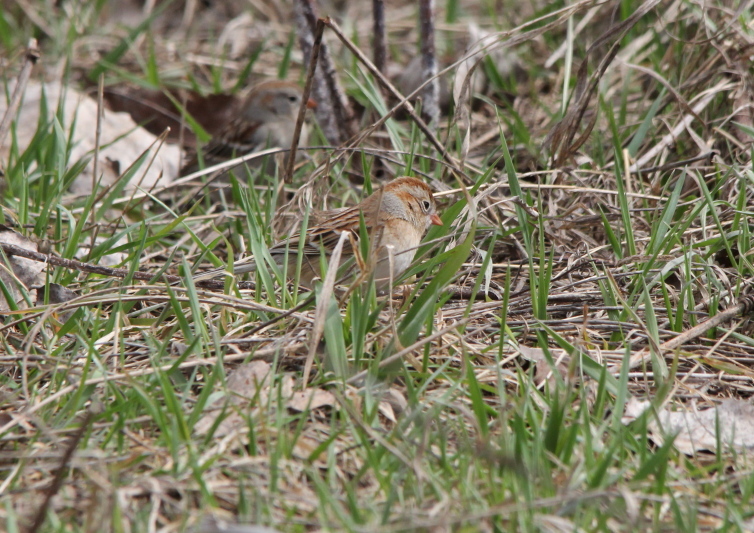 You can see the difference if you look closely, the field sparrow is lacking the dark line on its face that the chipping sparrow has. 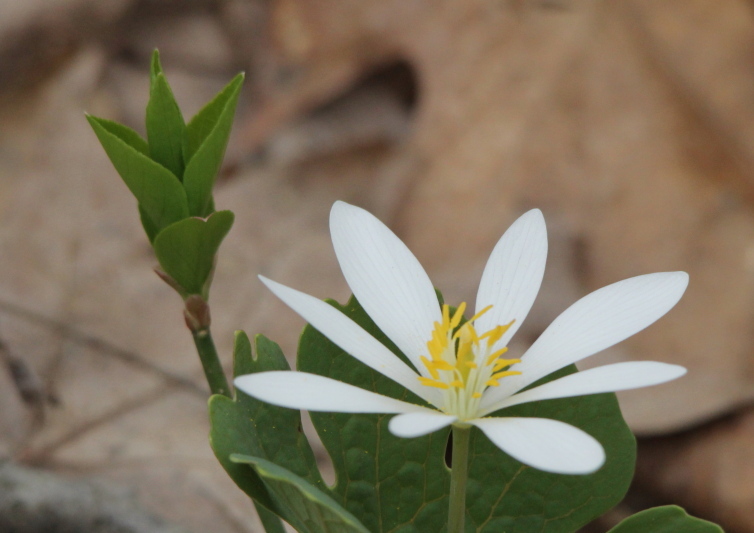 The differences between related species is very slight at times, it really pays to look closely. 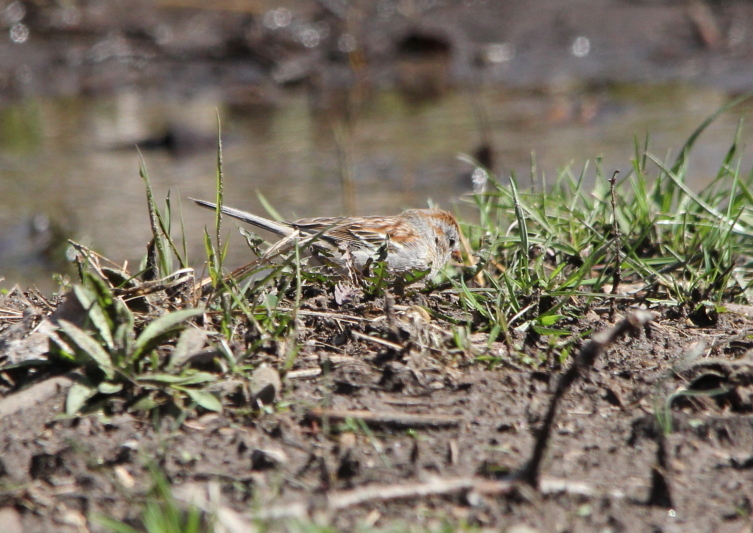 I may have seen thousands of field sparrows before, and never noticed that they were slightly different than the more common chipping sparrows. 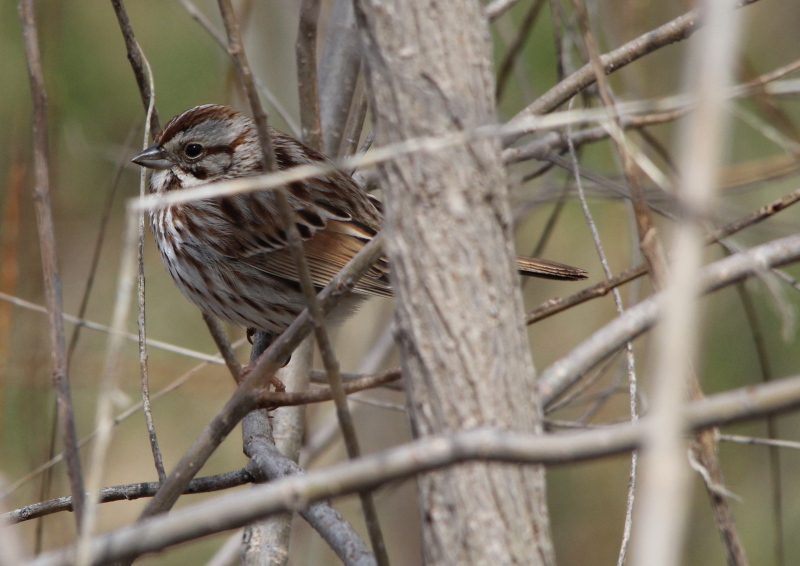 That’s the same thing that led me to “discover” American tree sparrows a couple of months ago. 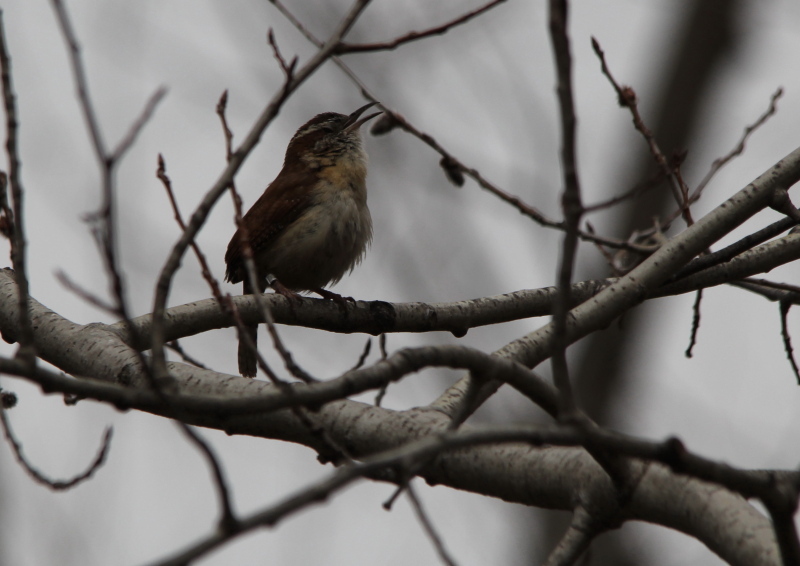 A slightly different chirping sound than the chipping sparrow makes. And I thought that up until now, that I had paid attention to bird songs and sounds, I guess not. 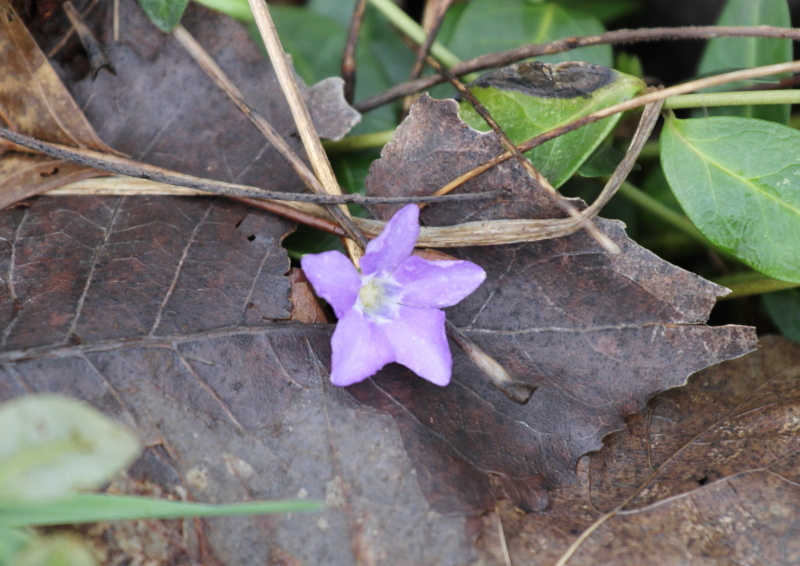 …just to demonstrate how sharp the Sigma lens is! 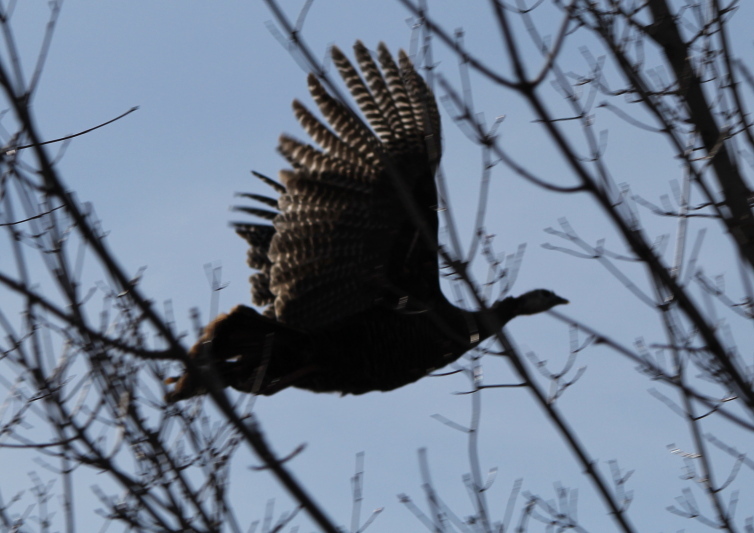 Then, a wild turkey in flight. 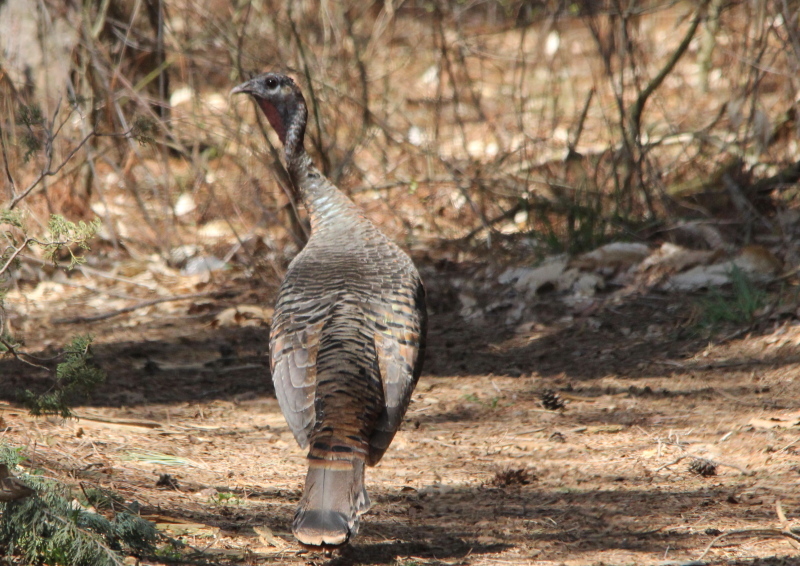 I had spotted the flock of turkeys earlier, and I thought that I would get around to them sooner or later, when the one in the photo came flying at me, and I just had to shoot it for practice. Not bad for shooting through the trees. 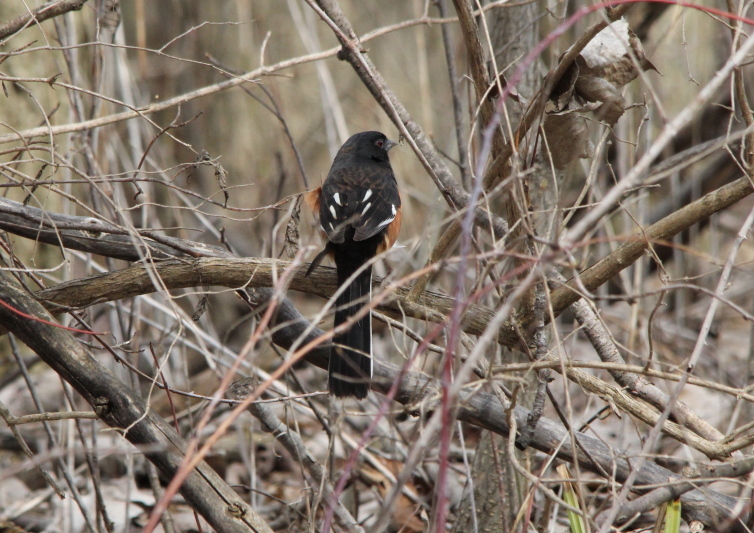 I say I was going to get around to the flock of turkeys, at the time I was busy shooting the towhees. 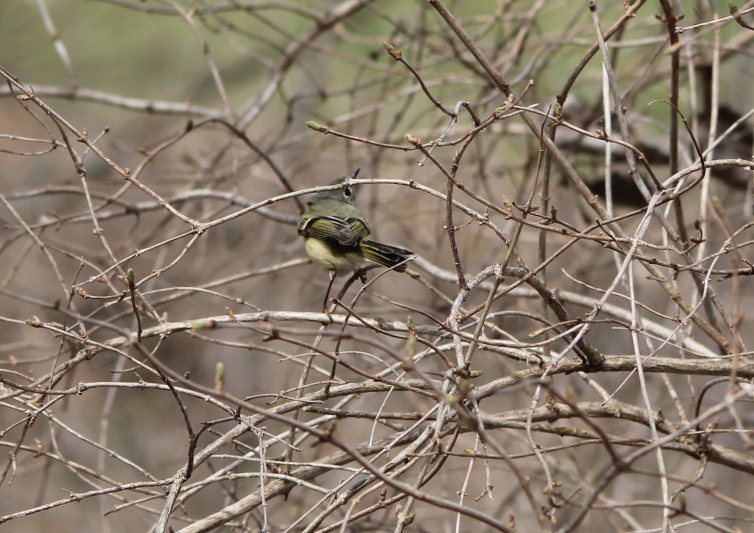 After the turkey flyby, I found this little bugger, a yellow-bellied flycatcher. 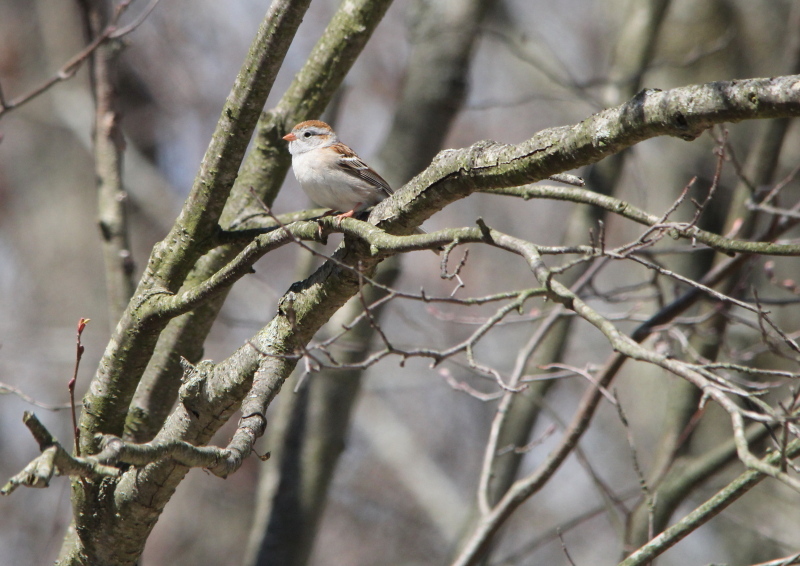 I had the zoom lock of the Sigma lens locked, and couldn’t get it unlocked quickly enough for how fast that bird was, so I shot it with the lens set at 150 mm. 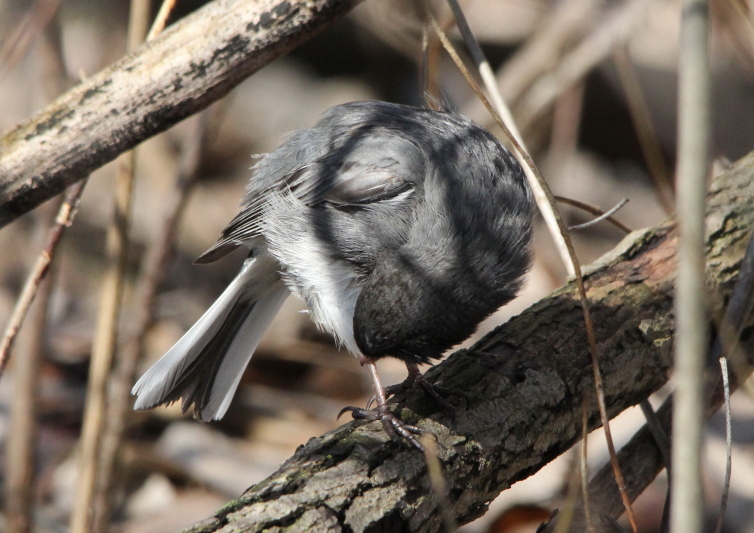 I’m finding that it works better to not attempt to zoom in all the way on smaller birds most of the time, unless it is a junco that’s sitting in one spot while preening after a bath. 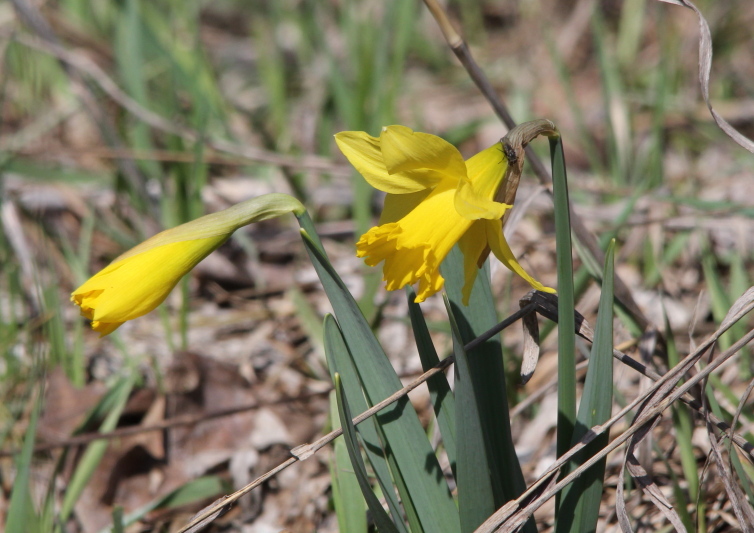 By Tuesday, there were daffodils blooming in the sunshine. 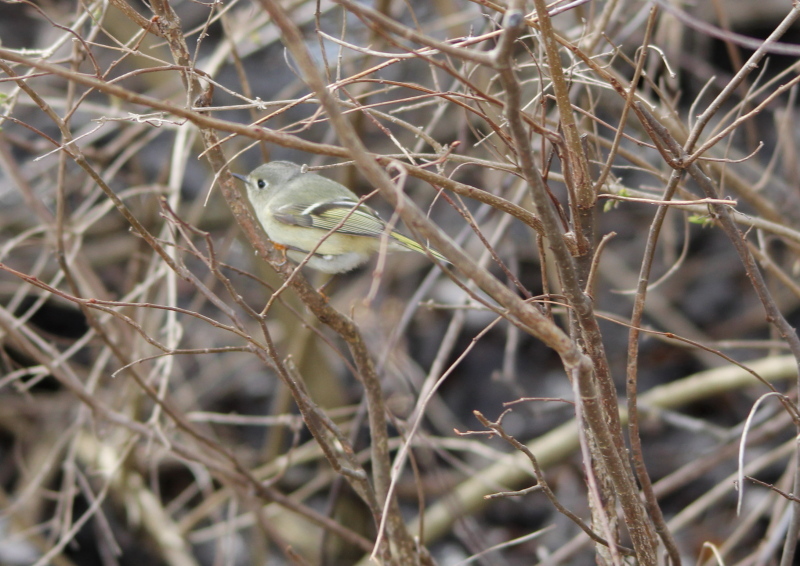 And on Wednesday, I found another new to me species of bird, a ruby-crowned kinglet. 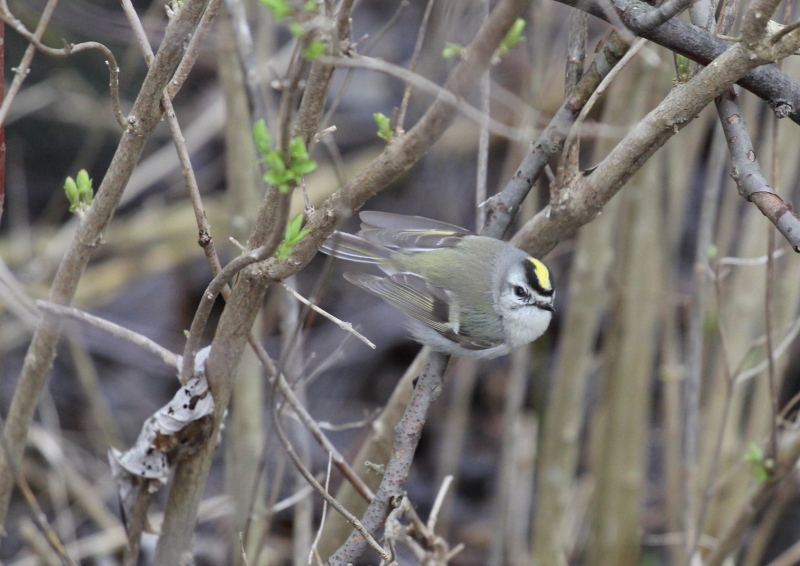 They are just as quick as their cousins, the golden-crowned kinglets, and only slightly slower than an electron in orbit inside of an atom. I never did get zoomed in all the way on that little bugger, nor did I catch him fully displaying his red crown, although that’s how I spotted him in the first place. 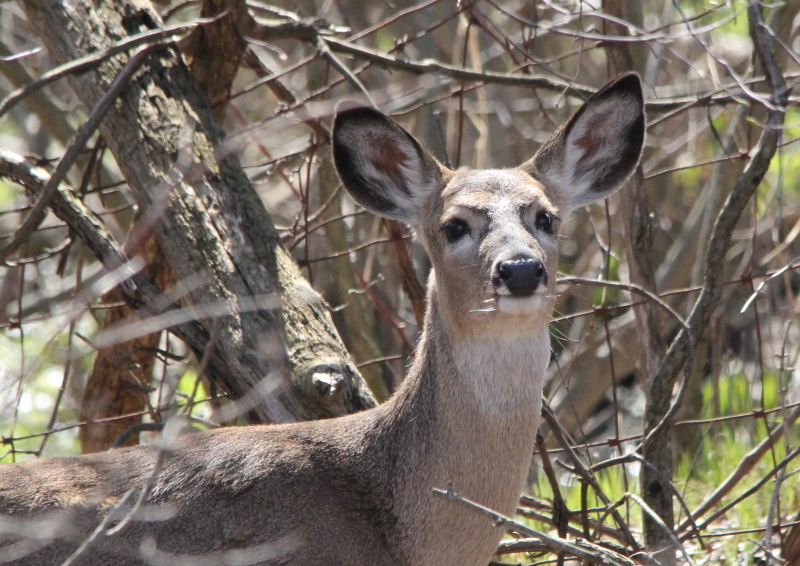 I also see deer about weekly around here. 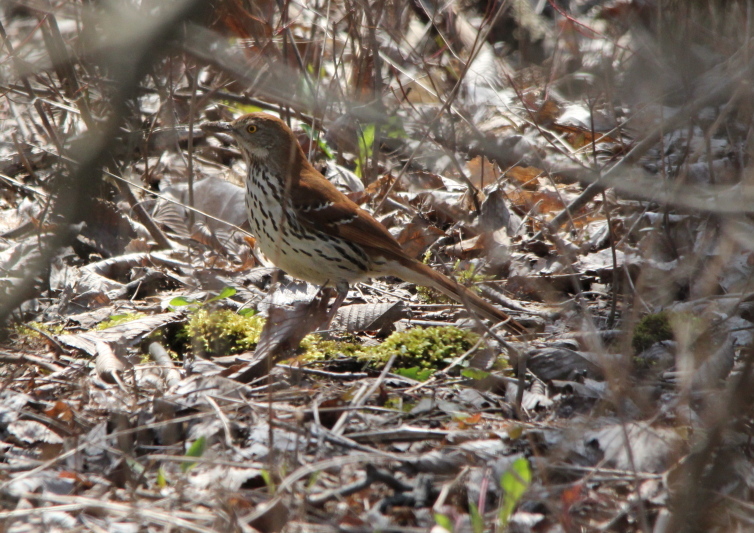 And, one of my favorite species of birds, the brown thrashers have arrived for the summer. 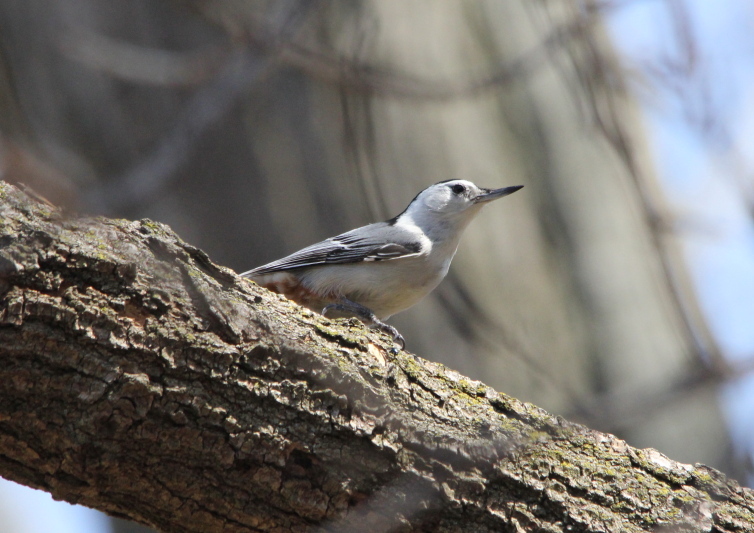 They are related to mockingbirds and catbirds, and sing in a similar fashion, unstructured songs that can go on and on, unless some jerk with a camera frightens them off. 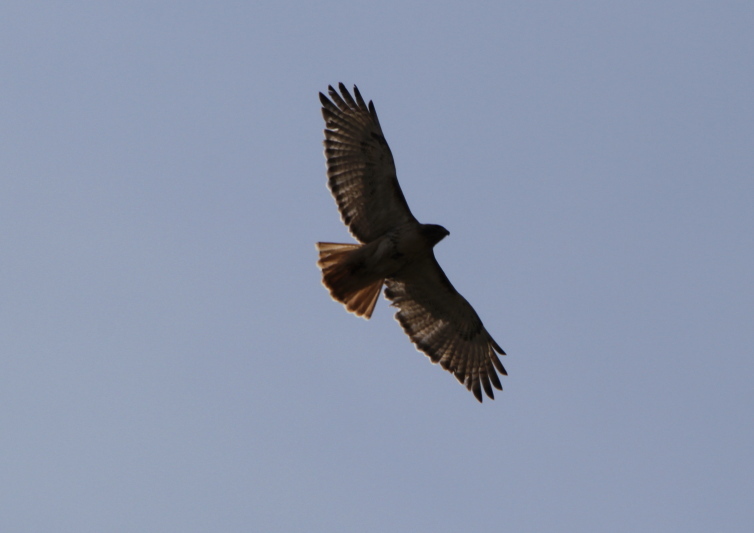 More good news, I’m making friends with another pair of red-tailed hawks. 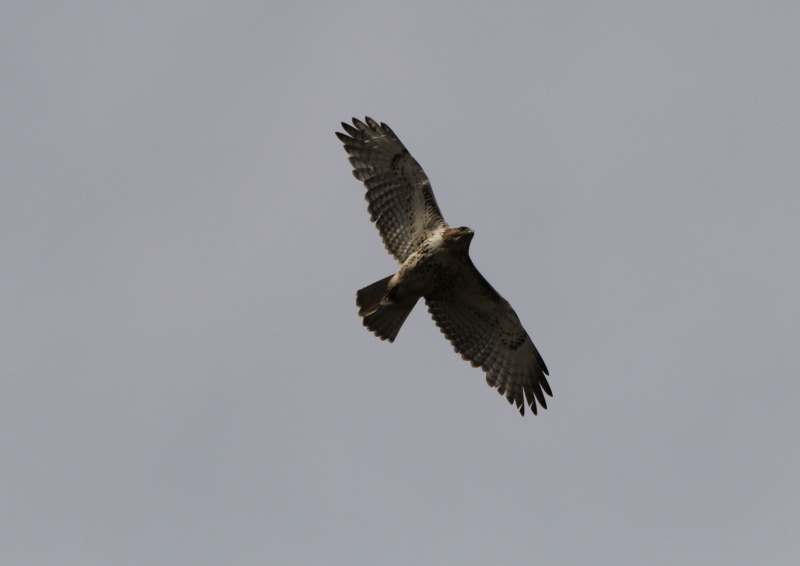 You can see that there are two different hawks in the photos, one is missing a few tail feathers. 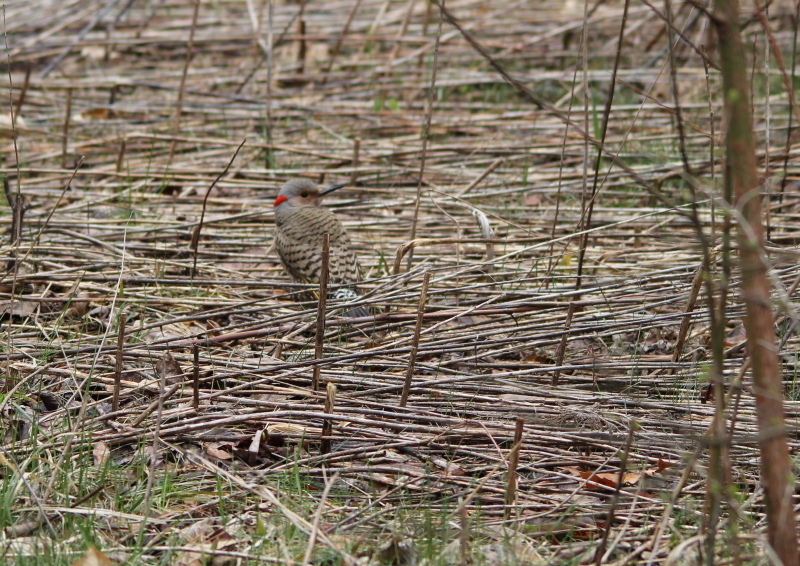 I assume that it is a mated pair, as I see them hunting together very often. Well, that brings me up to Wednesday afternoon. The weather forecast for the rest of the week isn’t looking good, and the clouds rolled in today as you can see in the hawk photos. So I don’t know how many photos I’ll get the rest of this week. Next week, I’ll start doing the My Week series in its old format, jotting down notes on each day’s walk. Well, the heavy rains came late yesterday afternoon into this morning. There are many areas of localized flooding, including the state highway that my place of employment is on. I had to take a detour with the truck last night to get to the shop, and then again to get home. There was a break in the rain for a while this morning, looking at the radar online, I thought that I could get an entire walk in before the next squall line hit, almost. Since I knew that there was the possibility that I would get caught in the rain, I took the Canon 70-200 mm lens with me today. I haven’t posted many photos taken with that lens, as quite frankly, none of them have been very good. Not what I would expect from a Canon L series lens. Here’s a couple from today. 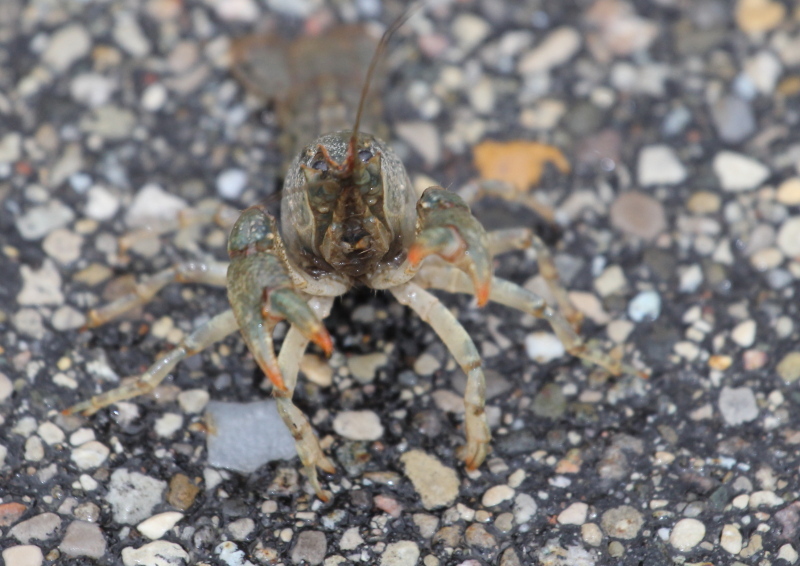 The last two beg the question, why do the crayfish cross the road? I have no idea, but there were several of them on the road through the park that I walk in everyday. Maybe it’s because of how saturated the ground is everywhere? Anyway the last two were also taken using the flash, and should have been much better than they are. So, since I was going to pick up the last lens for my kit today anyway, I brought the 70-200 mm back to the store. We played with it and their demo lens, and their lens seemed at least a bit sharper. I ended up exchanging the lens I had purchased for a new one to see if that will perform any better. Of course, I also grabbed the EF S 15-85 mm lens as well. I have shot a couple of indoor shots with it, and it looks like a winner so far. I hated exchanging the 70-200 without knowing for sure if there was something wrong with it or not, but how does one know for sure? The Sigma is producing photos that have exceeded my expectations, it is an excellent lens, without out any qualifications. Throw in the fact that it is relatively inexpensive as a bonus rather than a qualifier. I should explain that better. I have seen many comments in other places to the effect that the Sigma 150-500 mm lens is an excellent lens for the money. In my humble opinion, from what it has done for me so far, you can drop the “for the money” part of those comments and just say that it is an excellent lens. 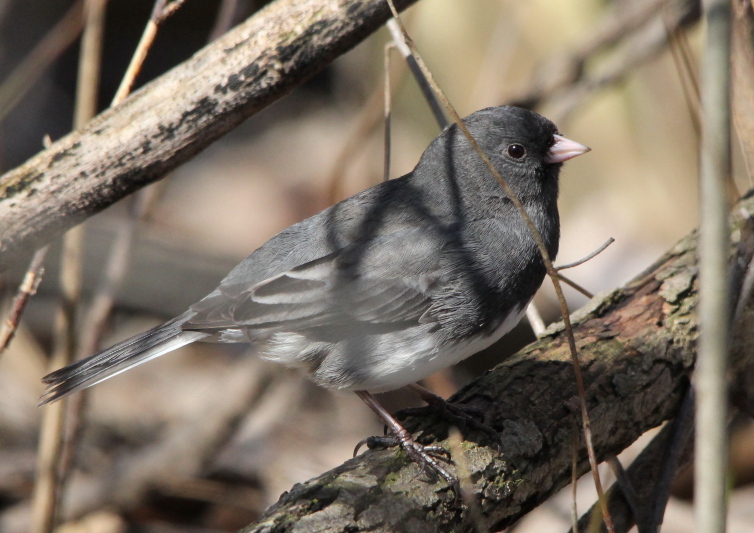 I look at the junco shots and I can’t believe how sharp that they are. A 500 mm Canon L series lens may be sharper, I can’t tell you that, but at almost ten times the price of the Sigma, it better be sharper than the 70-200 that I have. 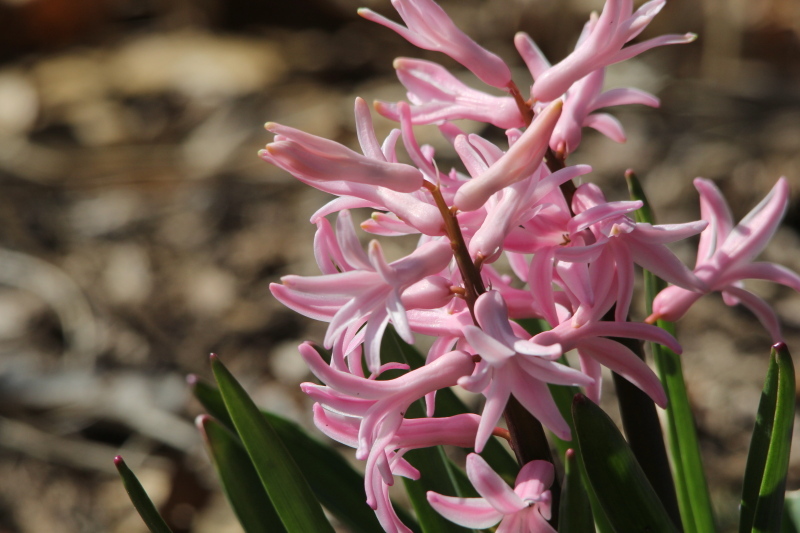 A Canon L series lens should at least produce photos of equal quality, but the first 70-200 hasn’t done that. 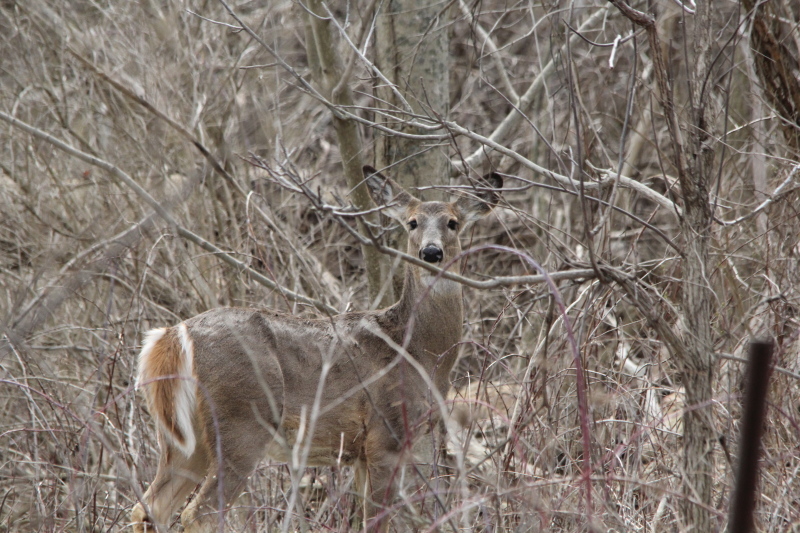 In fact, the photos it produced were not much if any better than the Nikon 70-300 lens I was using. We’ll see how it performs outdoors tomorrow, along with the new 15-85 lens. With all the rain that’s been coming down, I am going to have a hard time finding someplace to hike this coming weekend, and maybe a hard time getting around anywhere due to roads flooded or washed away. The county park that I visit often on weekends will be under water, I’m sure of that. 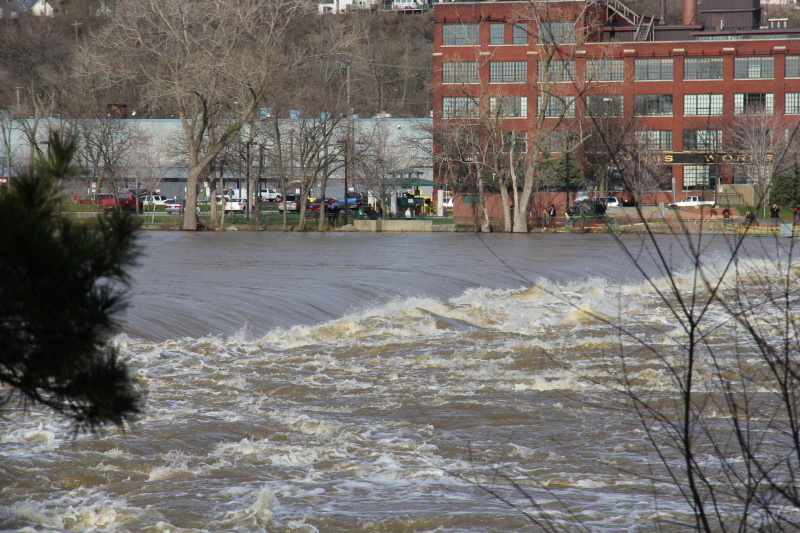 Buck Creek flows through that park, and the city that surrounds that park has declared a state of emergency due to the flooding along Buck Creek, and the Grand River, which is where the creek ends up. 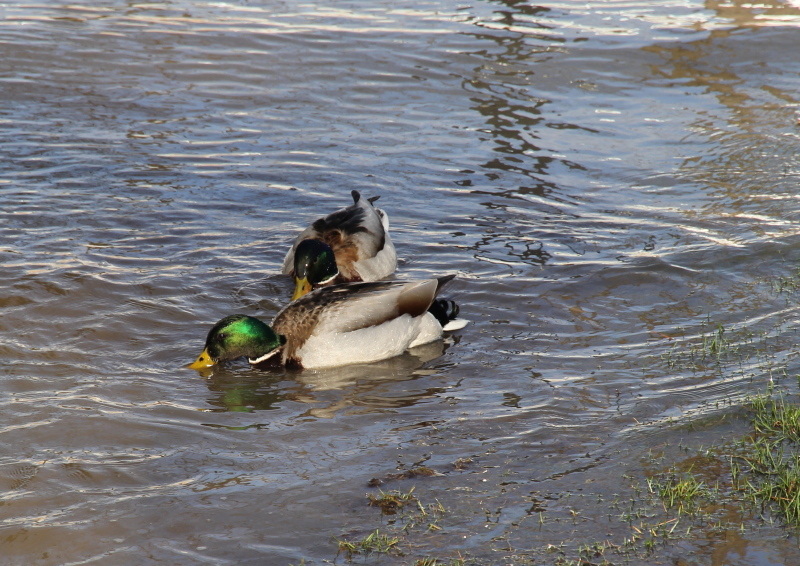 Parts of the Muskegon State Game Area were already under water last weekend, it will be worse this weekend. I’ll figure something out by Saturday, I hope. A few more words about my walk today, as always seems to be the case just before a storm hits, the birds and other critters were very active as I was walking, but it was so dark and gloomy that any photos would have been junk if I had bothered to stop and take any. Besides, 3/4 of the way through my walk, I heard thunder rolling in the distance, and didn’t want to get caught out in the open in a thunderstorm. I don’t mind getting wet, but I would prefer to not be struck by lightning. I’ve had one close call, that’s enough for this wimp! I’m going to start today by posting a snippet from the local weather forecast. I guess that it means the drought we suffered last year is over. As is so often the case it seems, droughts end with torrential rainfall causing flooding. However, there is an upside to all this rain. The heavy rain over the past week has boosted the water level of Lake Michigan by a whopping 3 inches in just the past week. Since each inch represents 390 billion gallons of water, that’s an increase of 1.17 trillion gallons of water on Lake Michigan in just 7 days! 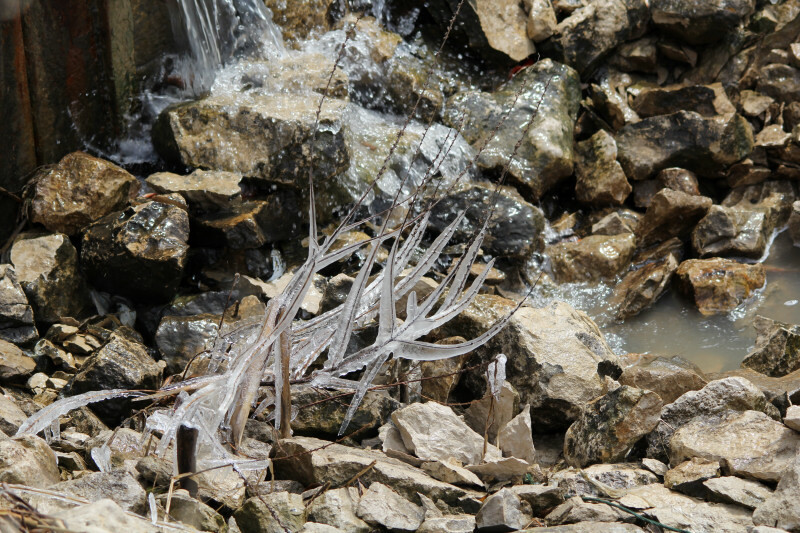 With the Great Lakes at near record lows, that’s a good thing! Now then, for my walk today. It was cloudy, cold, with a gale out of the west driving intermittent snow/rain squalls through the area, a great day to test out new lenses, NOT! But, I did anyway. I took the replacement 70-200 and the new 15-85 lenses with me today. It’s funny, even though the Sigma is a pain in the shoulders to carry, I have already developed so much confidence in that lens that I hate walking out the door with it, even on a nasty day like today. 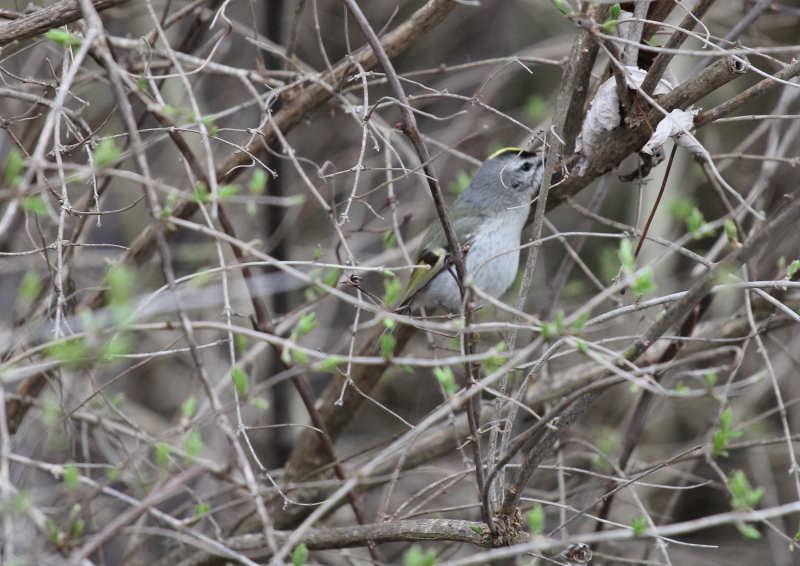 I started out with the 70-200 lens on the camera, a good choice, for I had just reached the walking trail when I ran int a flock of Golden-crowned kinglets to play with for a while. These aren’t very good shots, but I think that they illustrate how difficult it can be to get a photo of one of these little buggers. It’s hard to tell from photos taken under such horrible lighting, but I can see a marked improvement in both the sharpness and color with the replacement lens over the original. I can’t wait to see what this lens will produce with some light! I considered boosting the ISO up to 800 or so, but that wouldn’t have been a true test of the replacement lens versus the original. Come to think of it, I did that with the original lens, and it didn’t seem to make a difference. 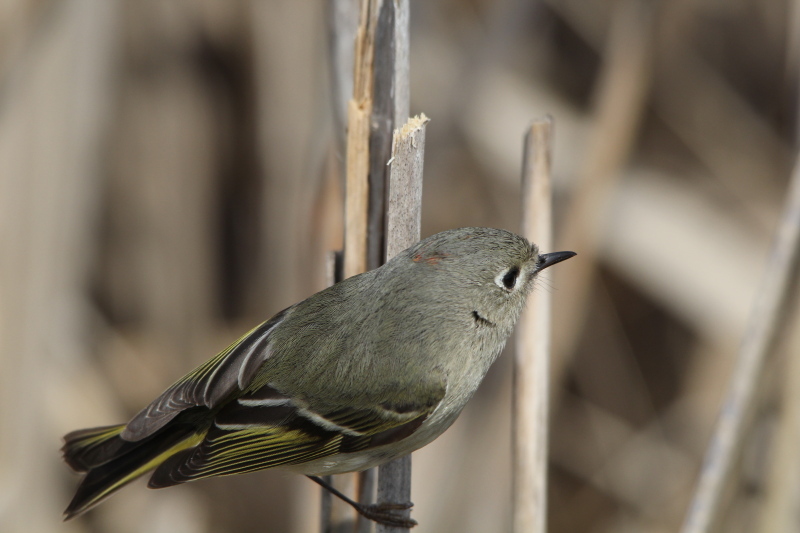 I will say this, the 70-200 lens is much easier to use as far as following small birds like the kinglets around in the brush. They never really sit still, even when they are perched for a few seconds, they are still moving, twisting their head and body around looking for their next meal. 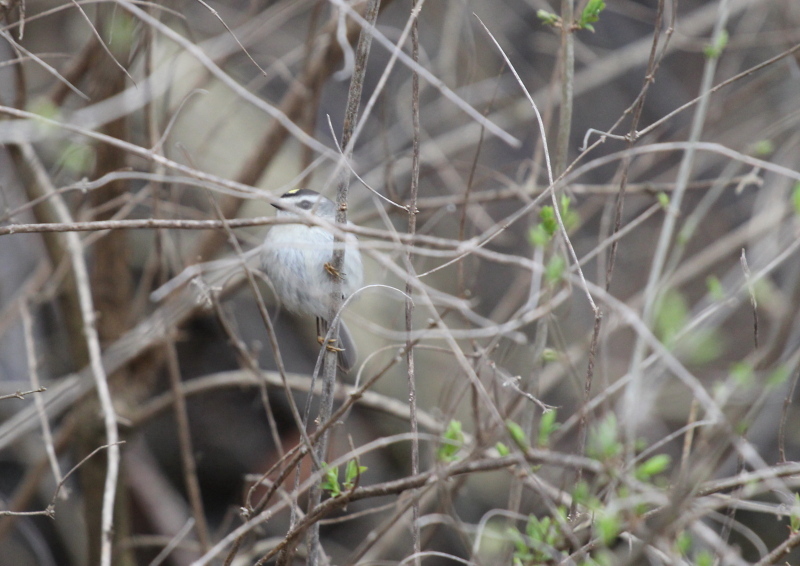 I’ve found that I never have the time to take full advantage of the Sigma’s longer length anyway, and the 70-200 is so much easier to swing around, and even keep the kinglets in the viewfinder as they flit from branch to branch. 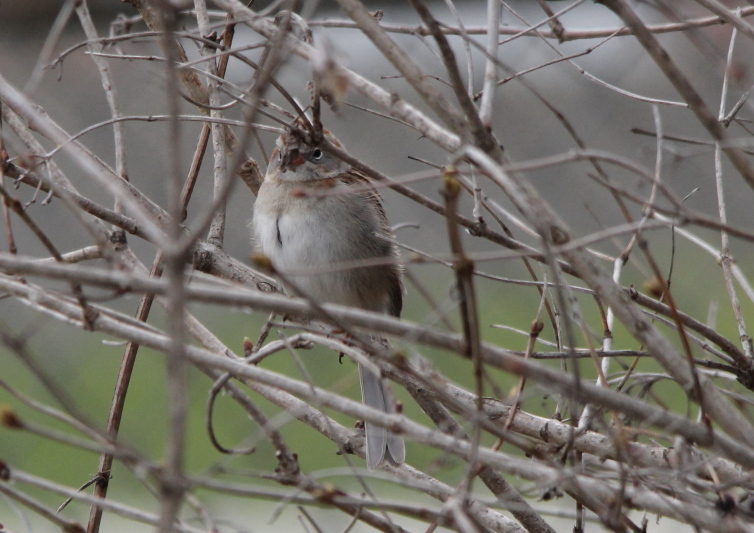 I got several photos of them doing that, moving around in the branches, but there was so little light that the birds are just blurs. I do see possibilities though. 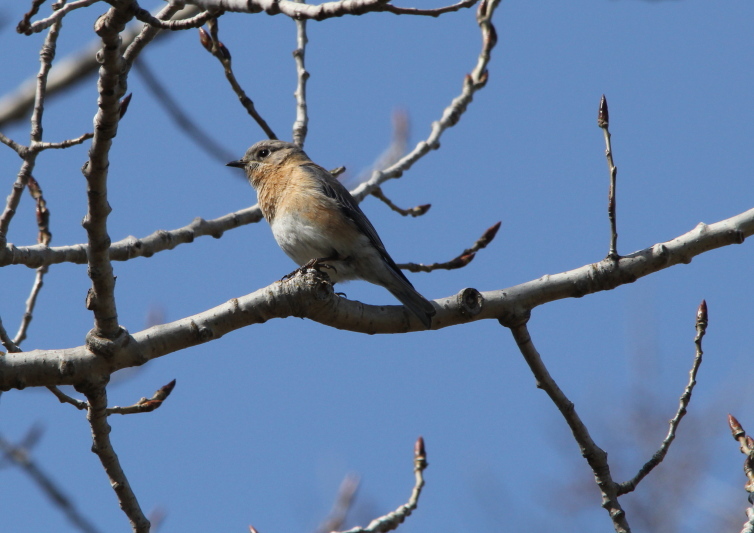 This next shot of a female bluebird was a test of one of Canon’s features, you can use manual and auto-focus together while the camera s set in one shot auto-focus. 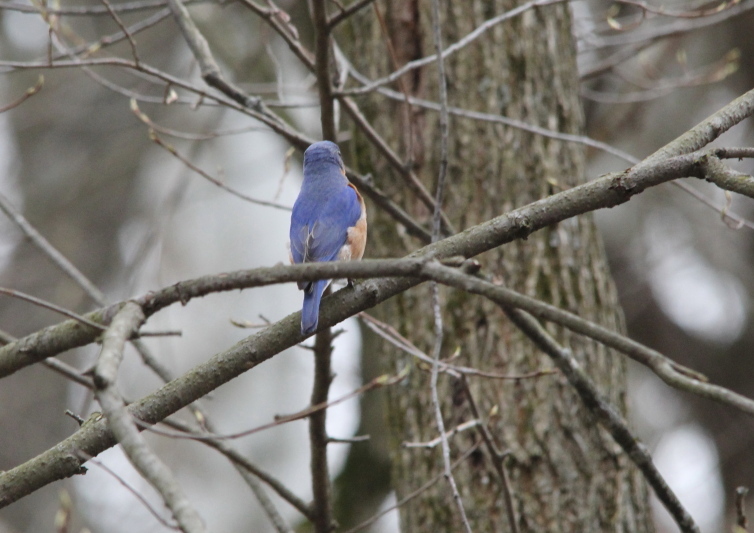 The bluebird was too far away, in so little light that the auto-focus didn’t lock in precisely on the bird. 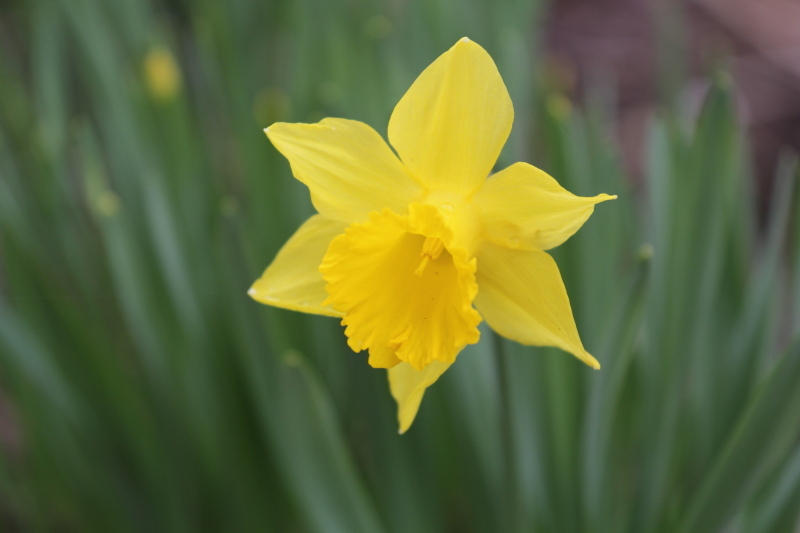 I was able to tweak the focus using the manual focus ring for this shot. I wanted to try out the 15-85 mm as well, but I “discovered” a problem most of you may be familiar with, how do you change lenses in terrible weather conditions? I didn’t want to expose the inner workings of the lenses or camera to the wind and precipitation, so I had to go looking for a somewhat sheltered area to make the change. I knew that any further bird shots were probably out of the question, as I wasn’t about to switch lenses a second time in that weather. With no dramatically beautiful landscape opportunities, I made do with what there was, the park that I walk in. Everything the same but at 85 mm. I’m really happy with the zoom range of that lens, but I can tell that I am going to have to relearn landscape photography from the ground up. 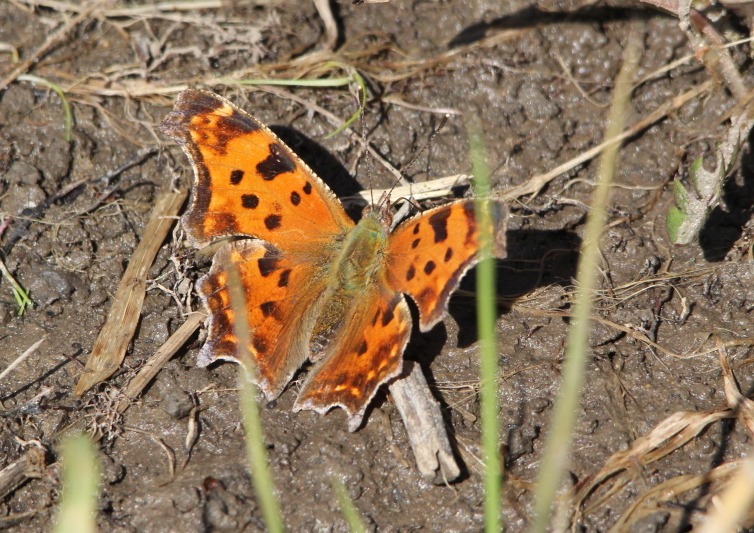 And, given the weather conditions, I’m really happy with the lens’ performance as well. 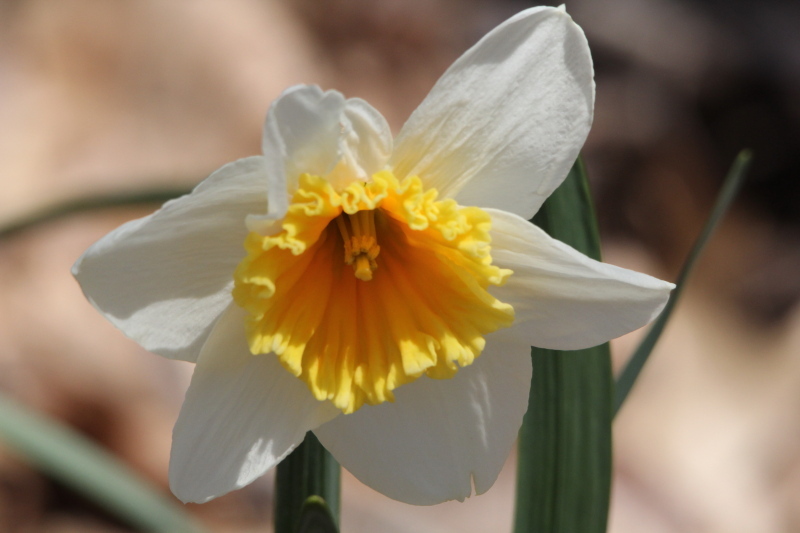 Especially after seeing this shot of a daffodil. 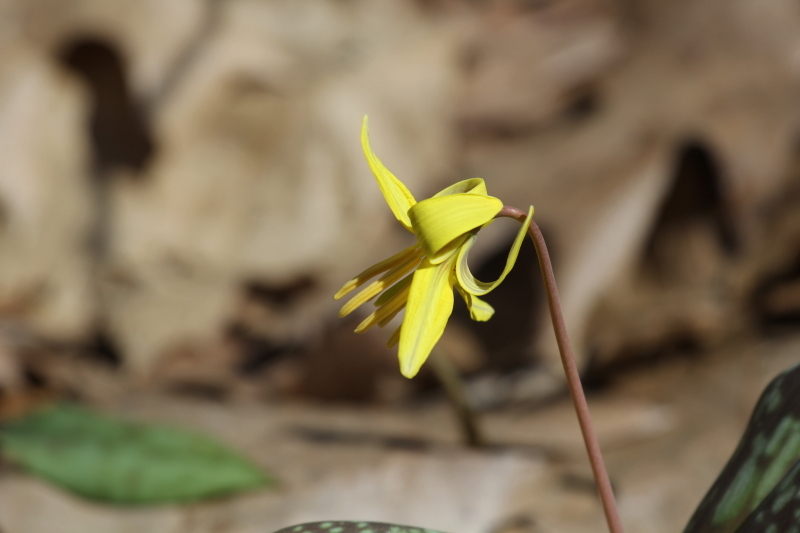 In this small version, it’s hard to see the level of detail captured as far as the stamen of the flower to the left, which is what I focused on, but believe me, it’s there. I think that I picked a winner in this lens, between the zoom range and the fact that it will focus down to 1 foot and almost function as a macro lens. Now all I need is some sun to verify that. So much for Friday, I’m still not sure what I am going to do, or where I am going to go tomorrow. I thought about taking a scenic drive to test out the new 15-85 mm lens, but it makes no sense to do that this time of the year before everything greens up for spring. Even though American Avocets have been spotted over towards Muskegon, I have decided to stay around home today. For one thing, it was miserable driving last night for work. 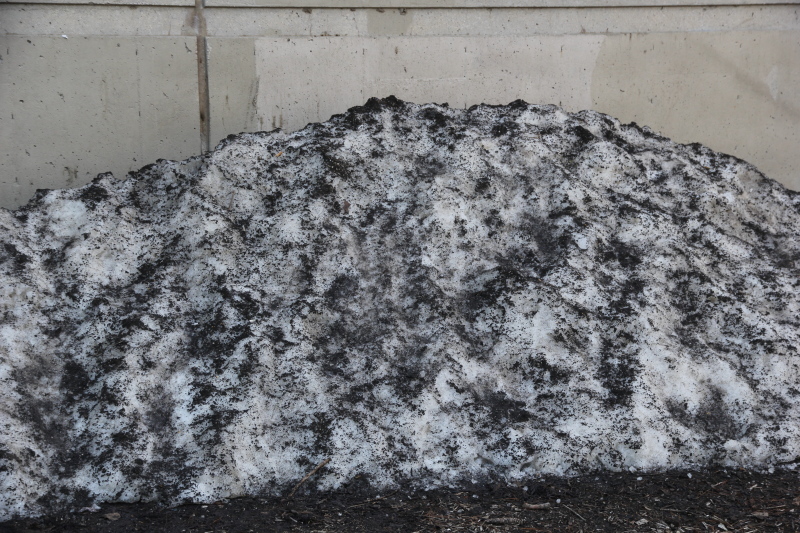 That’s right, a snowstorm in April, the second half of April. I woke up this morning to what I thought was sunshine brightening up my apartment, but when I looked out the window, I saw that it was actually cloudy outside, but it seemed brighter than normal because of the light reflecting off from the snow covering what isn’t flooded. OK, there isn’t any real flooding just outside my apartment, but I don’t have to go very far in any direction to find flooded areas. 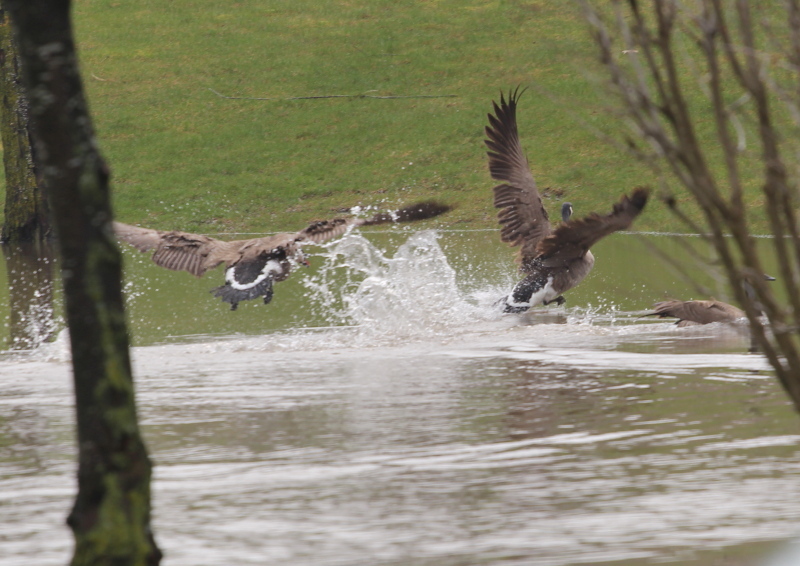 Several friends have been forced out of their abodes due to the flooding. Here’s another snippet from the local meteorologist. Then we get snow, I sure titled this post right, “Now what” is right. I’m fooling around waiting for the sunshine promised in the forecast for today to make an appearance. I’ll work on my camera bag to get all my new lenses to fit while I’m waiting. I think that I can make the one I have worked temporarily, but I’m afraid that I really need a larger one. Well, today was good exercise, and another learning experience, I’ll say that. I waited until almost noon, ate lunch instead of breakfast, then did my walk, most of the time it was snowing. Of course now that I’m typing this, there’s some sun, isn’t that the way it always goes? I tried to make the best of it, but I wasn’t able to give either the replacement 70-200 mm or new 15-85 mm lenses a true test. 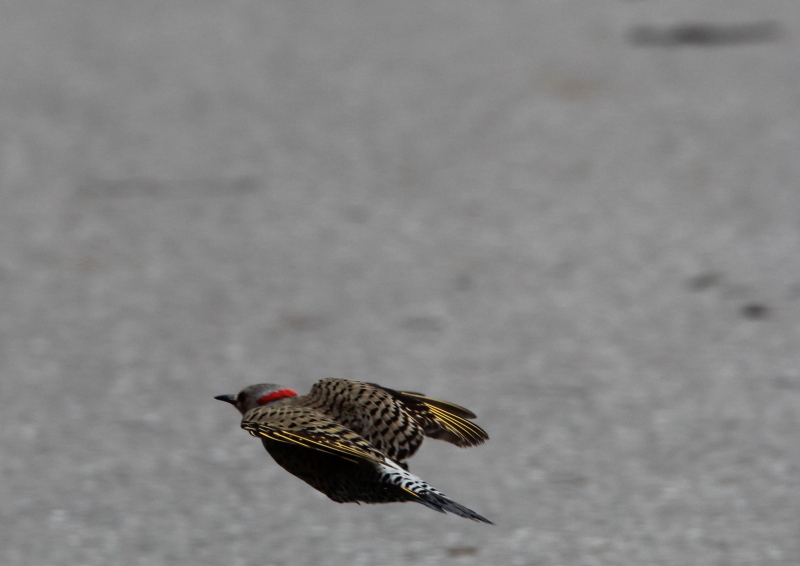 I did give the Sigma a light workout, starting with a northern flicker that I was able to sneak up on. It spotted me, and tried to escape. 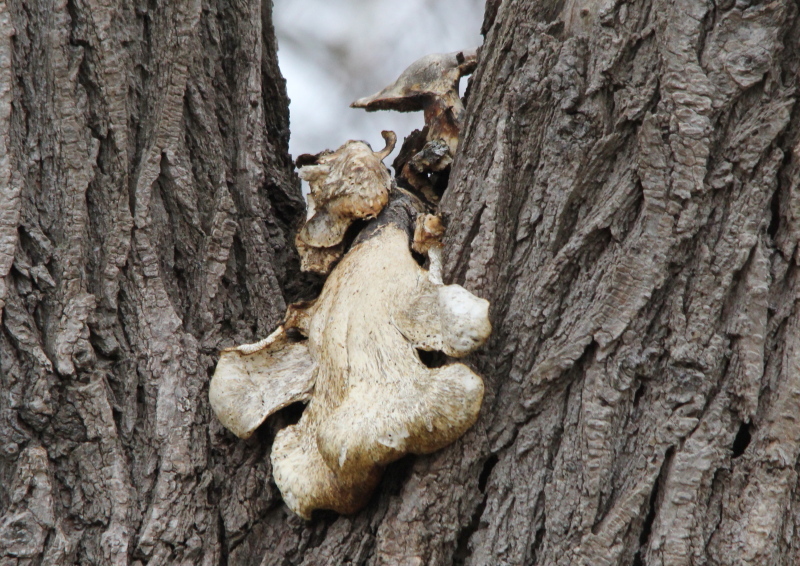 Then, to prove that birds aren’t the only thing I shoot, I found this fungus growing 40 feet up in the crotch of a tree. But, it was soon back to birds. I really like the way that I am able to pick birds out of the brush with this new combo, not to mention how sharp my photos are now. Well, for the most part. 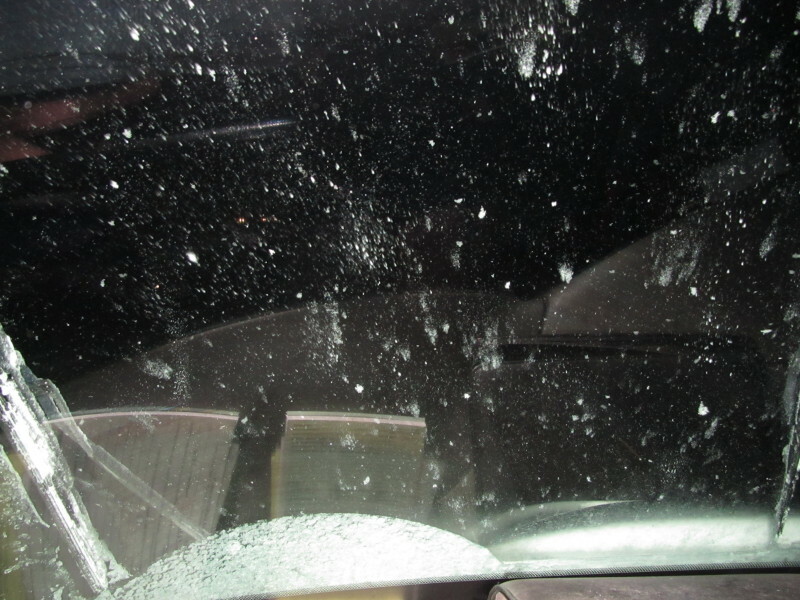 Here’s one that isn’t great, but it does show the snowflakes blowing past the grackle. 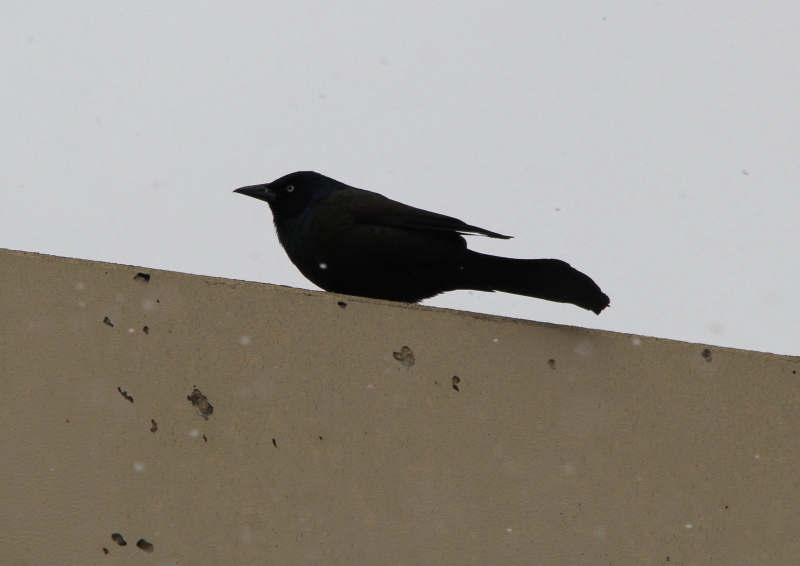 Common grackle watching the snowflakes blow past it. 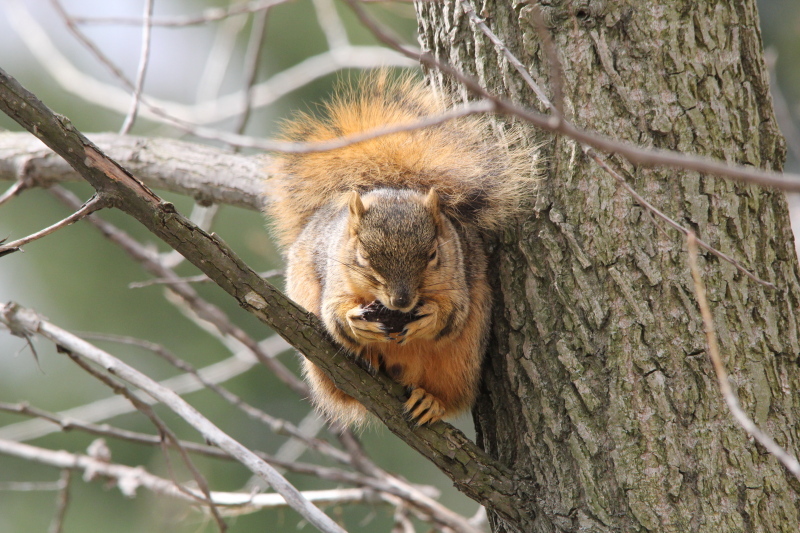 There were a few pockets of sunshine, each lasting all of ten seconds or so, during one of which I caught this fox squirrel eating its lunch. 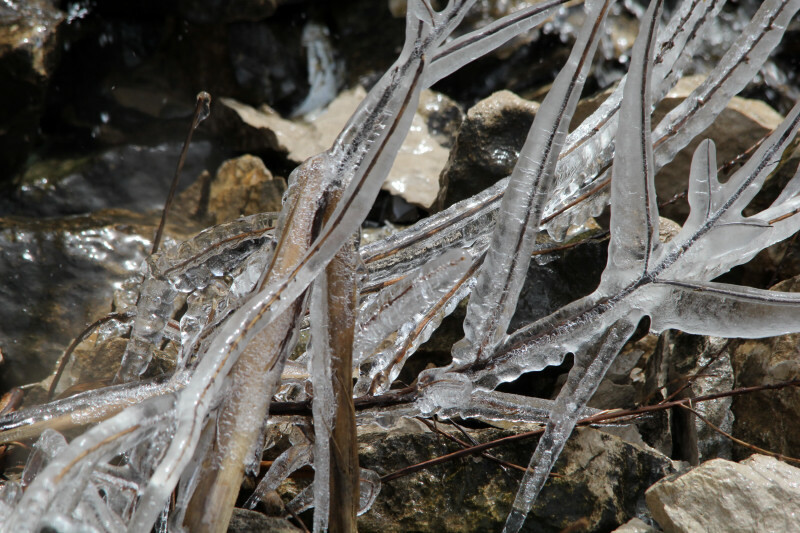 During another all too brief patch of sunshine, I shot a couple of ice photos. But in the thirty seconds or so it took me to walk from that point to along side the pond that the stream flows from, the clouds had rolled back in, just in time for this. 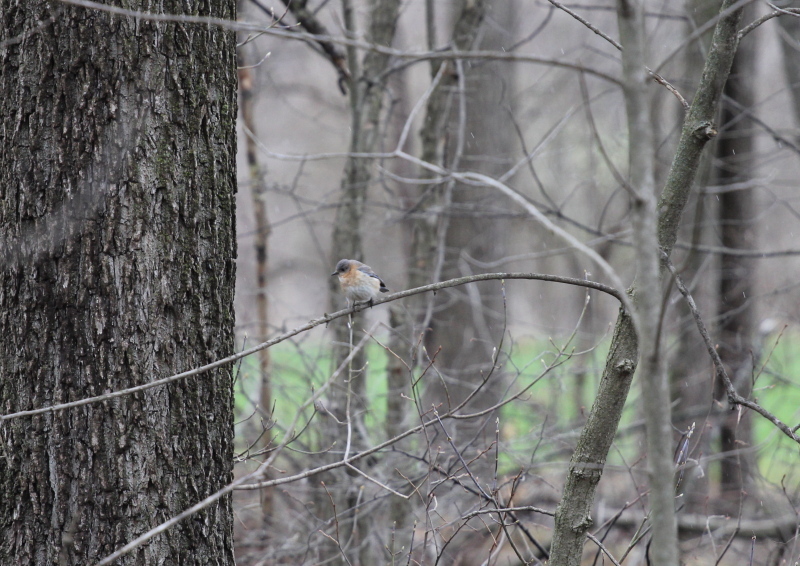 I forgot to switch the image stabilization to the proper mode, and it shows. 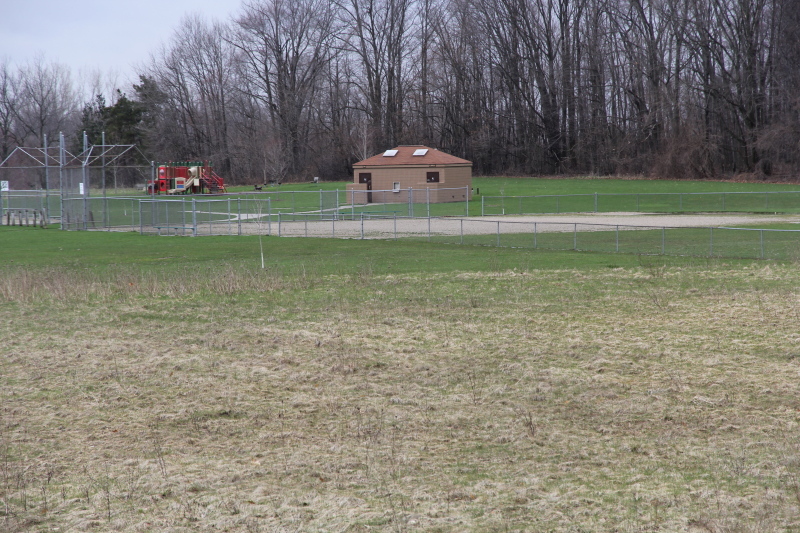 On top of that, for all but the first shot in the series, I was shooting through a chain link fence, silly me. Sorry, I’m more than just a little bummed out. I really was looking forward to trying out all my lenses today, but the weather just will not cooperate even a little. Along with the nearly constant snow falling, the wind was very strong out of the west, and it was cold, as you can tell because of the ice photos. Not only did that limit possible photo subjects, but I couldn’t see switching lenses and risking getting moisture in the inner working of my new equipment just to shoot something to say that I shot it, since any photos wouldn’t have been very good anyway. I know that I’m whining about the weather a lot, but it’s been bad for months now, and I’m tired of getting one nice day a week if we’re lucky. The second half of winter was much colder, snowier, and cloudy than average. Now, we’re receiving record rainfall and near record flooding. And, just to rub salt into the wound, there’s a good chance that we’ll set a record low temperature for the day. It’s all this guy’s fault! We’ve had crappy weather around here ever since he predicted an early spring! 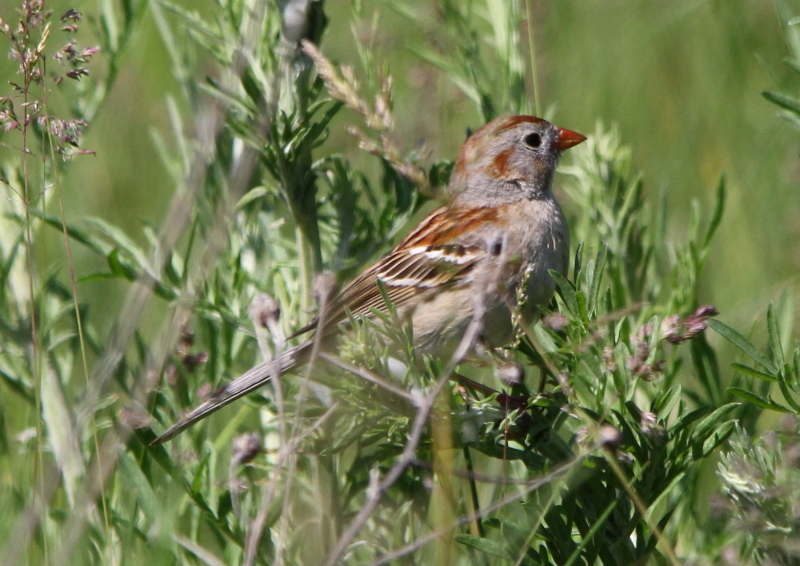 The Field Sparrow is a small sparrow. 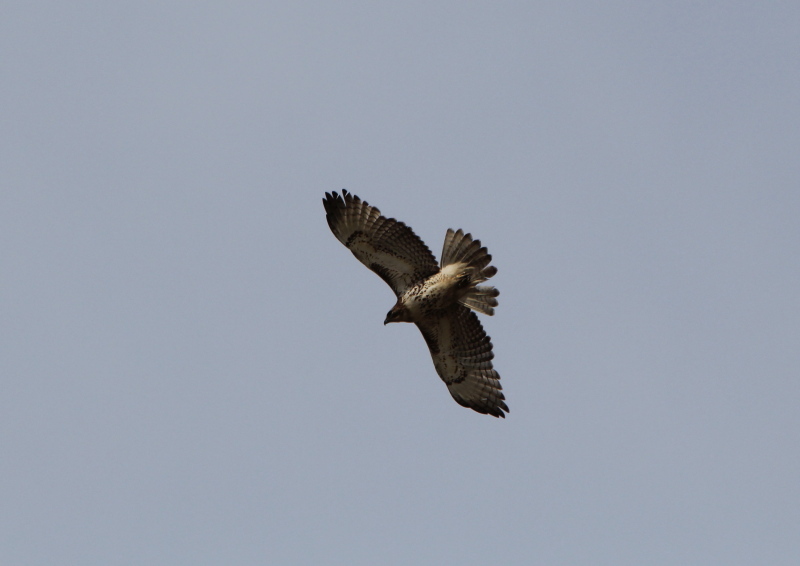 Adults have brown upper parts, a light brown breast, a white belly, wing bars and a forked tail. 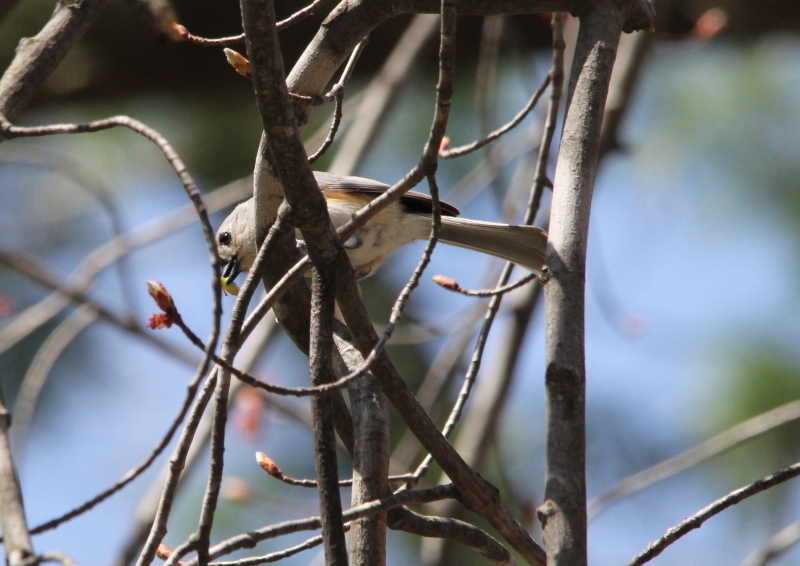 They have a grey face, a rusty crown, a white eye ring and a pink bill. 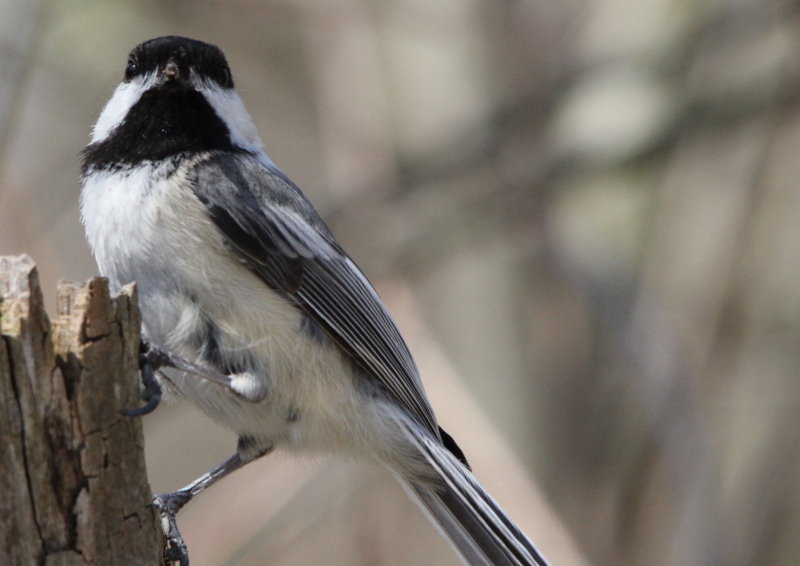 The male sings from a higher perch, such as a shrub or fencepost, which indicates his ownership of the nesting territory. The song is a series of sad whistles ending in a trill. 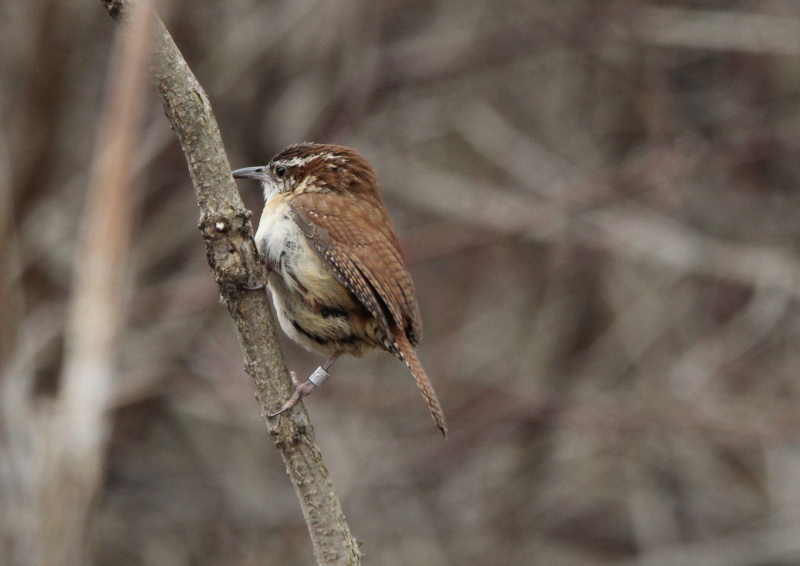 This bird’s numbers expanded as settlers cleared forests in eastern North America, but may have declined in more recent times. This is number 89 in my photo life list, only 261 to go!